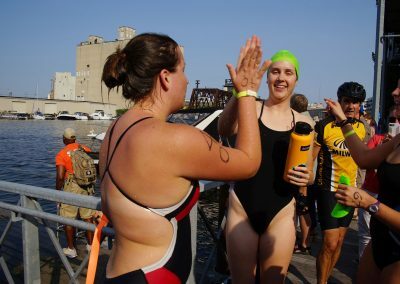 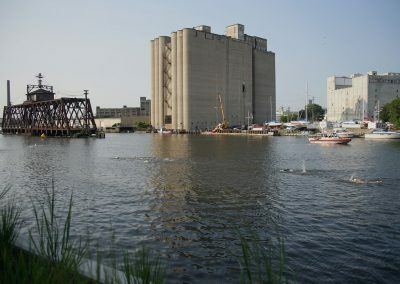 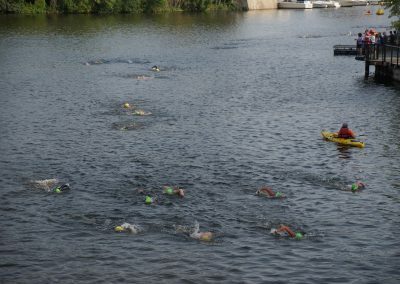 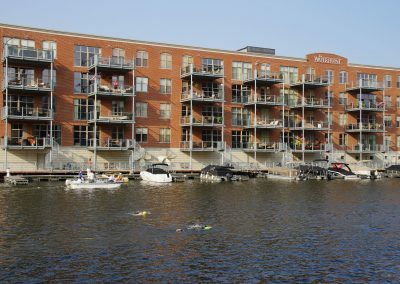 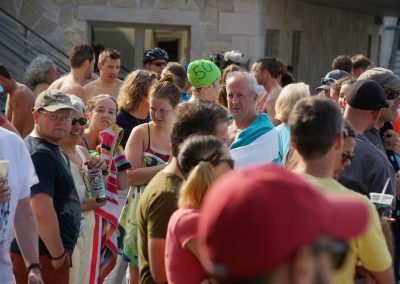 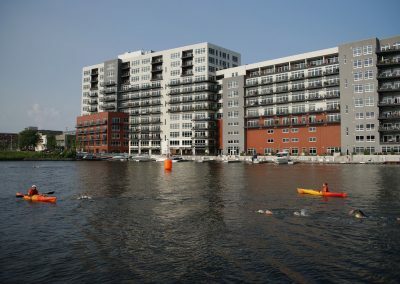 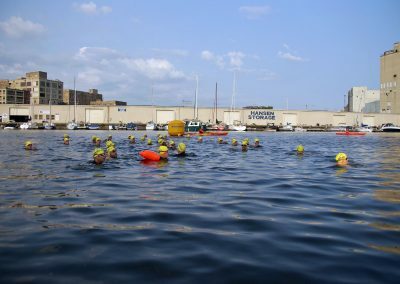 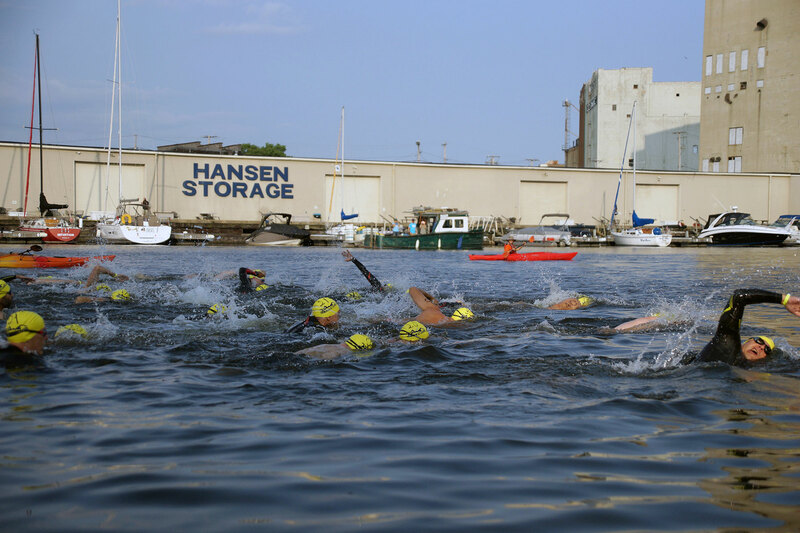 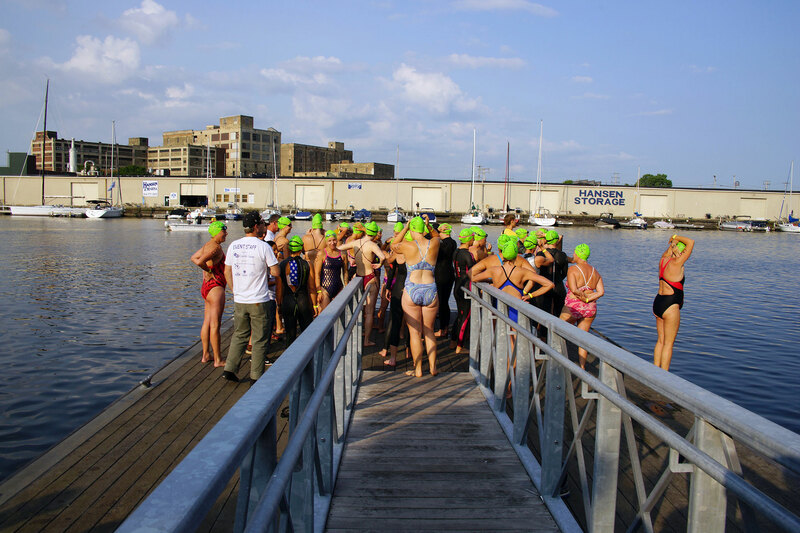 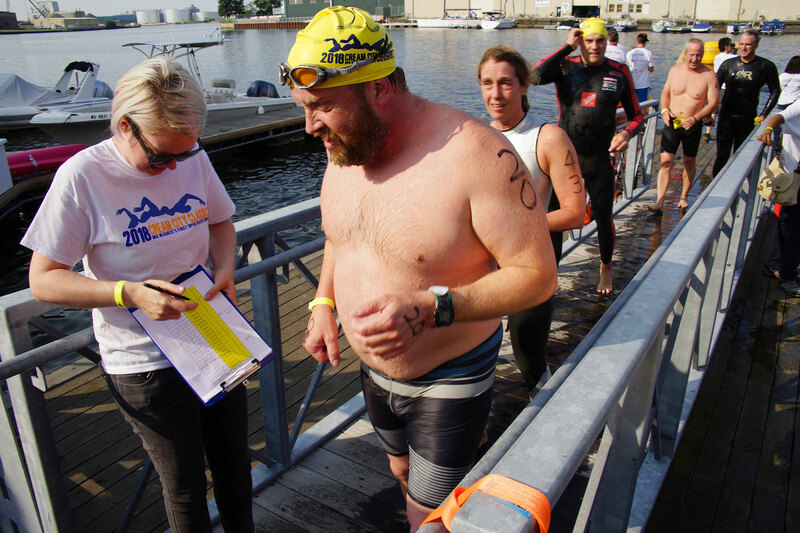 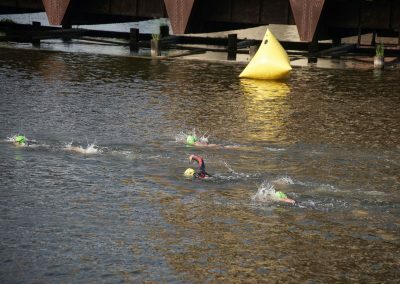 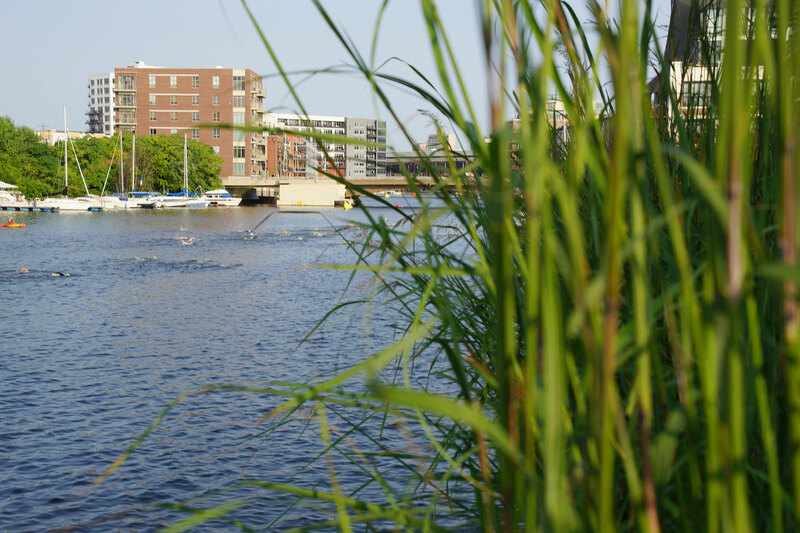 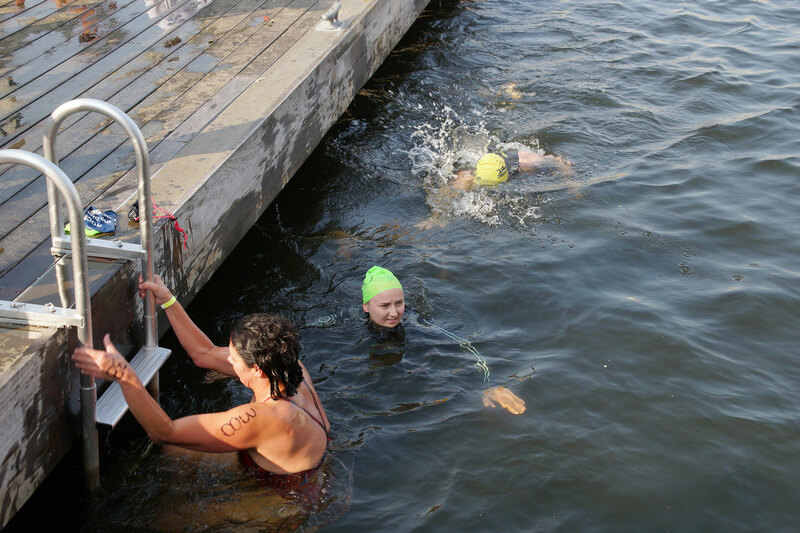 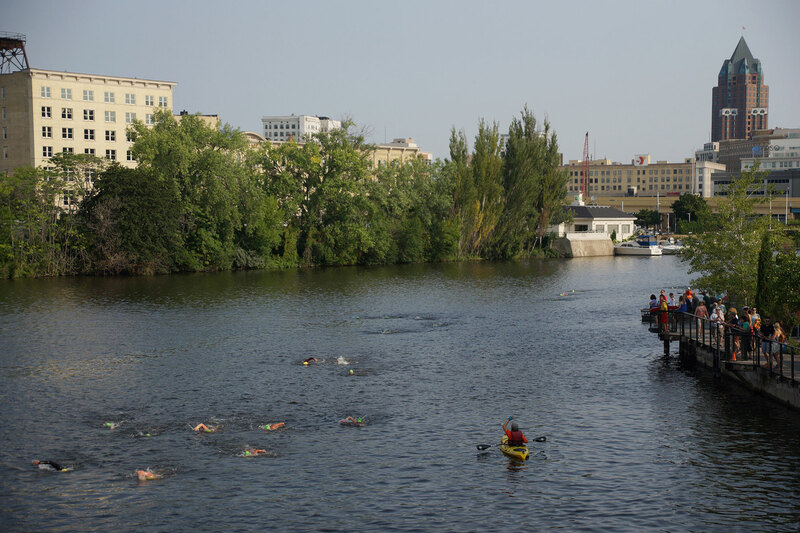 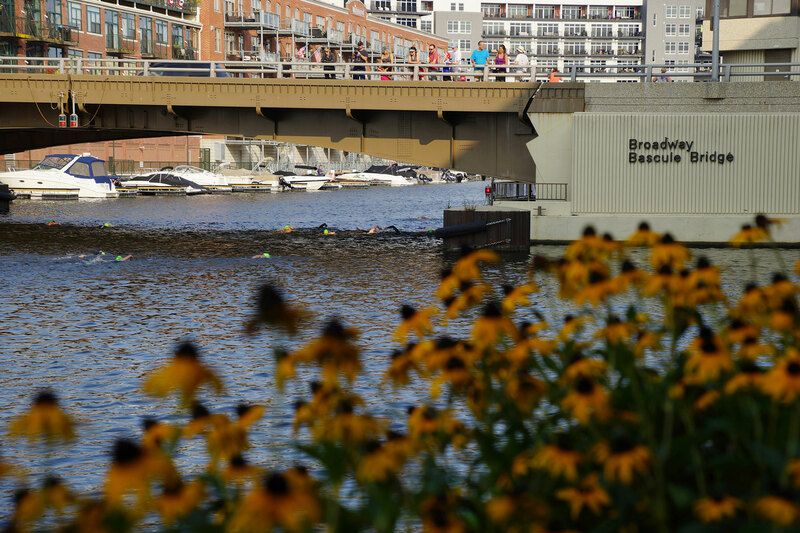 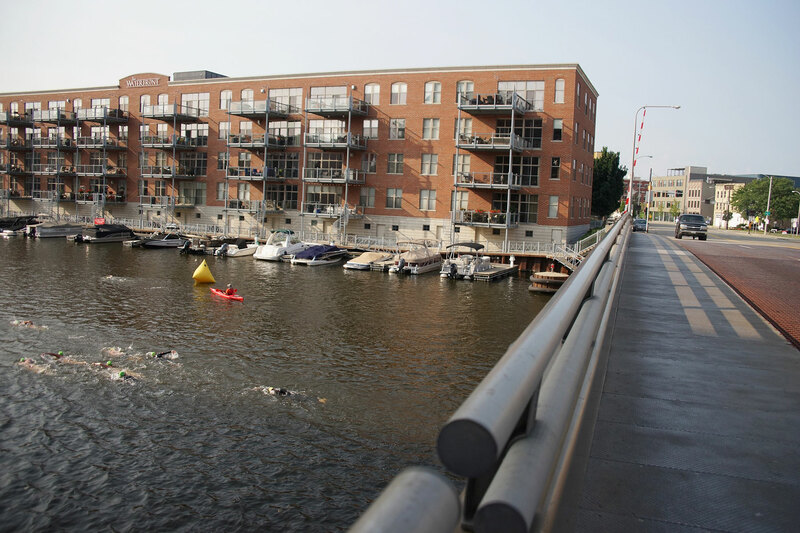 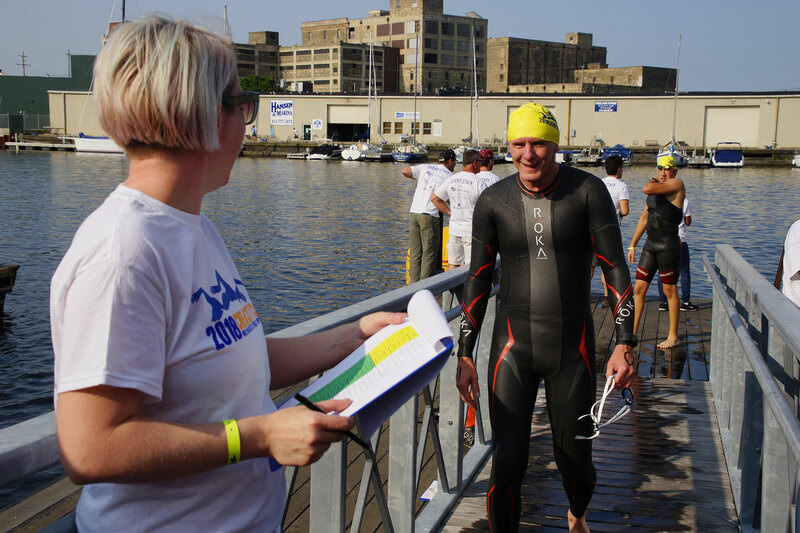 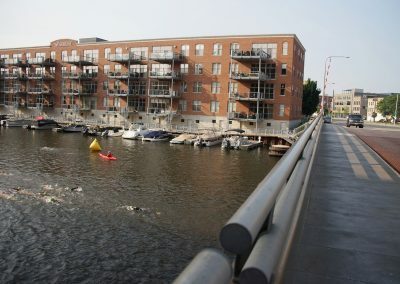 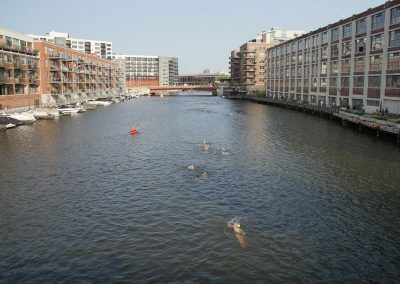 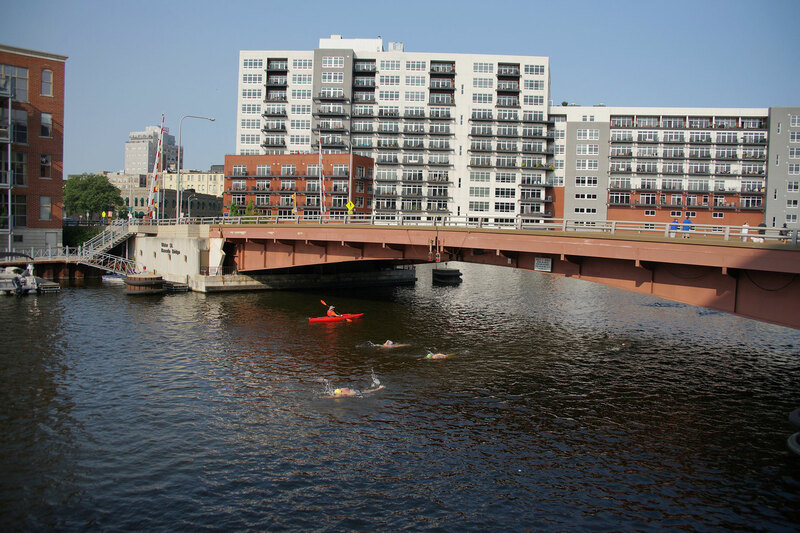 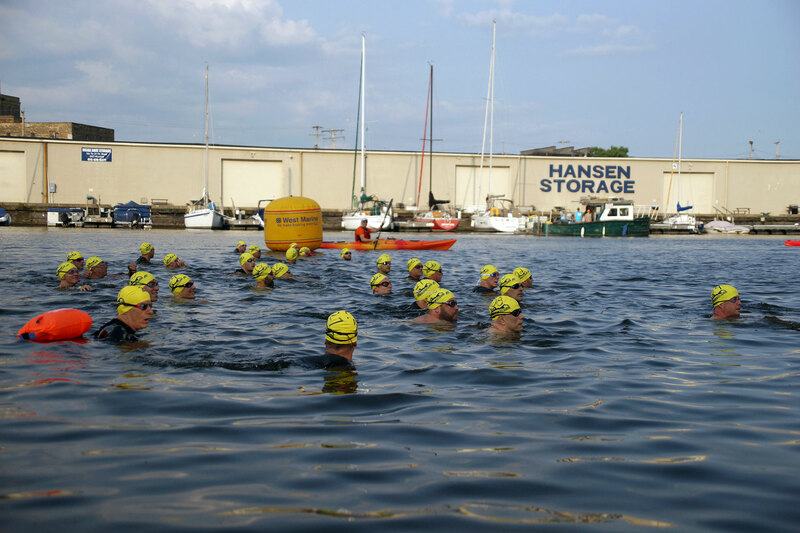 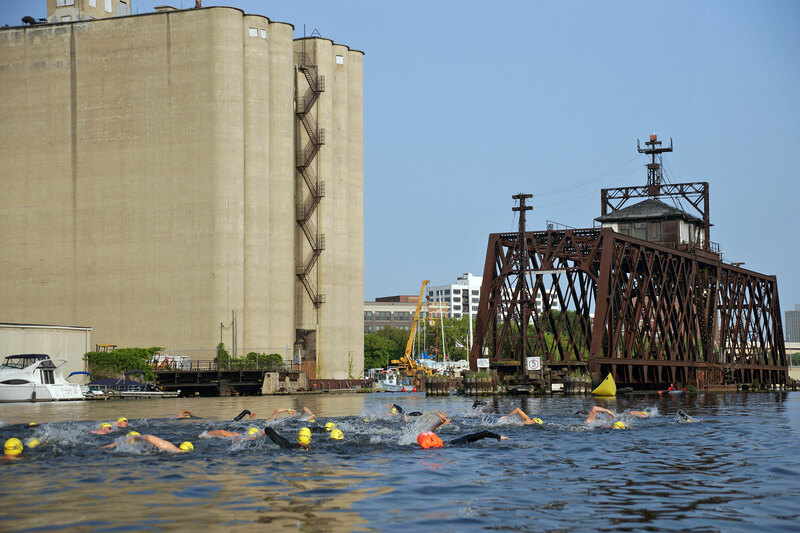 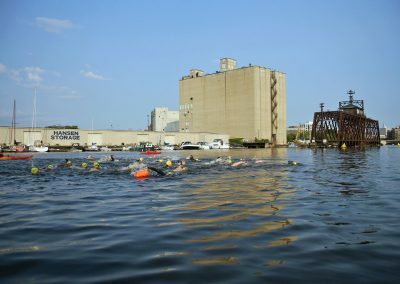 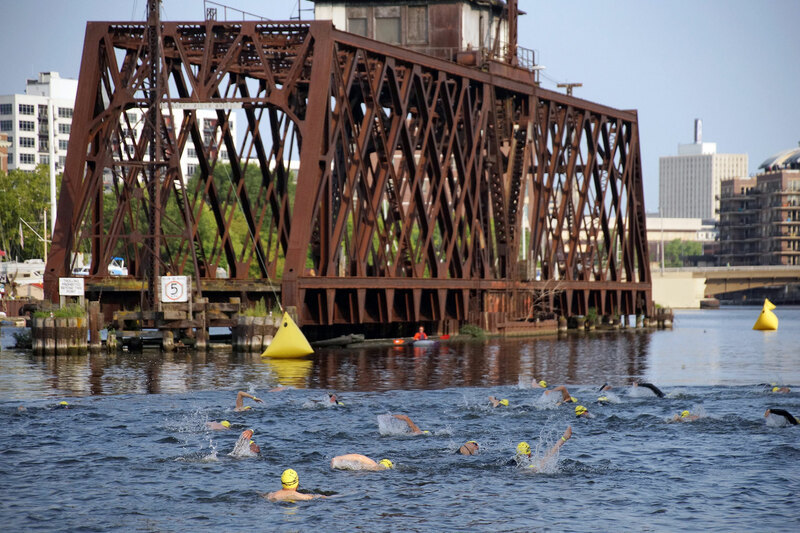 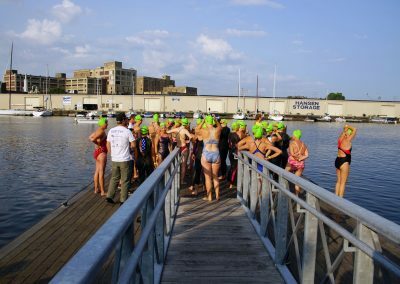 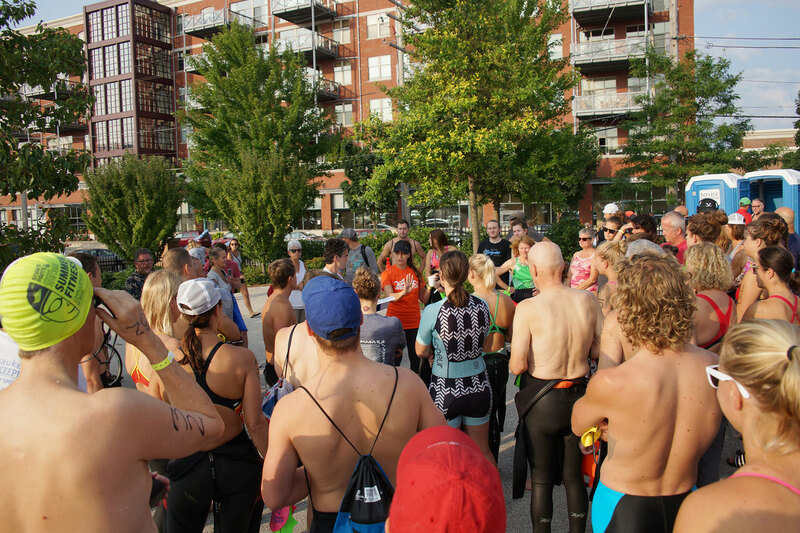 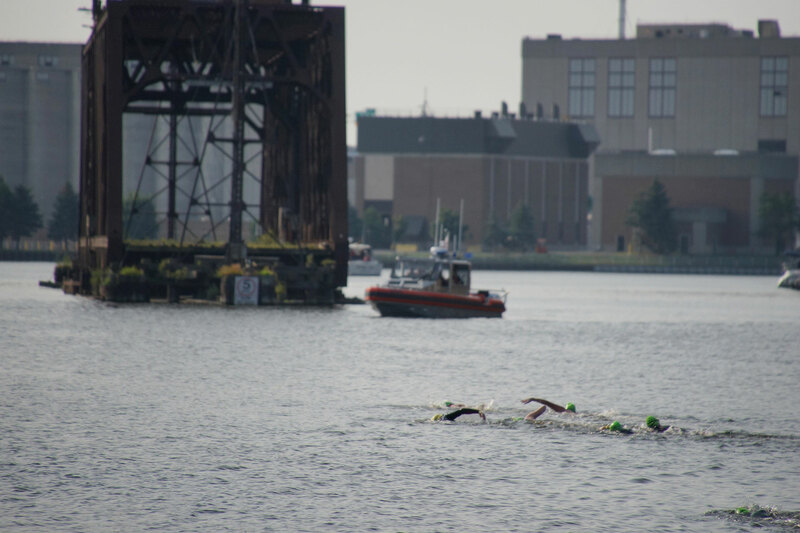 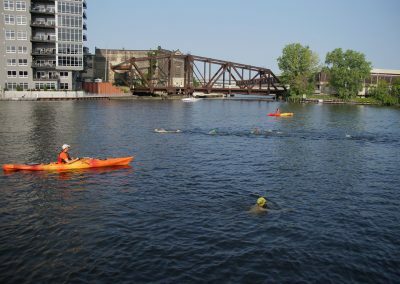 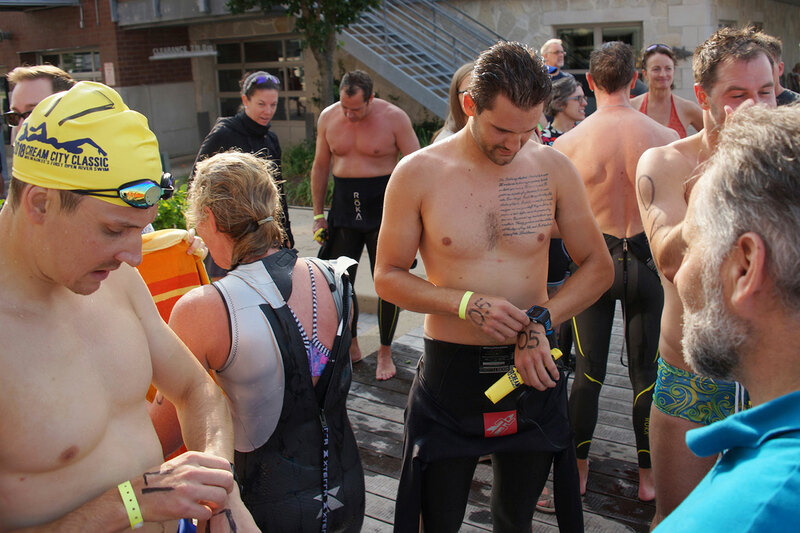 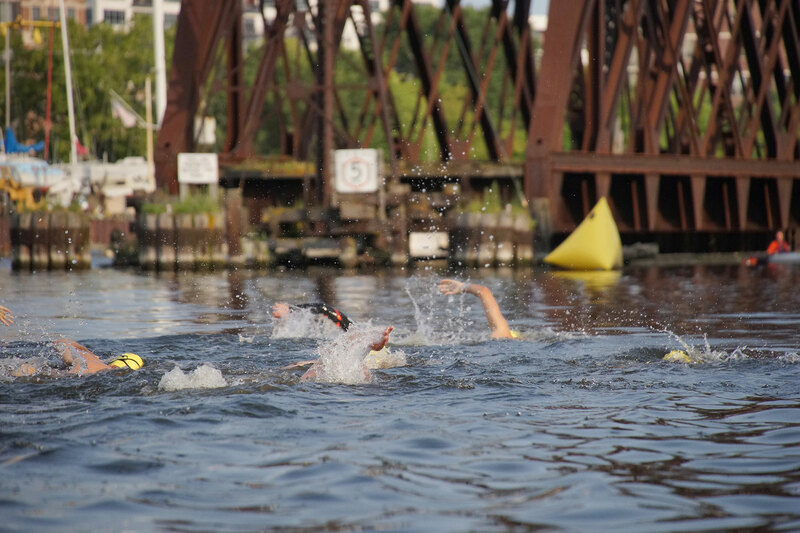 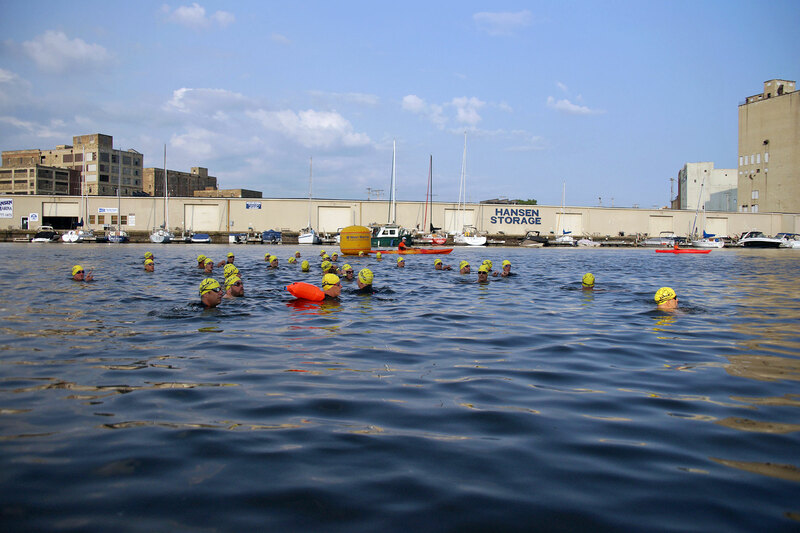 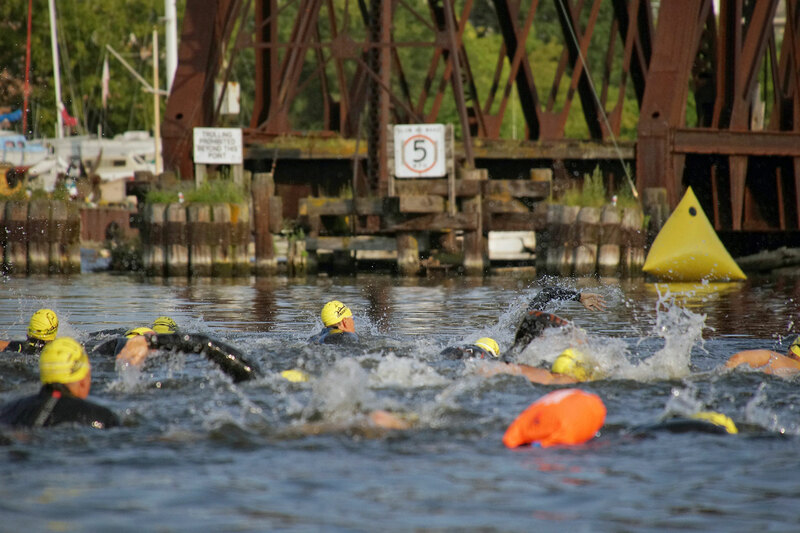 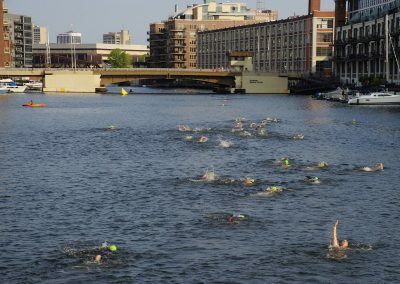 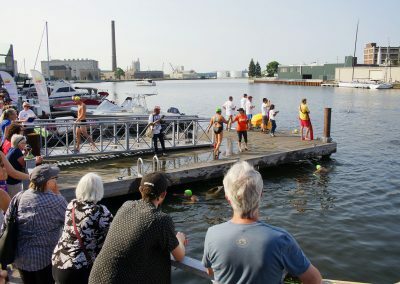 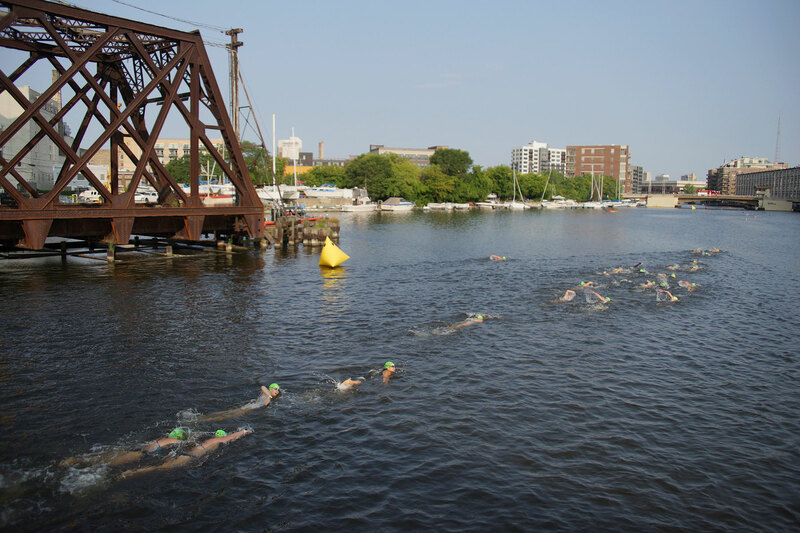 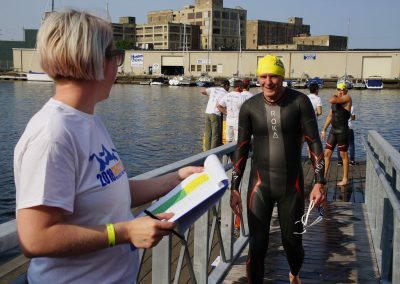 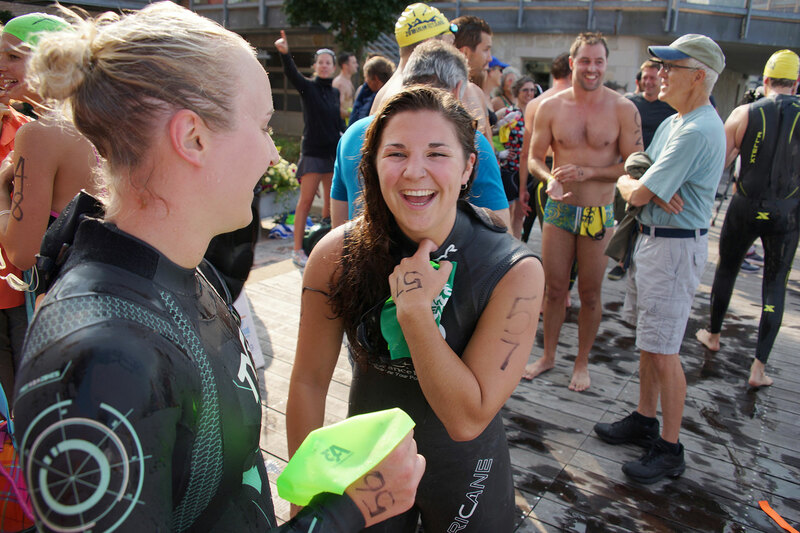 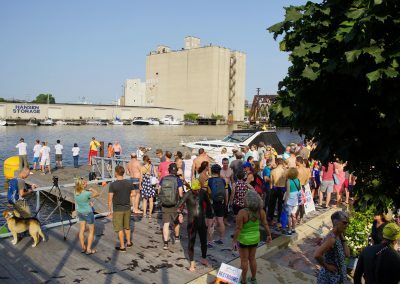 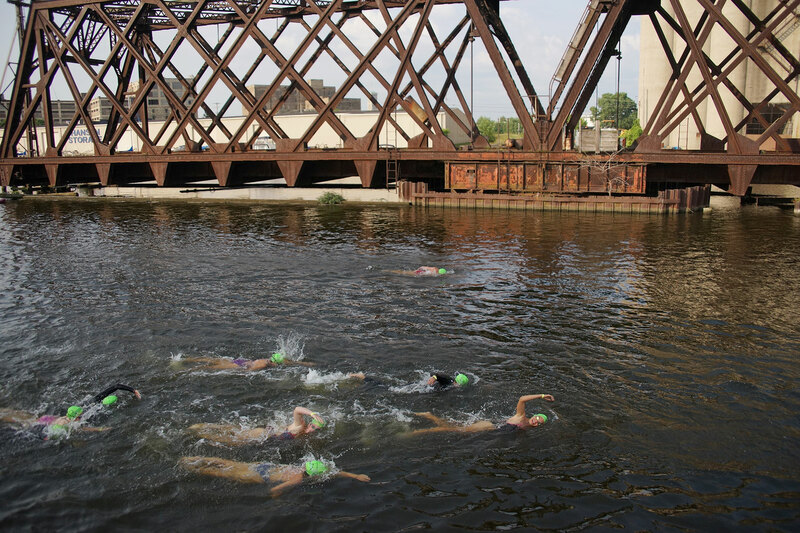 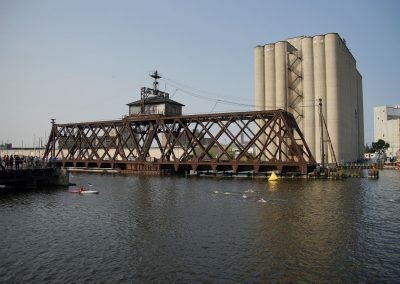 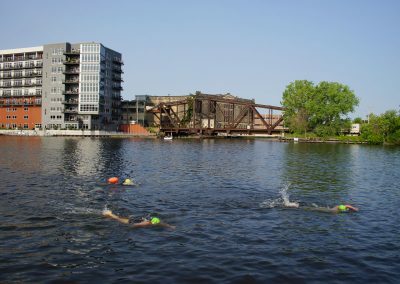 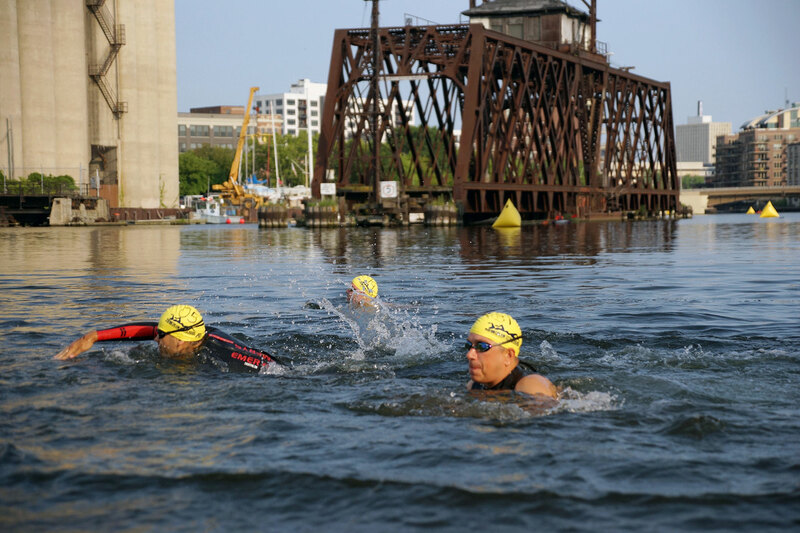 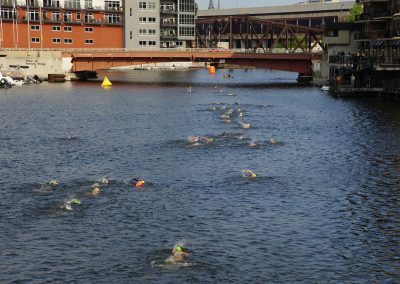 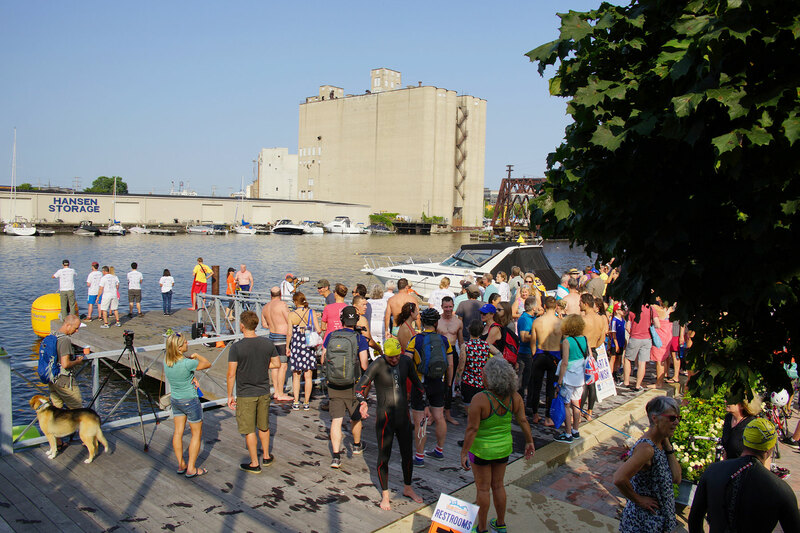 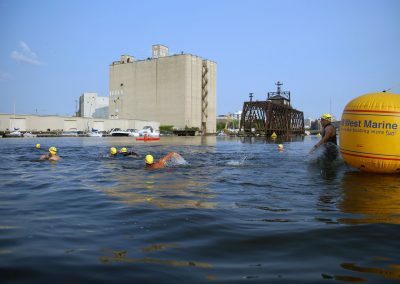 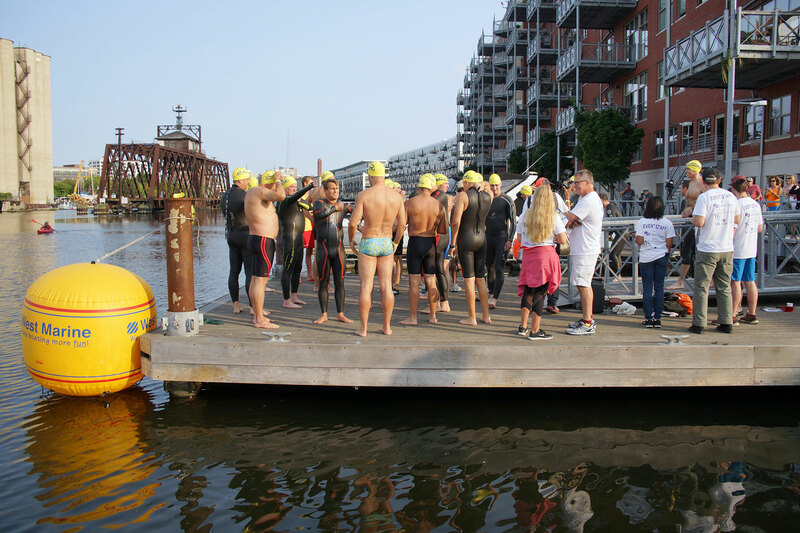 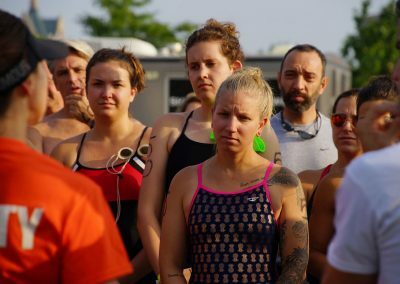 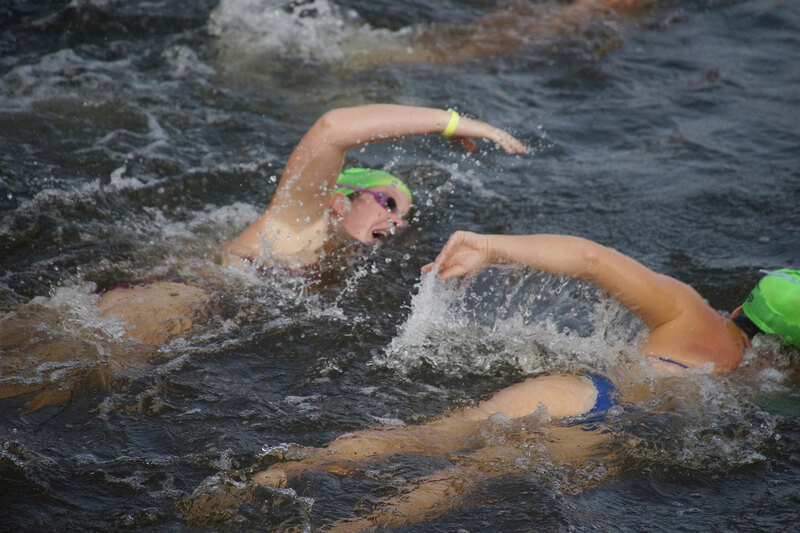 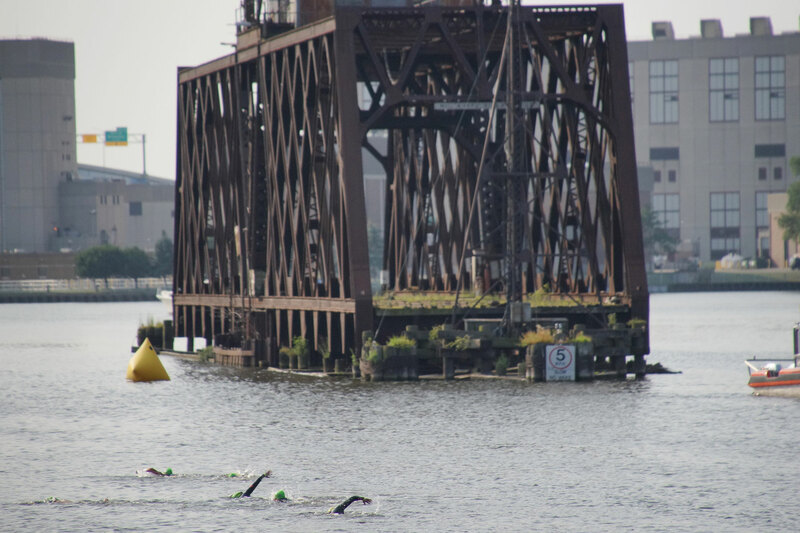 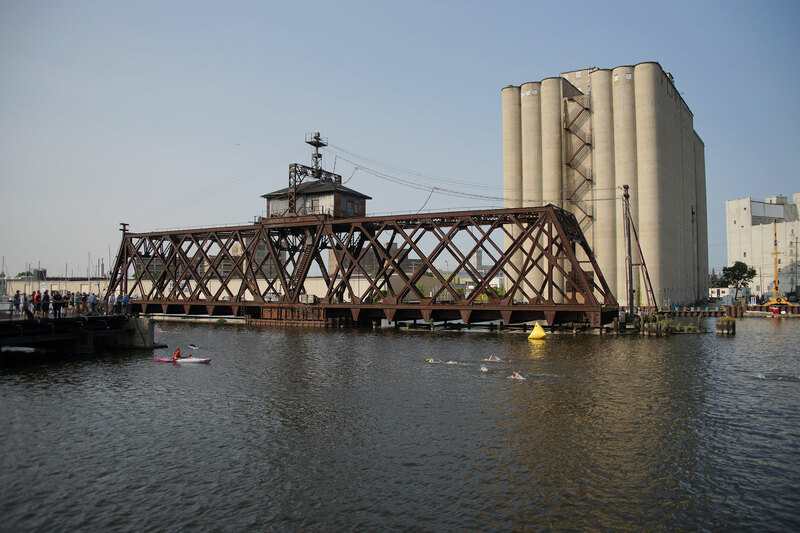 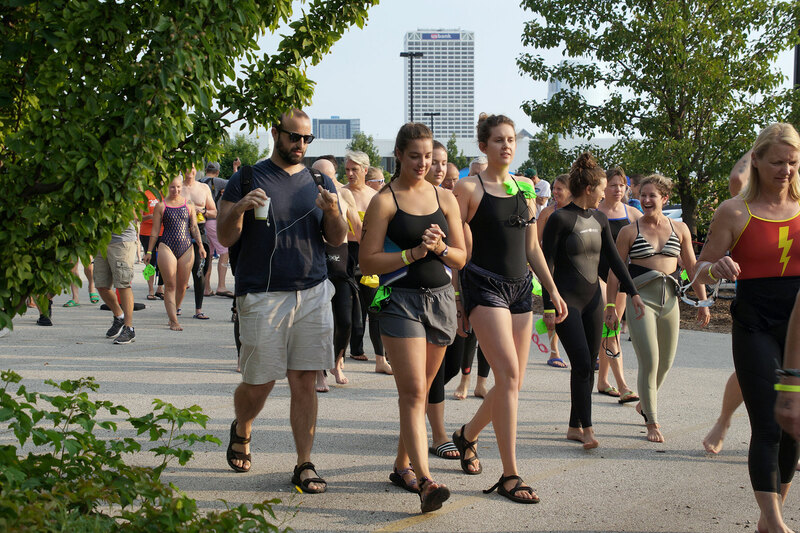 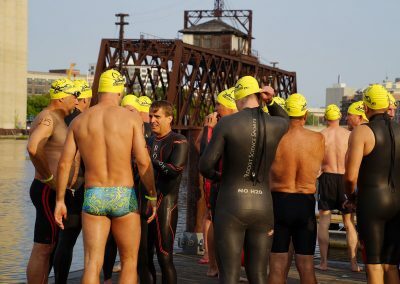 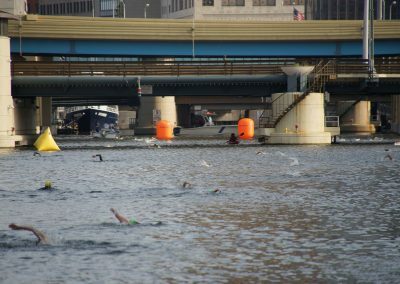 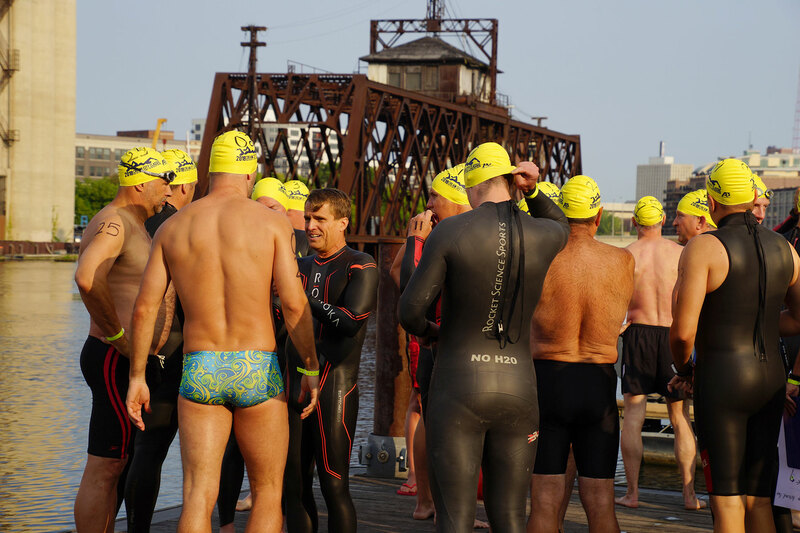 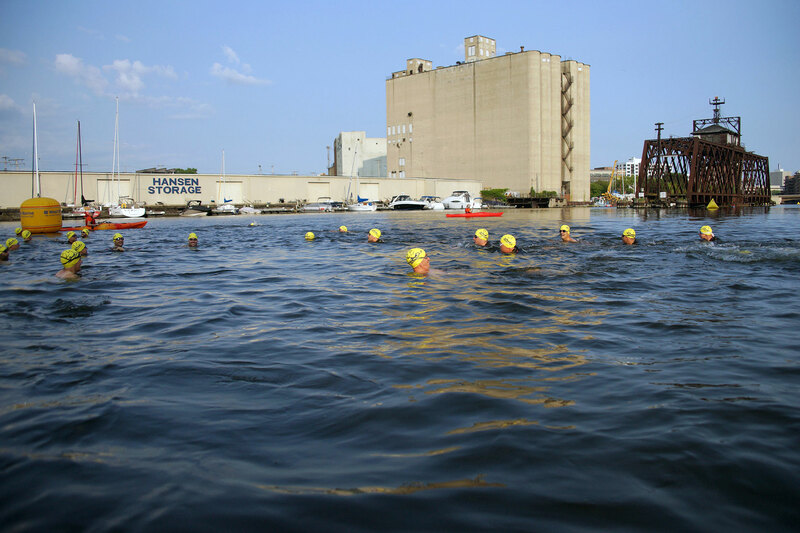 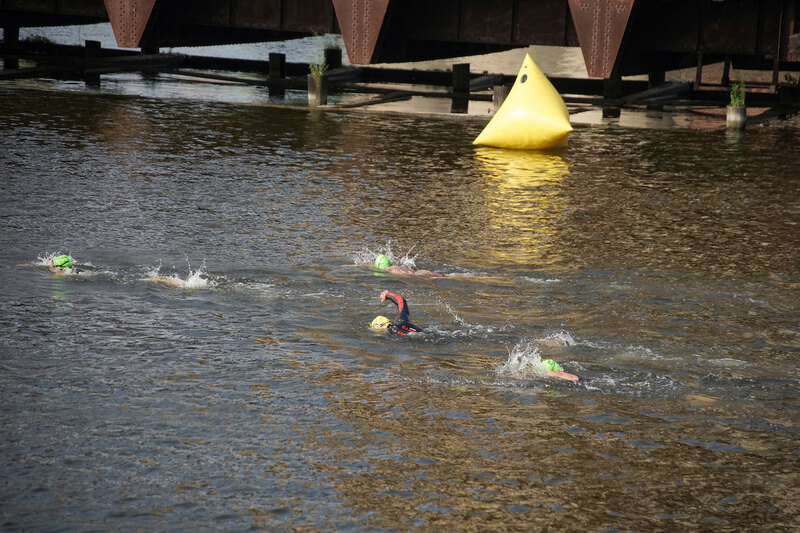 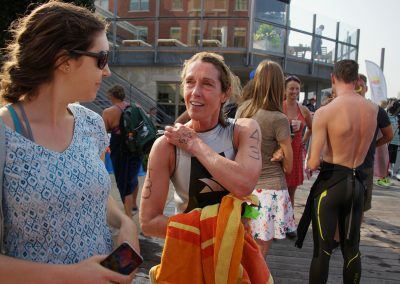 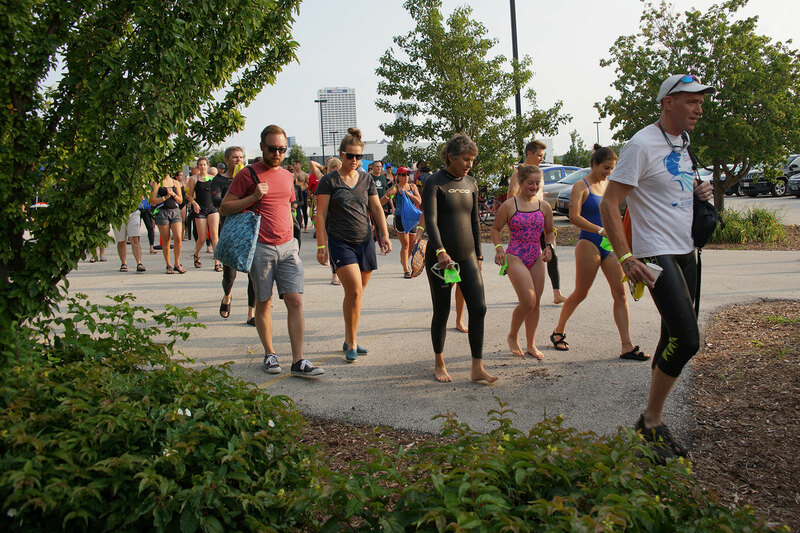 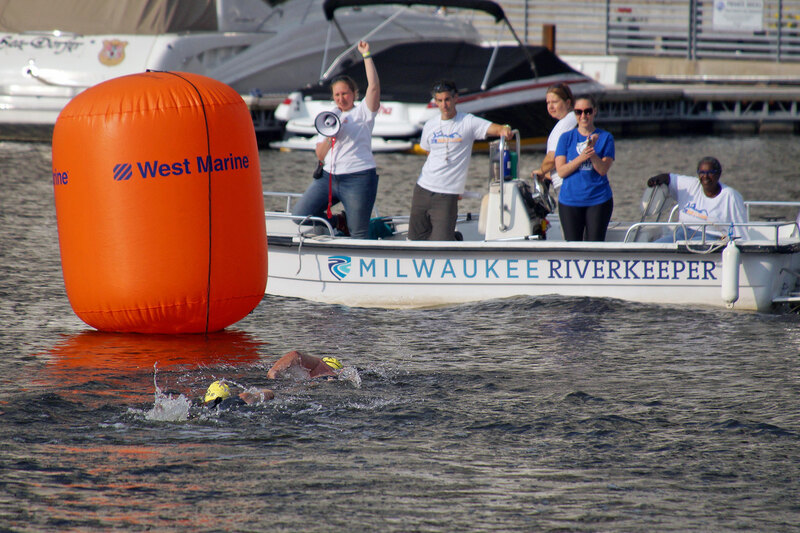 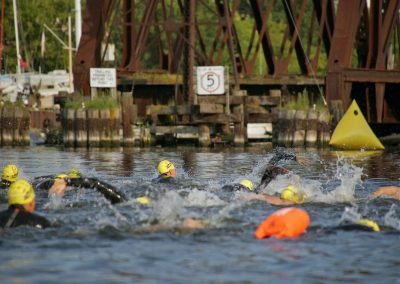 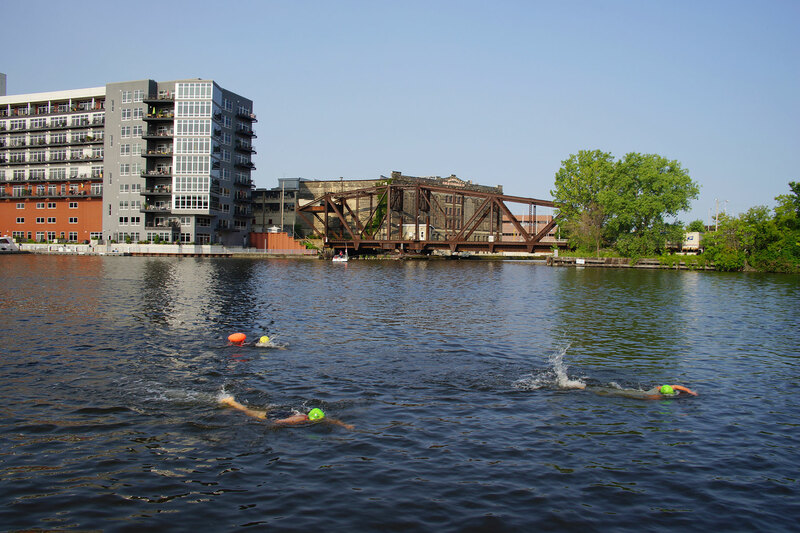 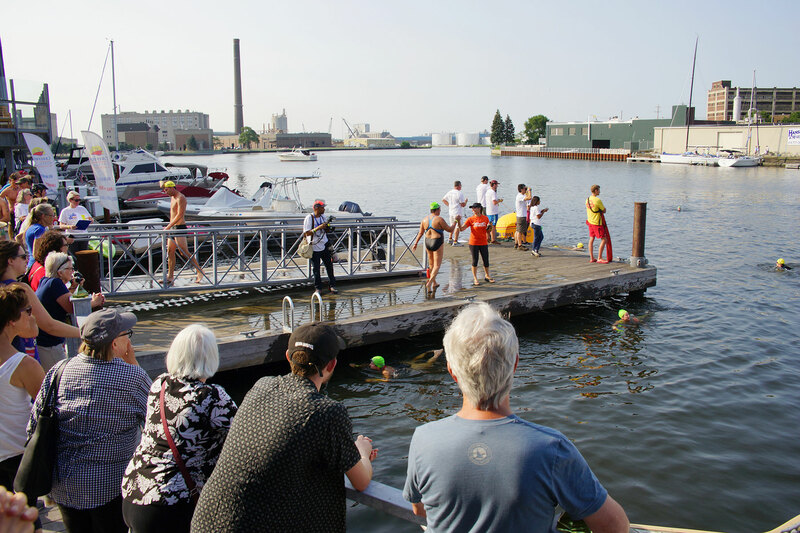 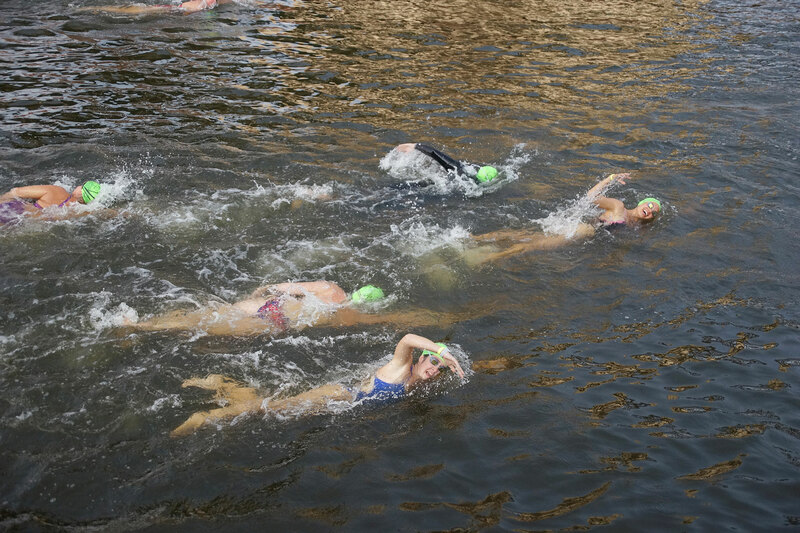 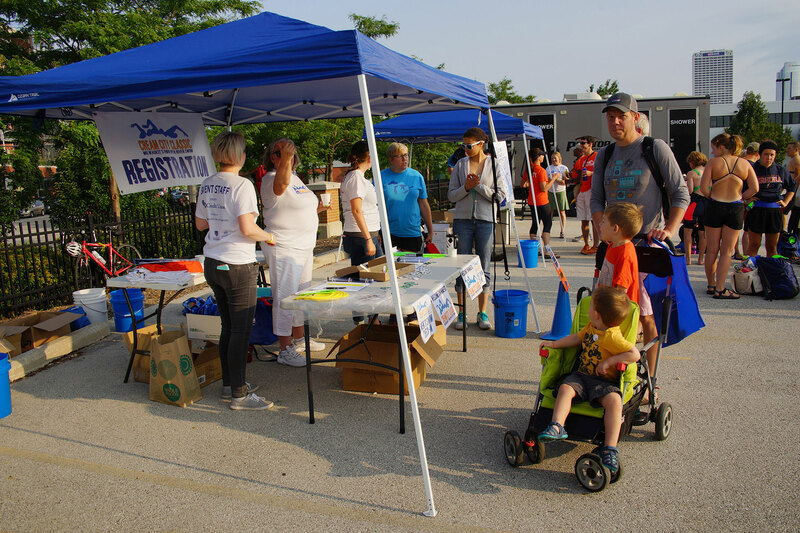 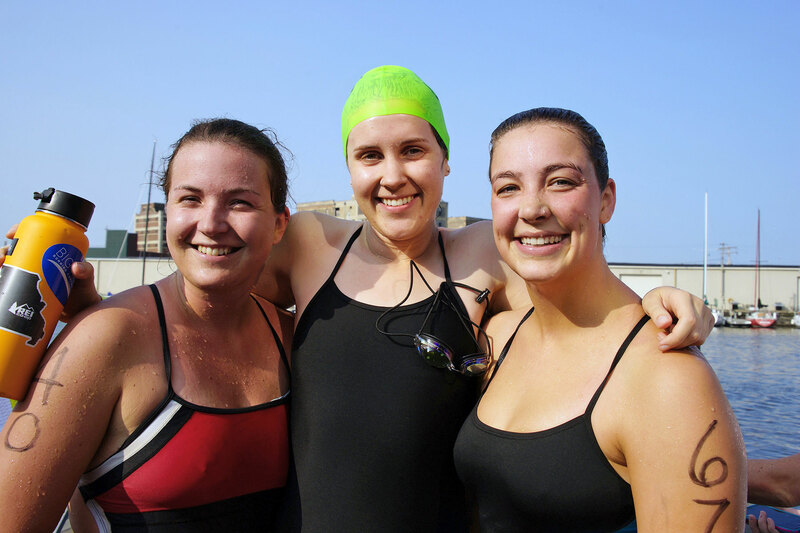 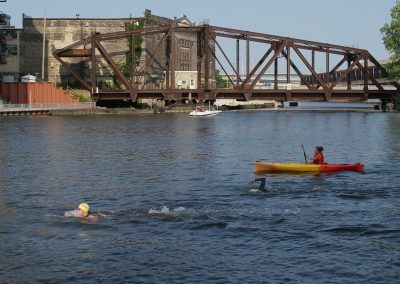 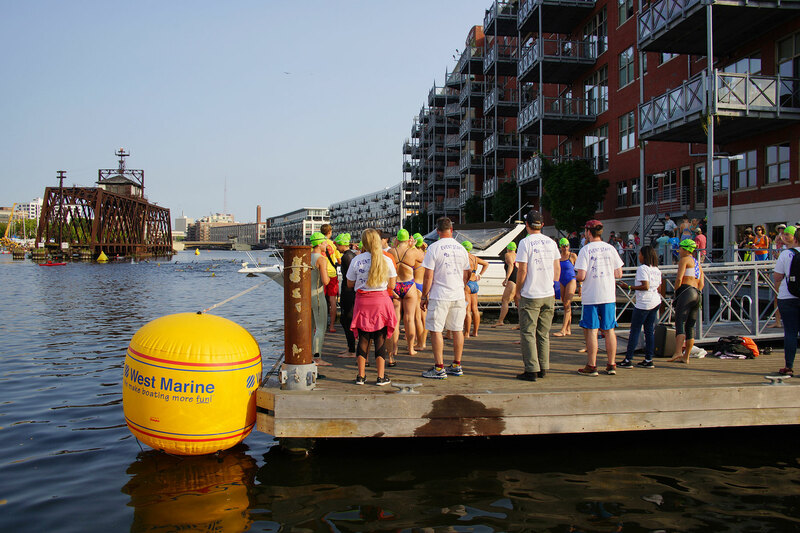 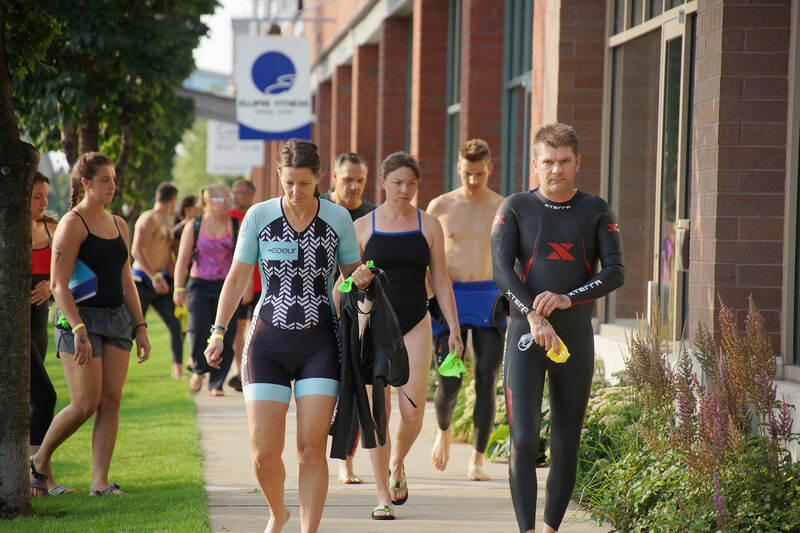 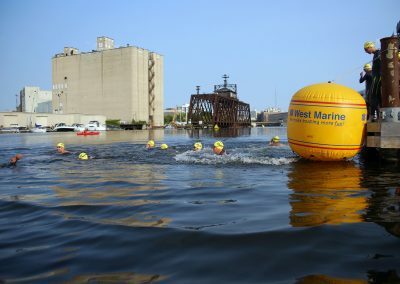 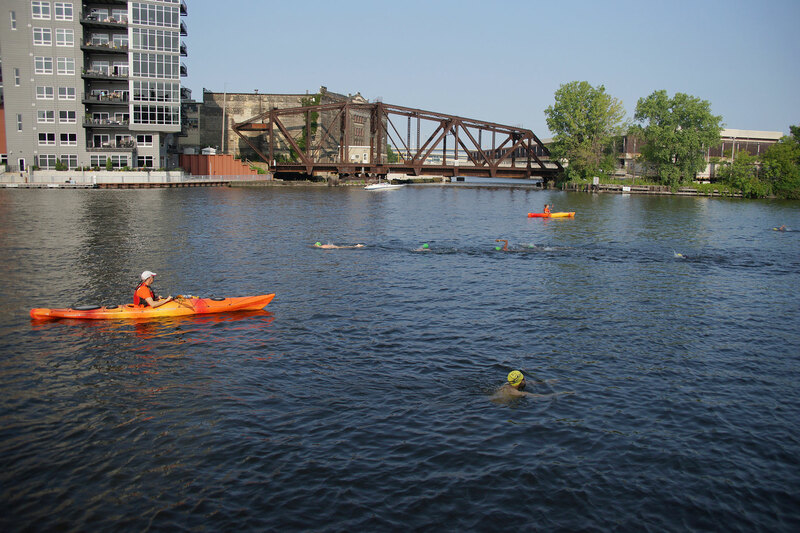 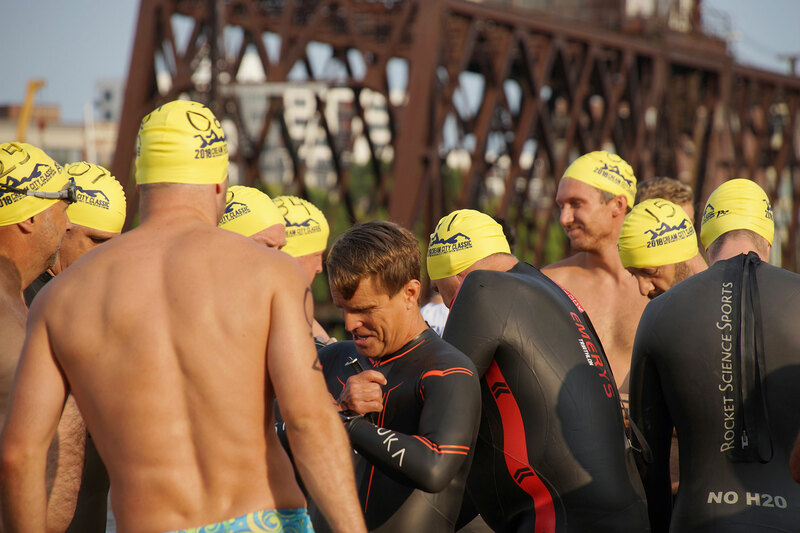 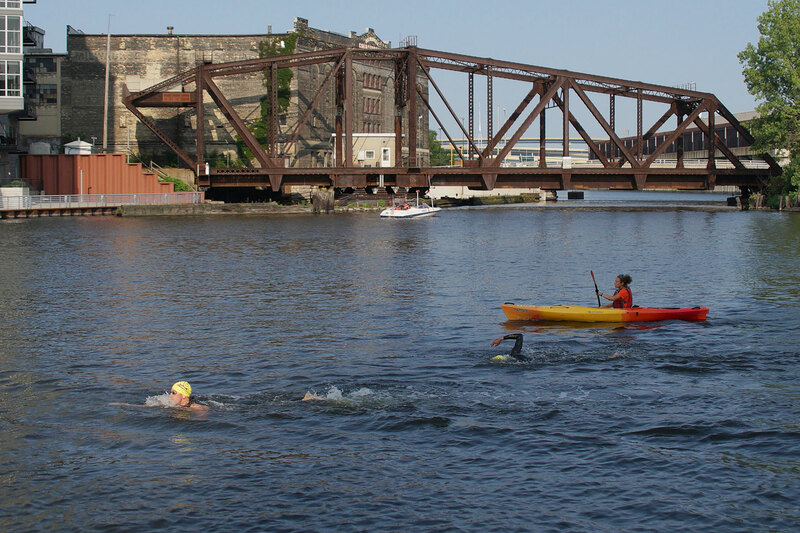 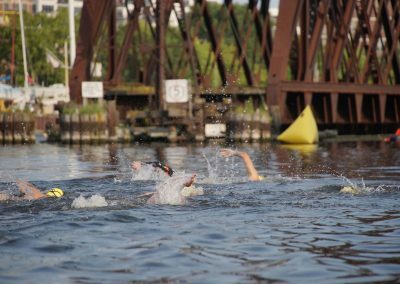 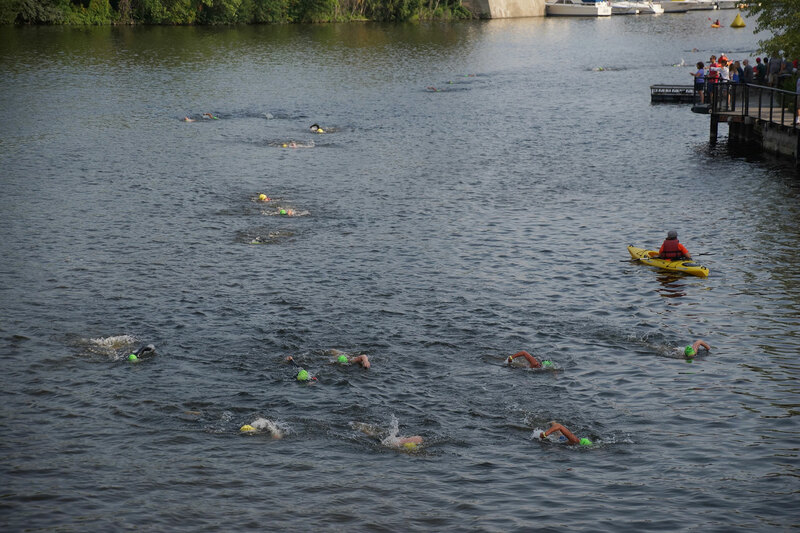 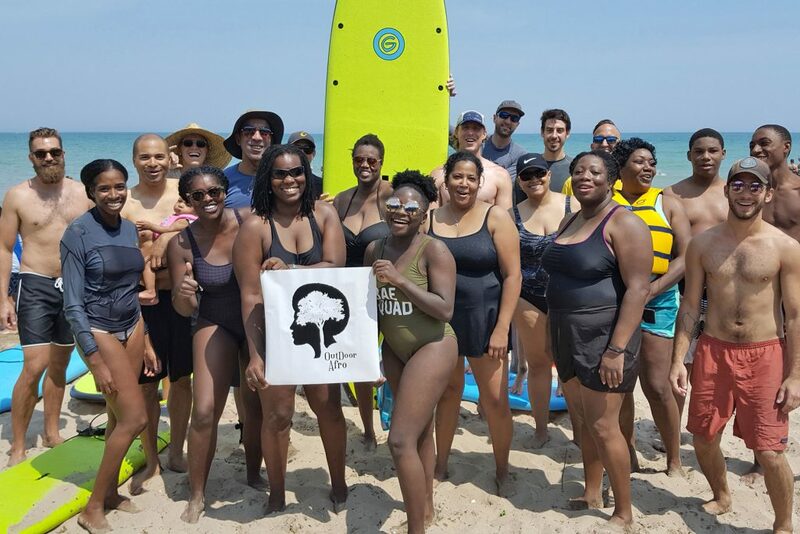 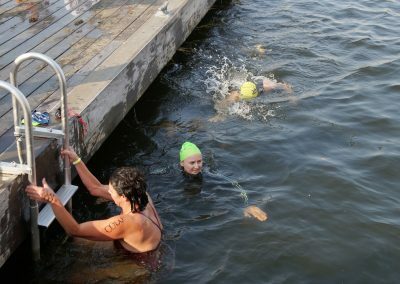 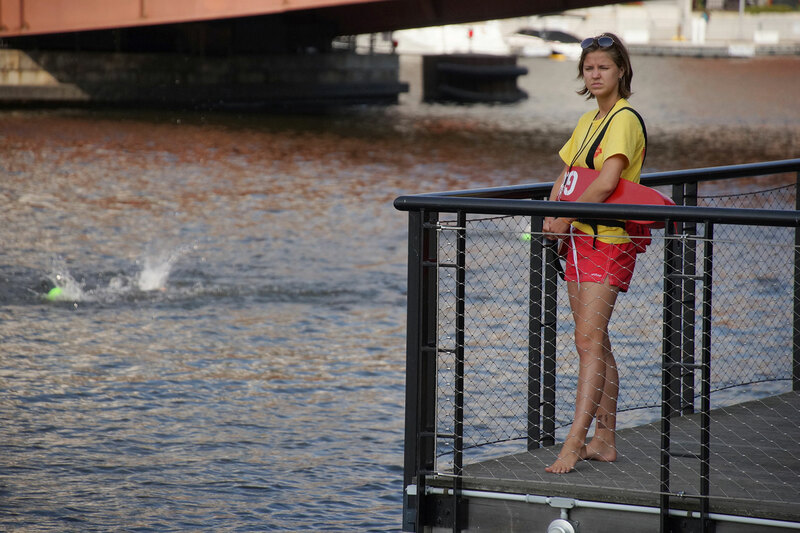 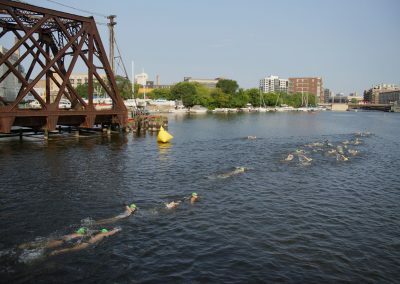 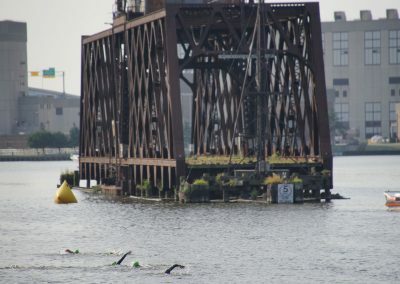 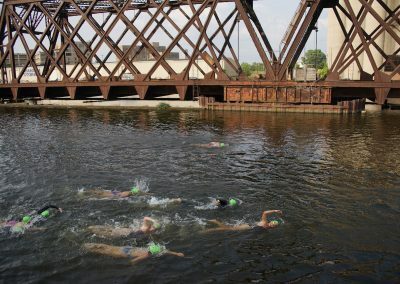 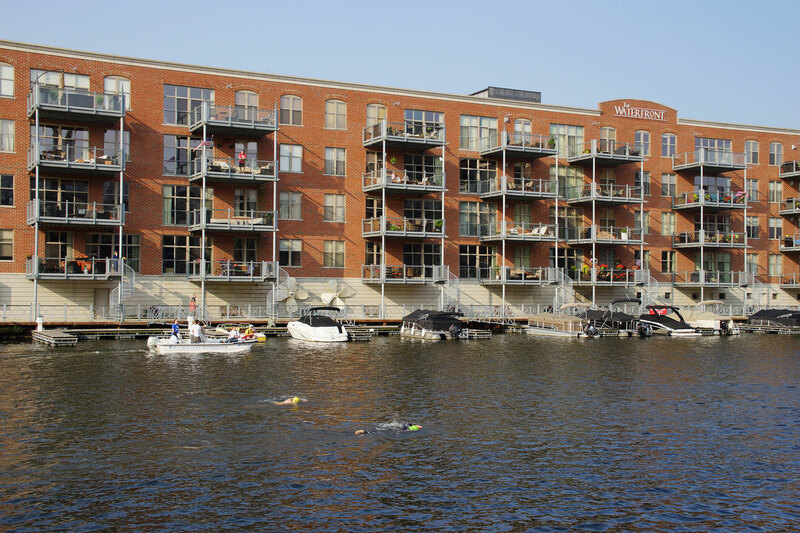 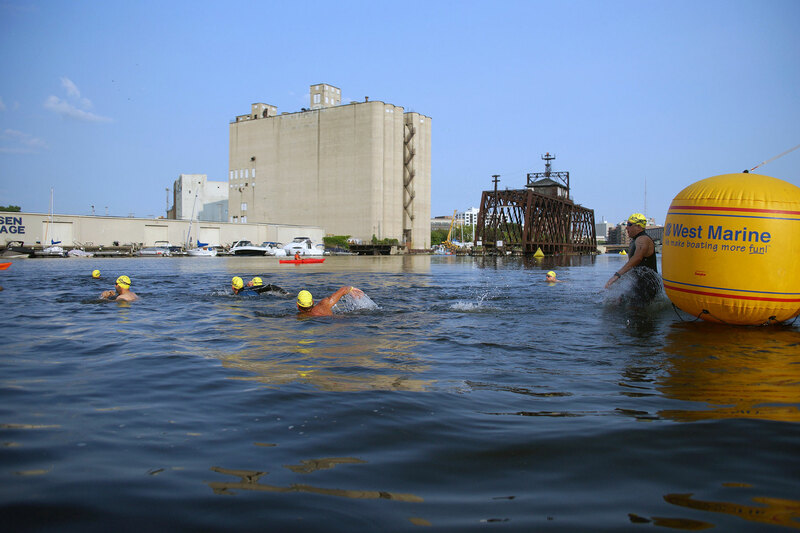 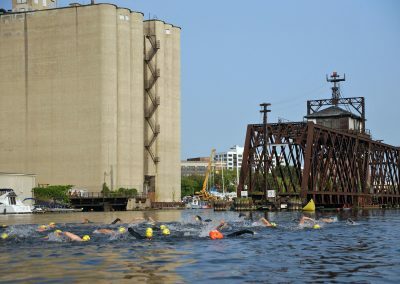 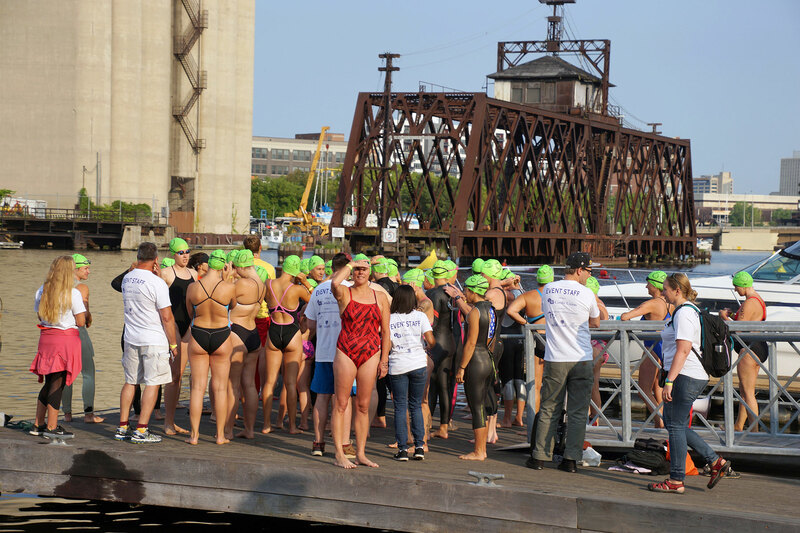 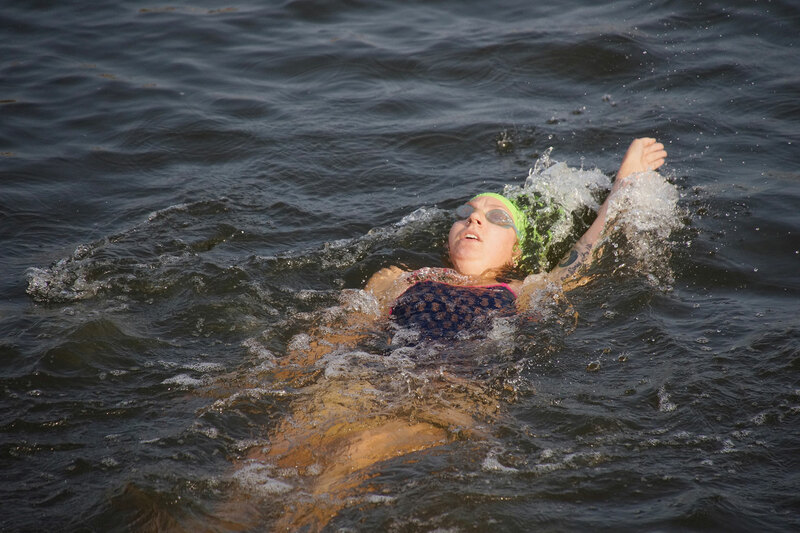 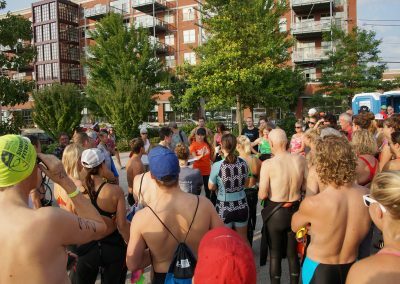 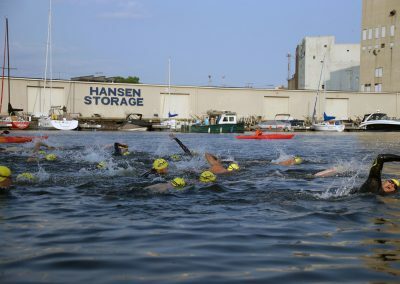 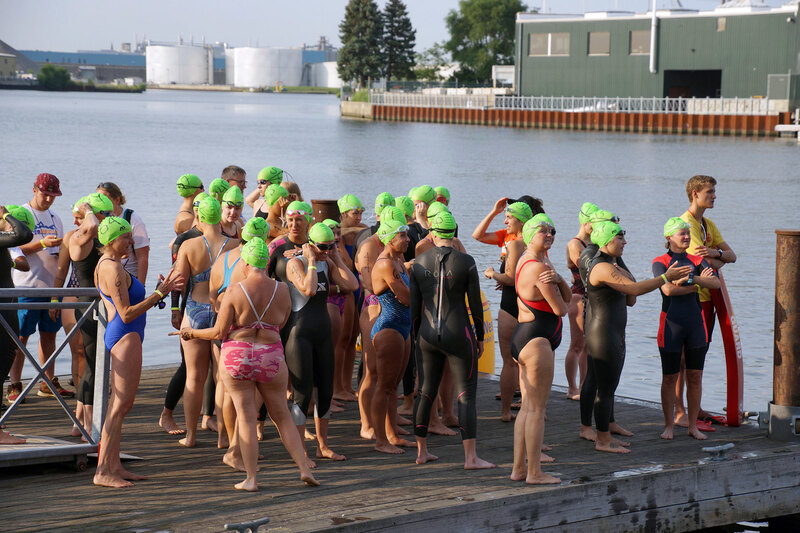 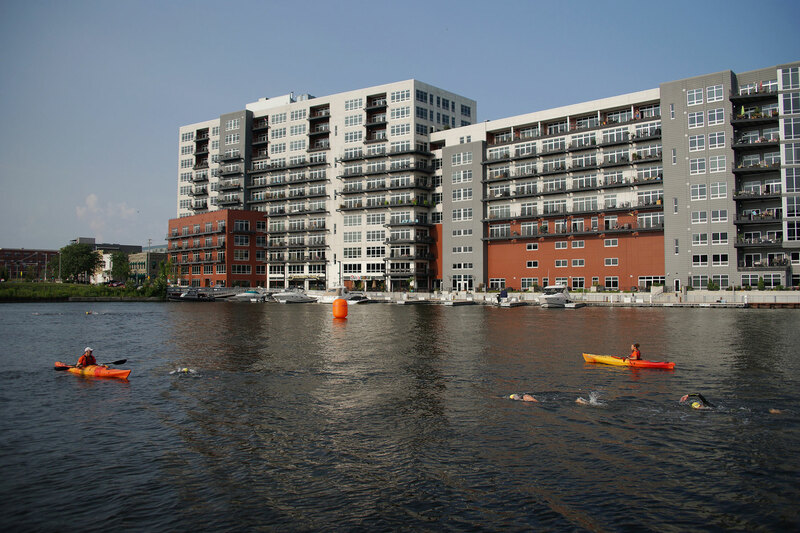 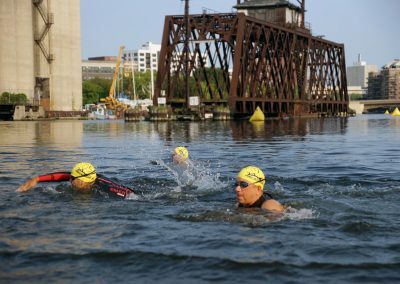 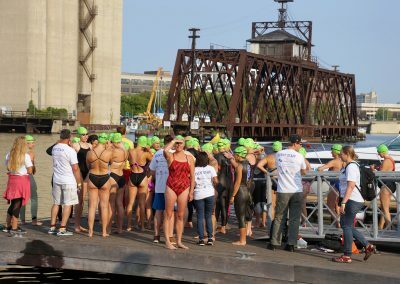 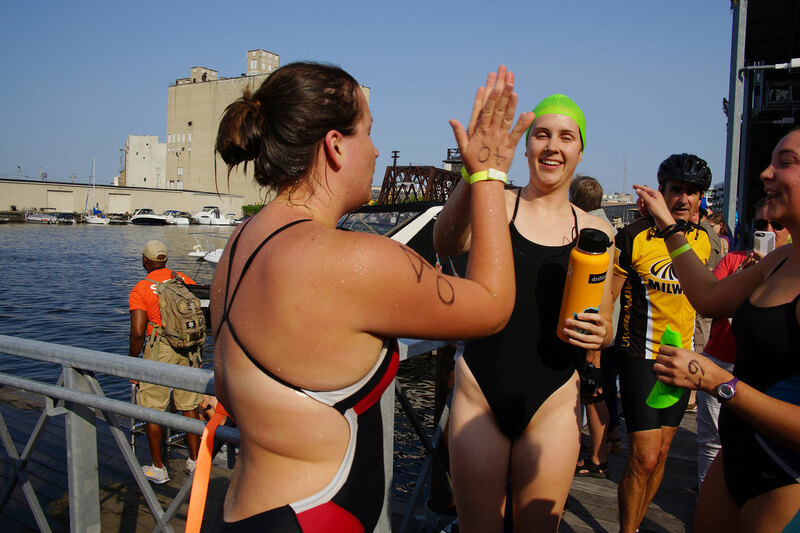 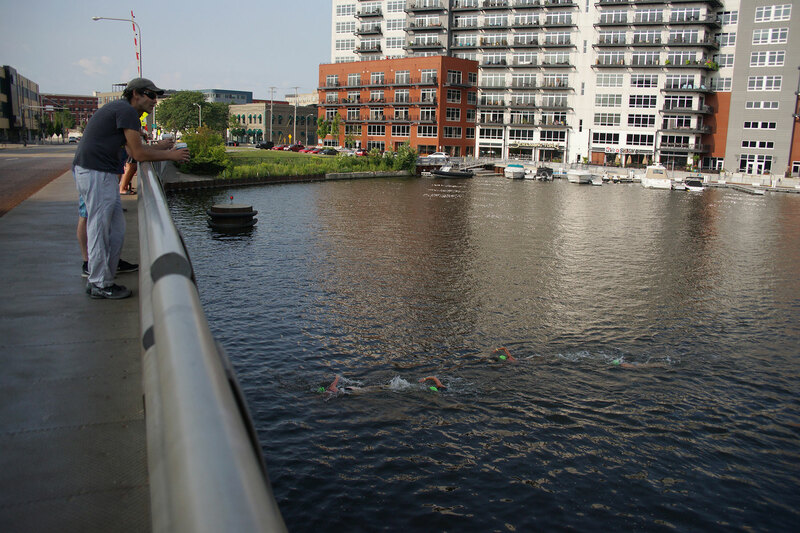 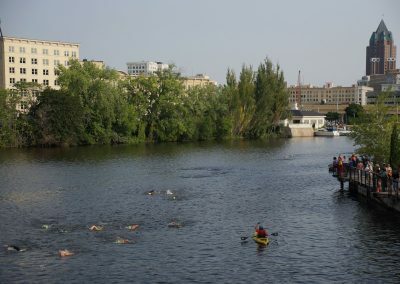 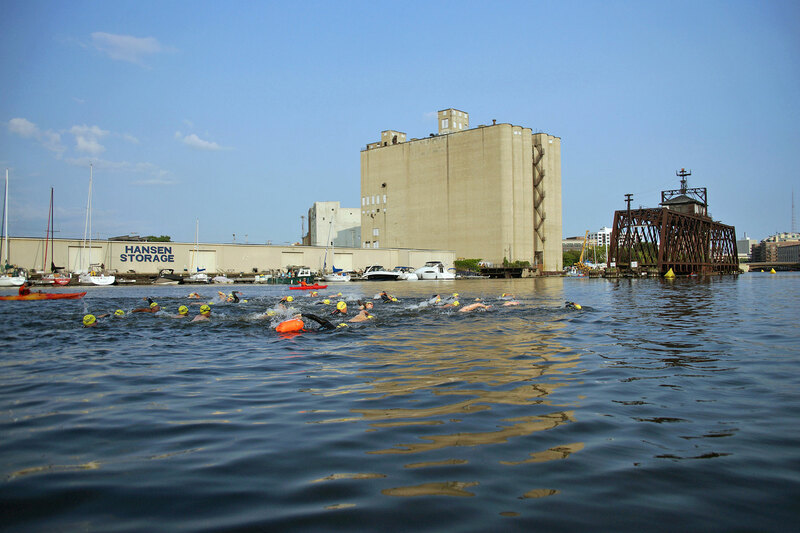 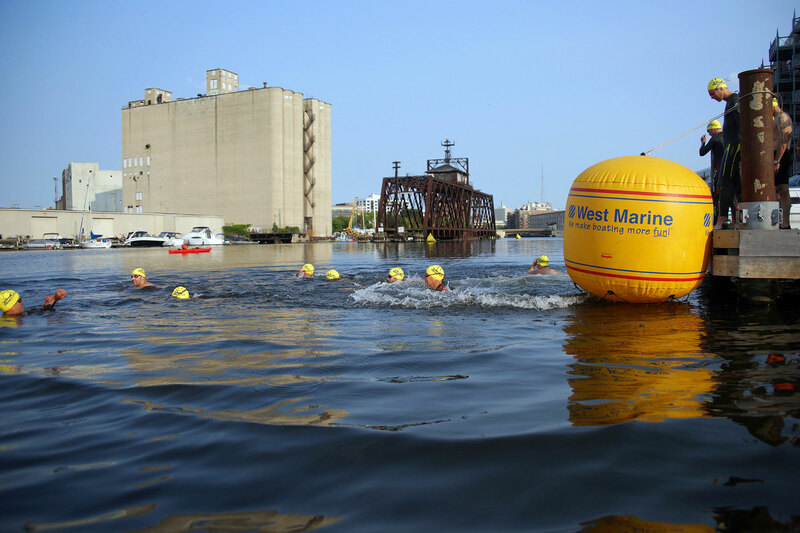 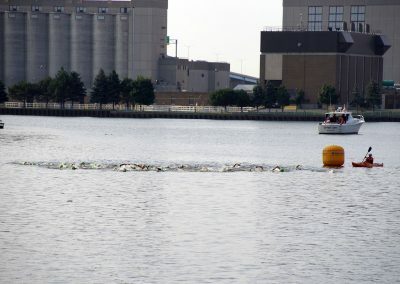 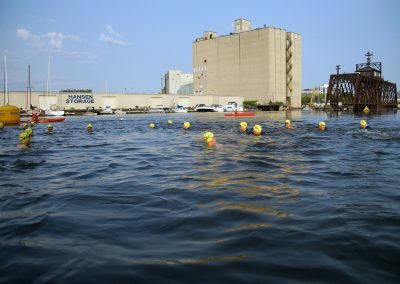 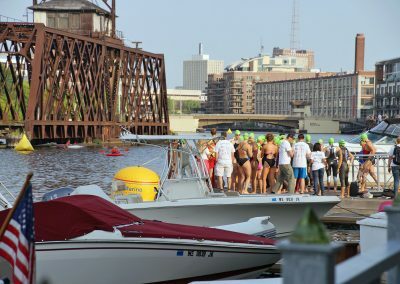 Milwaukee Water Commons, in partnership with Milwaukee Riverkeeper, Harbor District, and Wisconsin Sea Grant, held the first ever open water swim in the Milwaukee River on August 11. 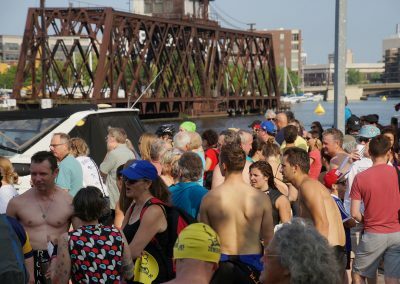 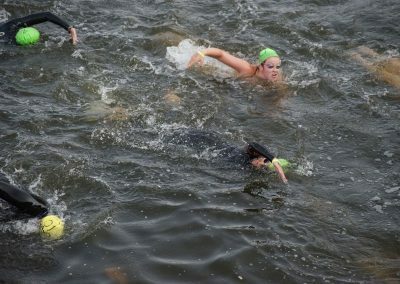 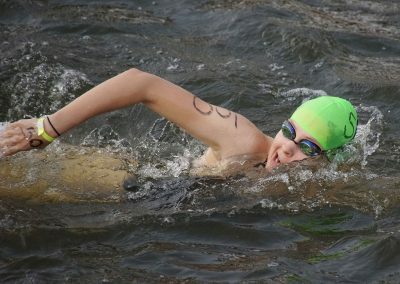 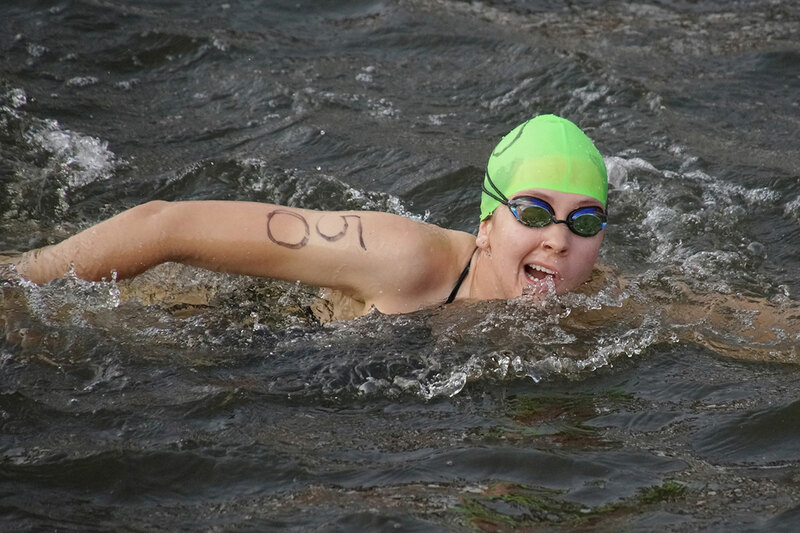 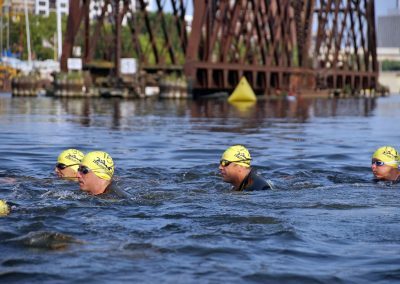 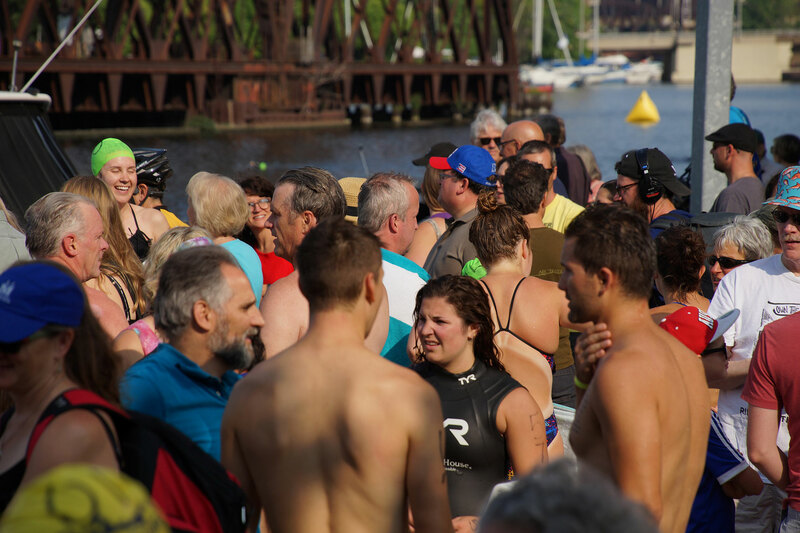 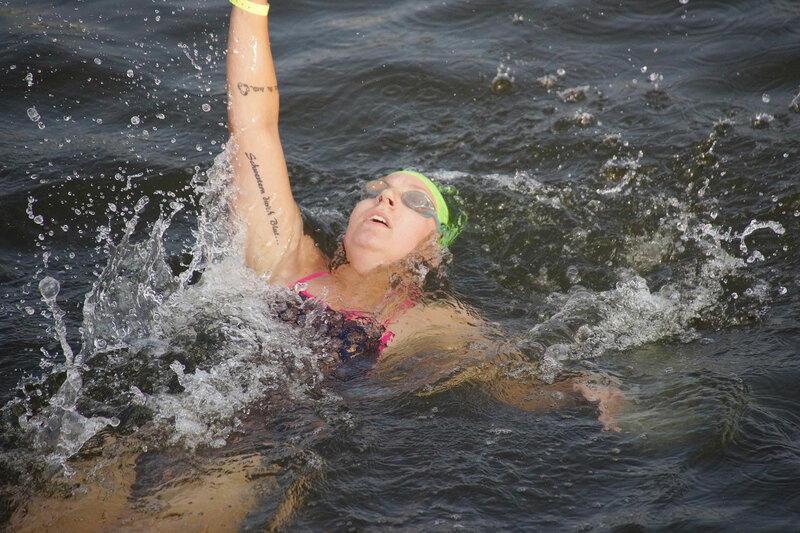 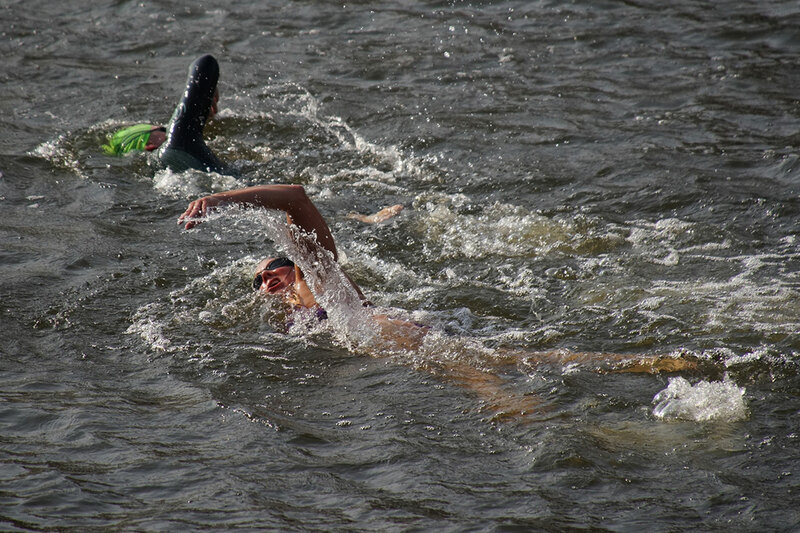 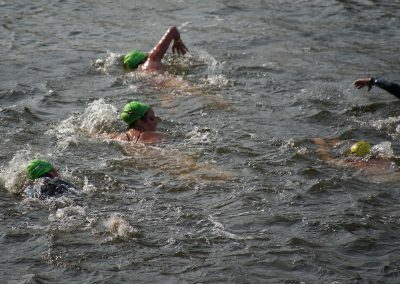 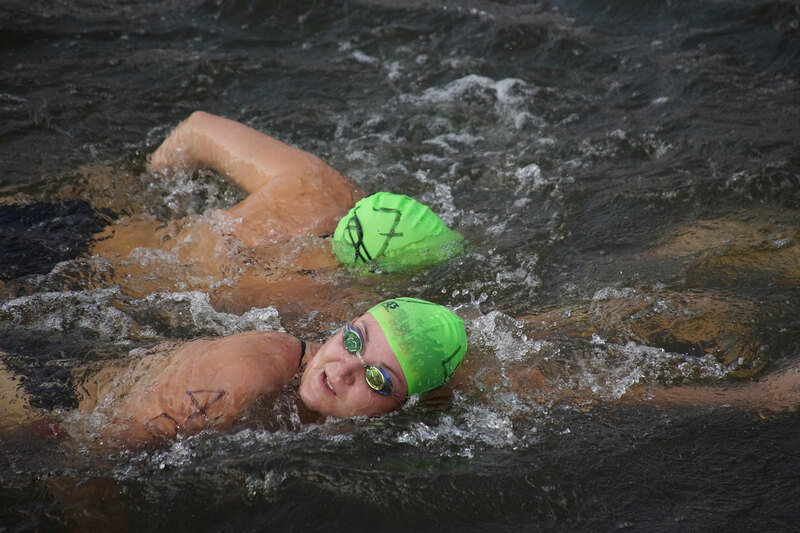 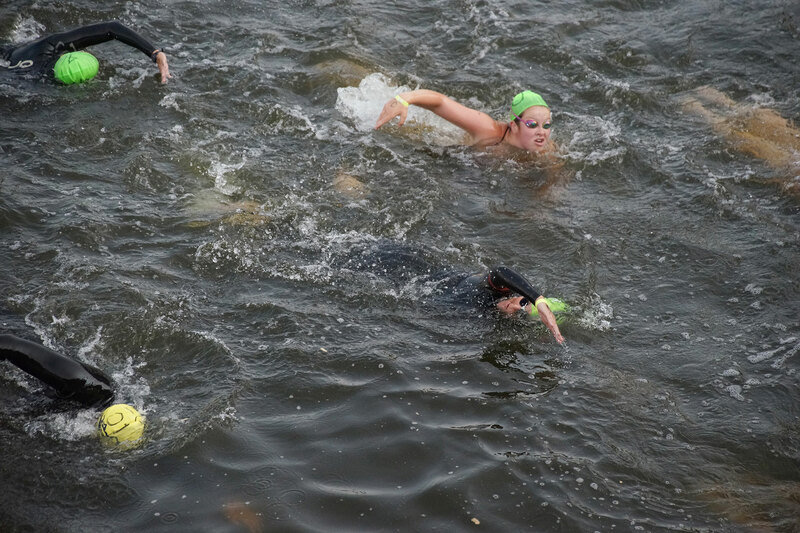 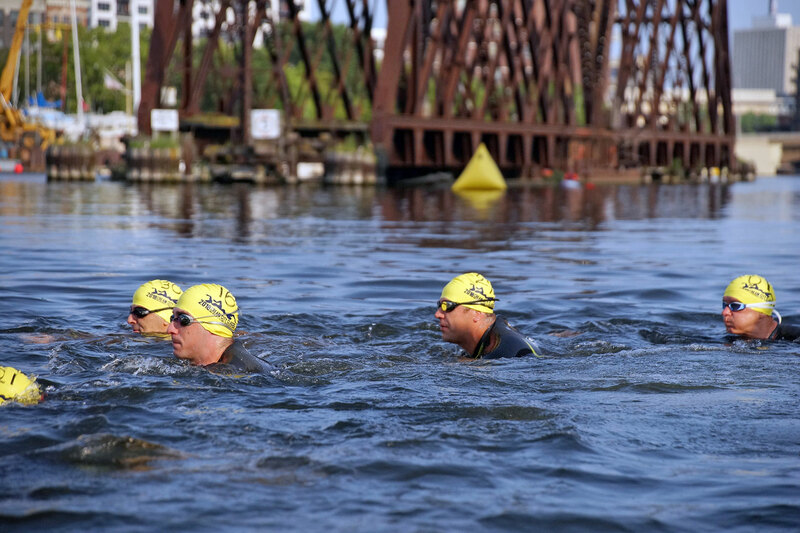 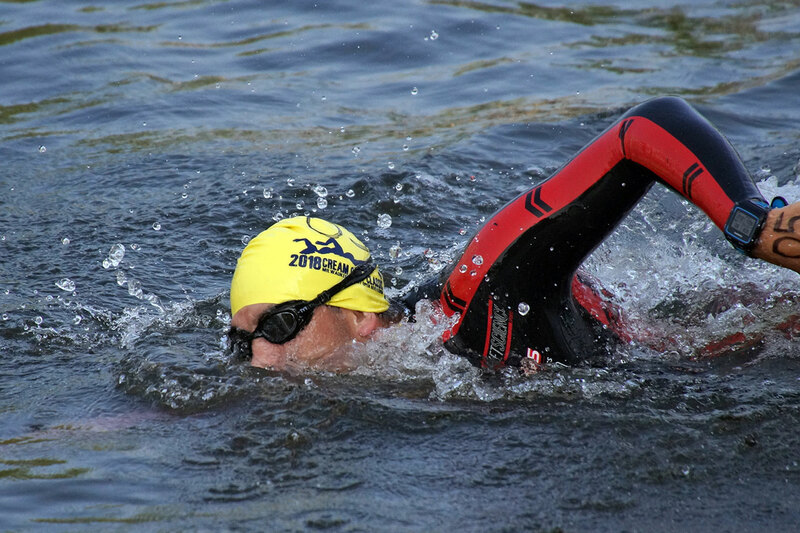 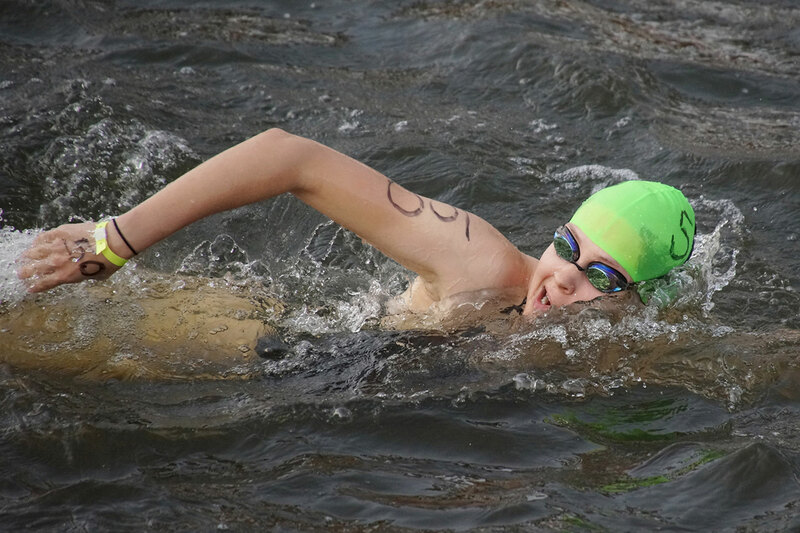 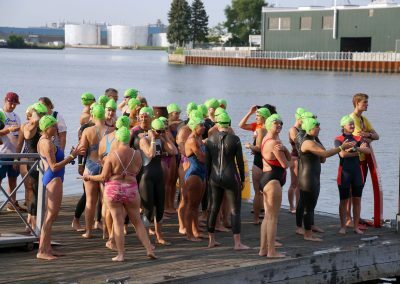 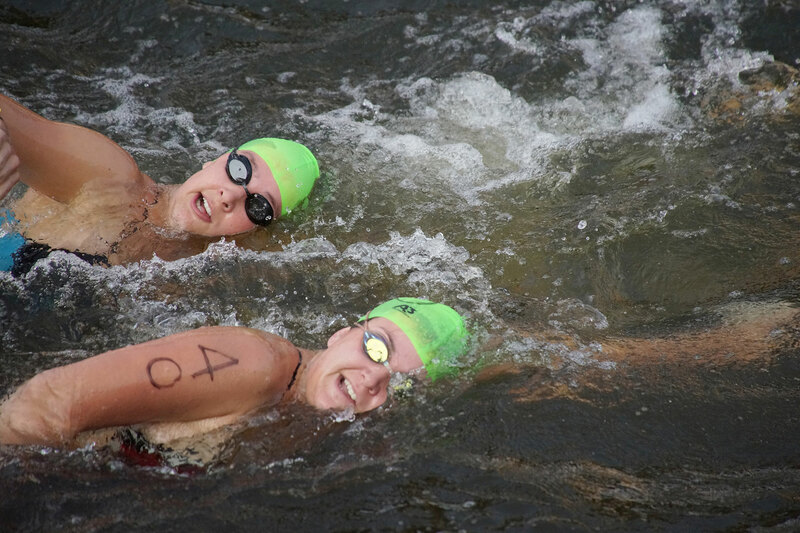 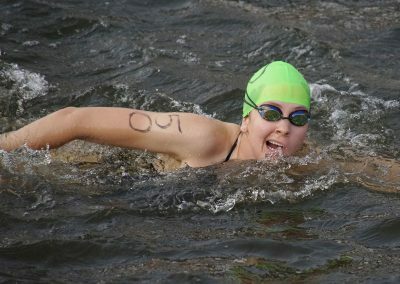 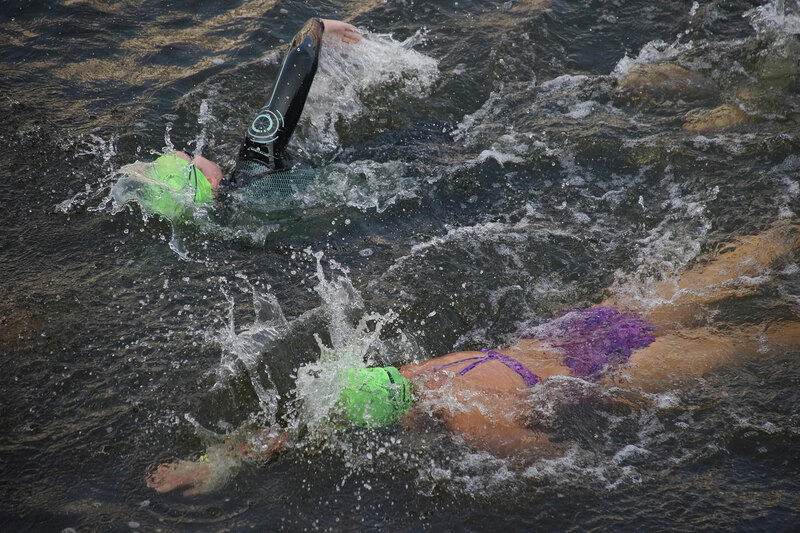 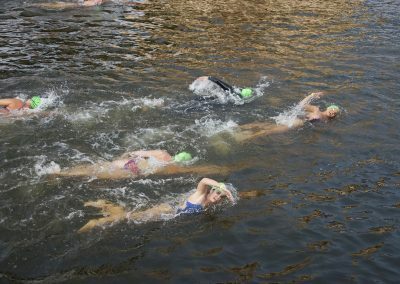 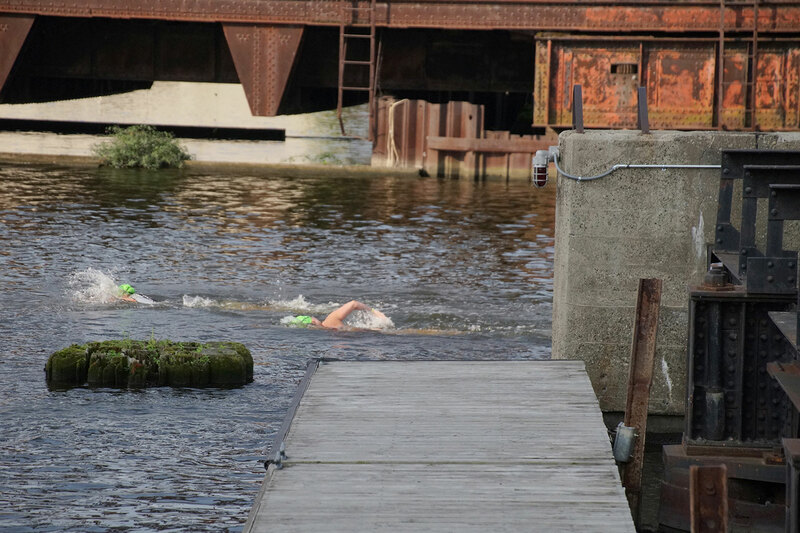 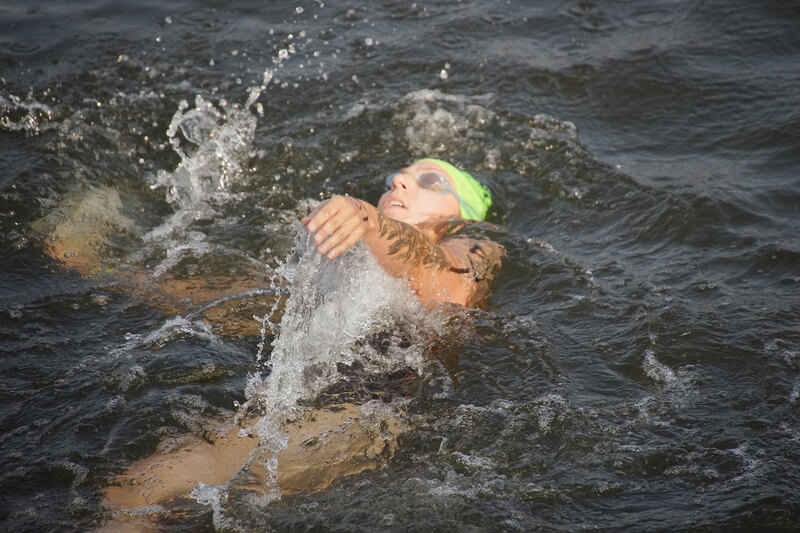 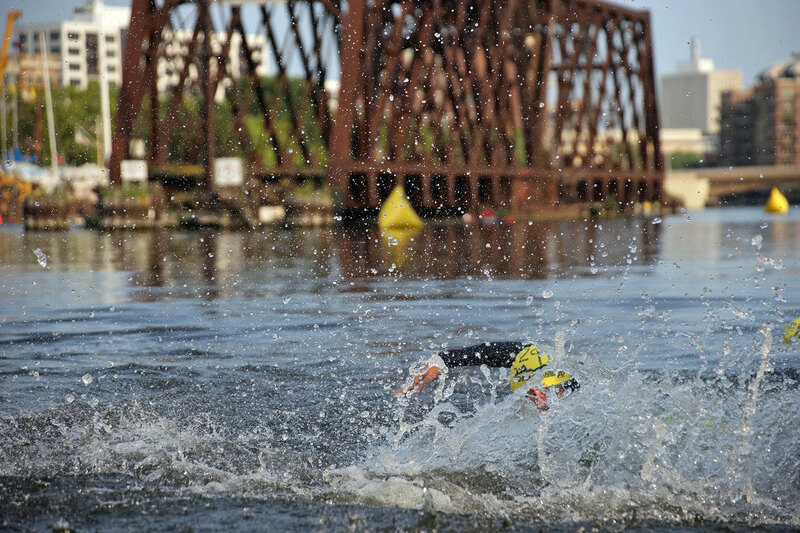 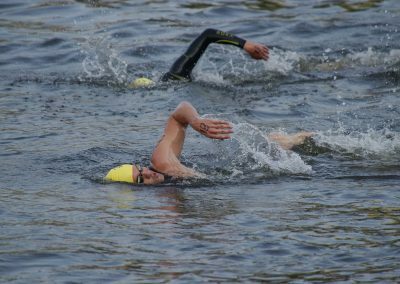 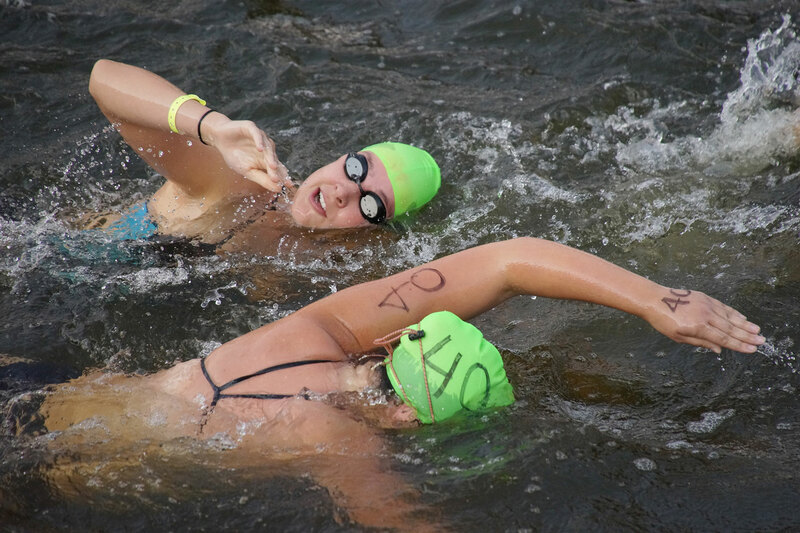 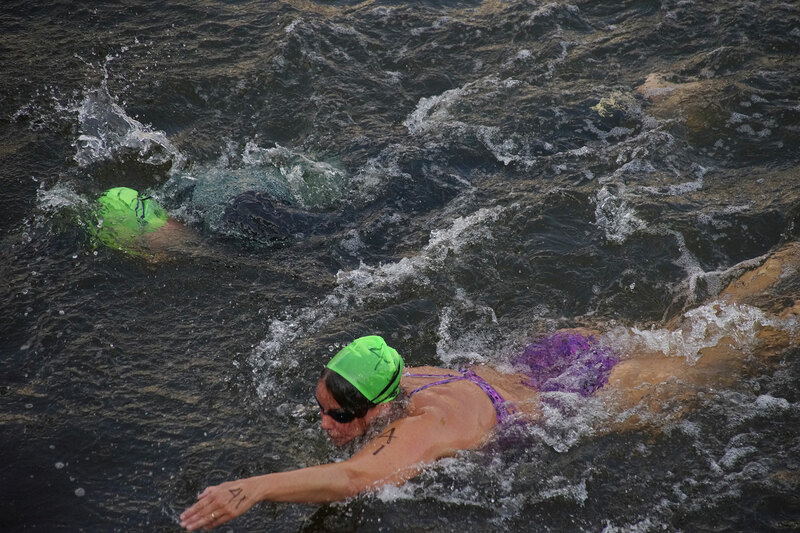 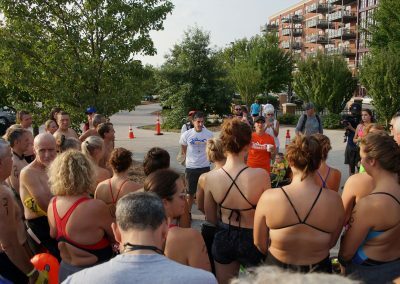 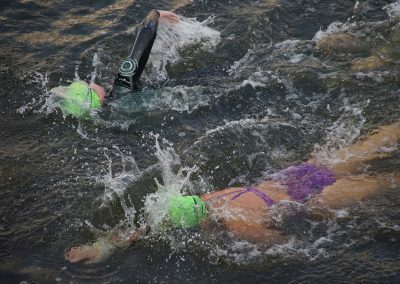 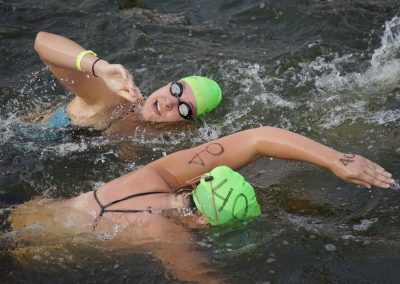 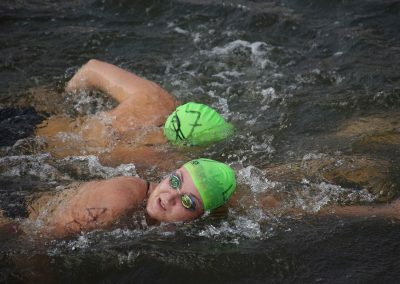 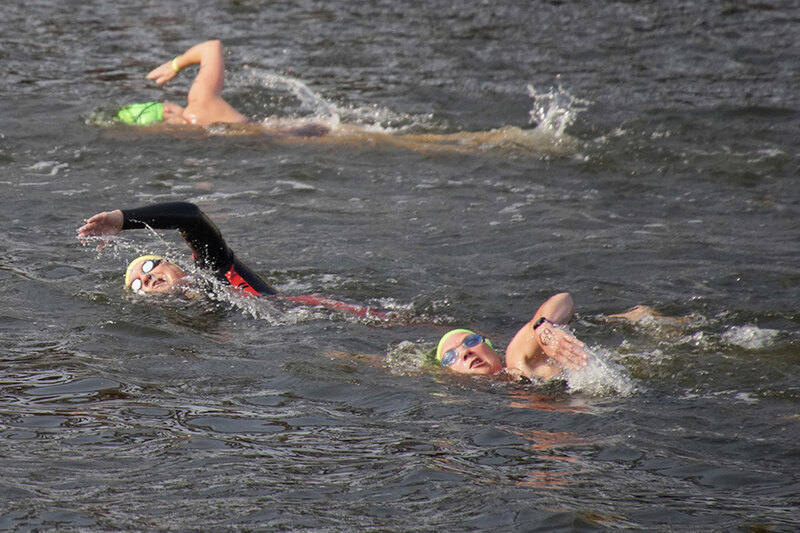 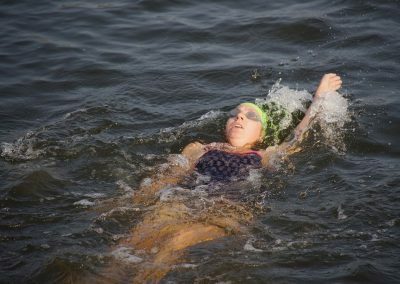 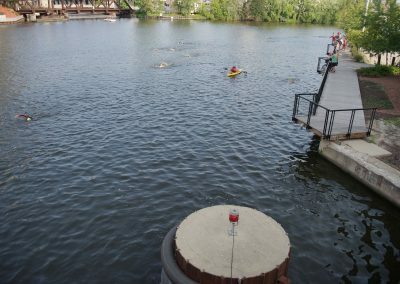 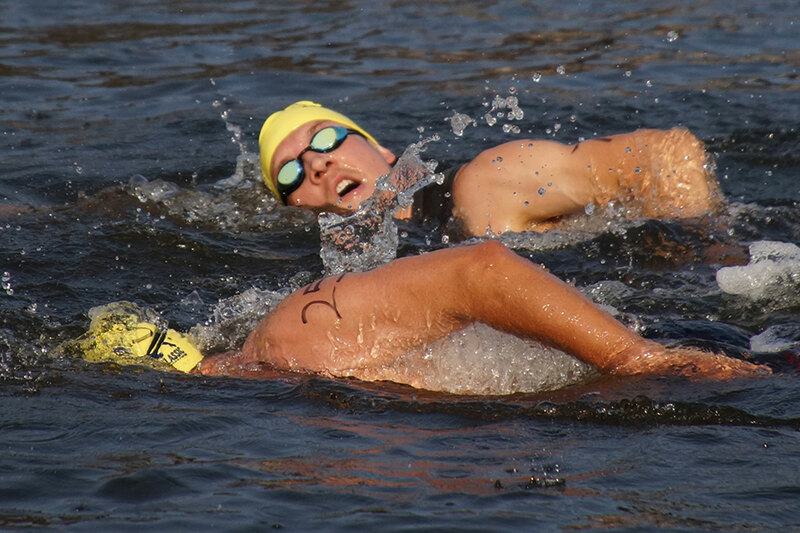 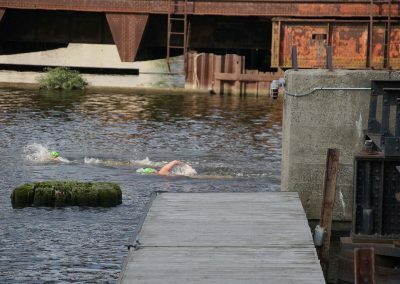 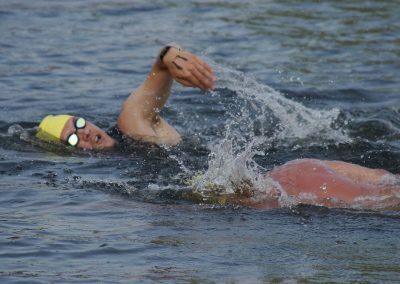 A total of 72 master swimmers completed the historical swim, bringing attention to the sizable efforts made over the years on the river’s cleanup. 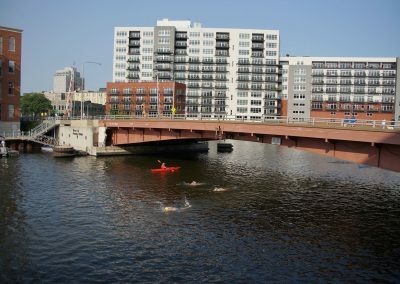 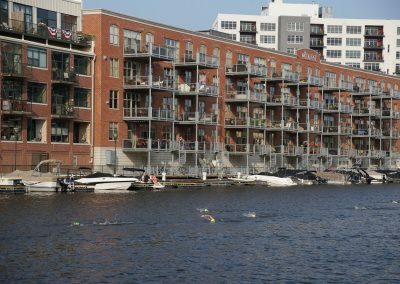 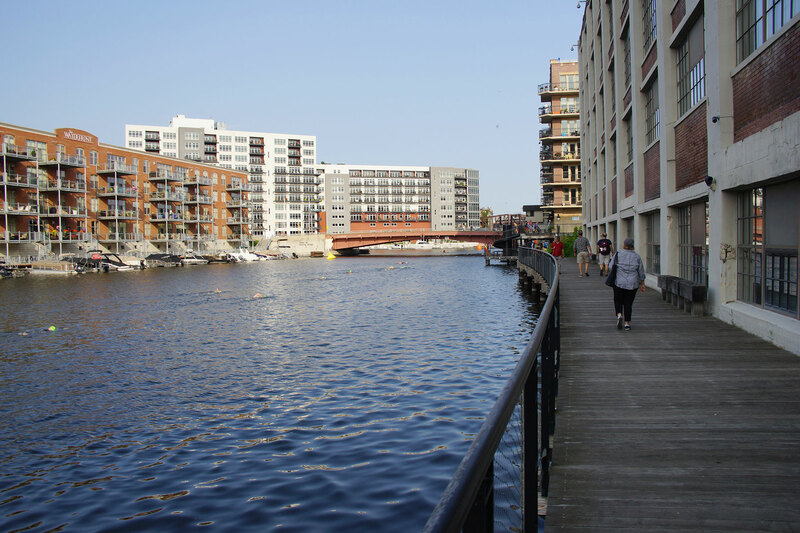 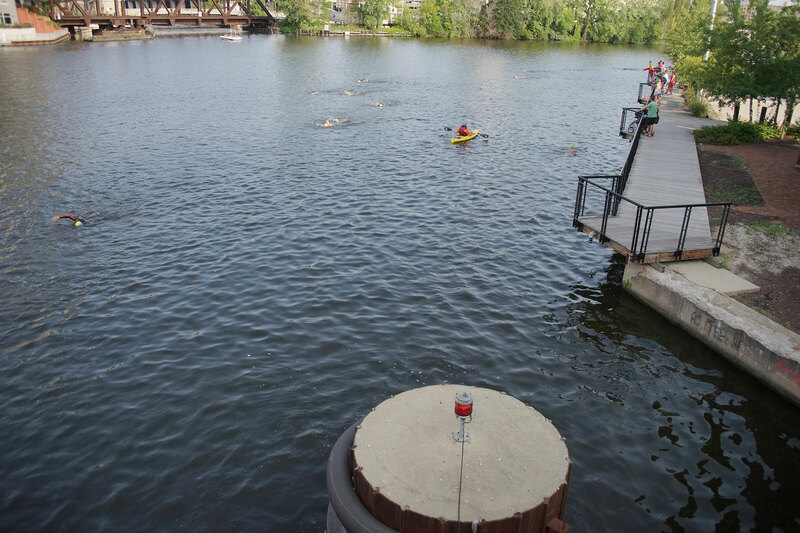 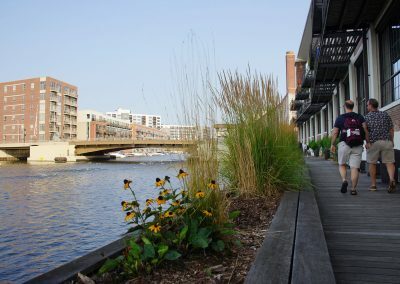 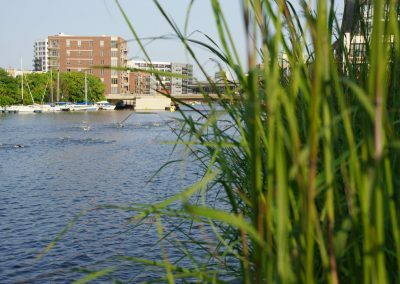 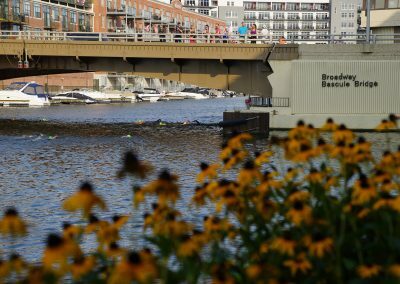 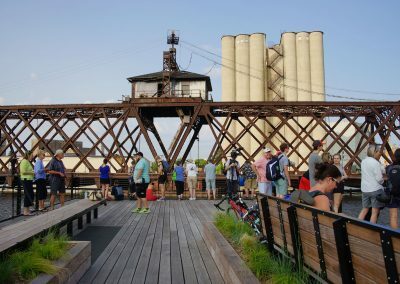 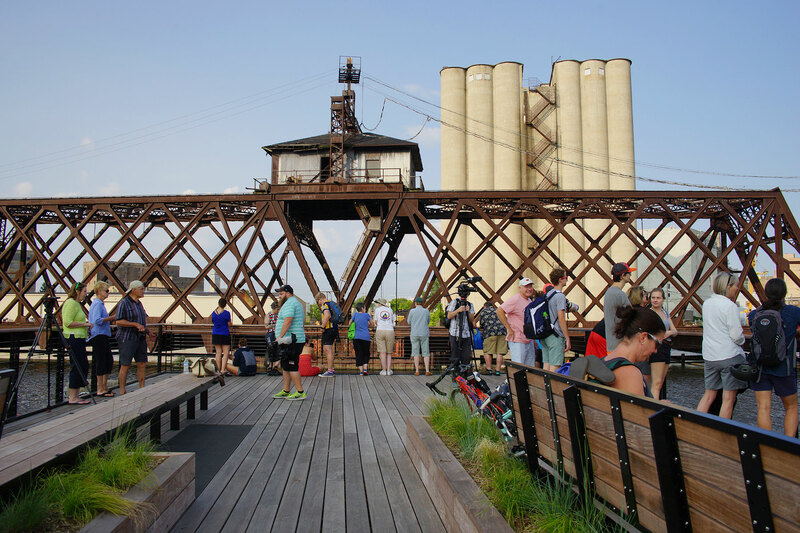 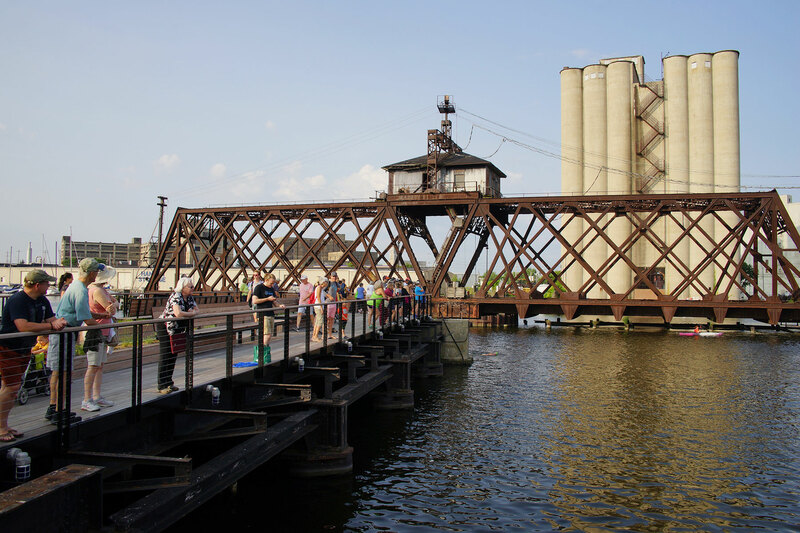 Not since the early days of Milwaukee’s founding, before the waterways were used to support industry, have residents used the river for recreational activity, and they did so further up stream. 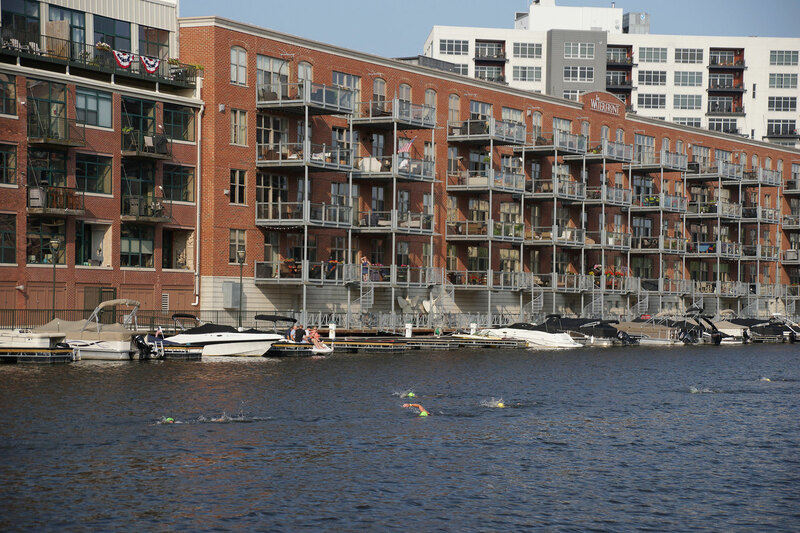 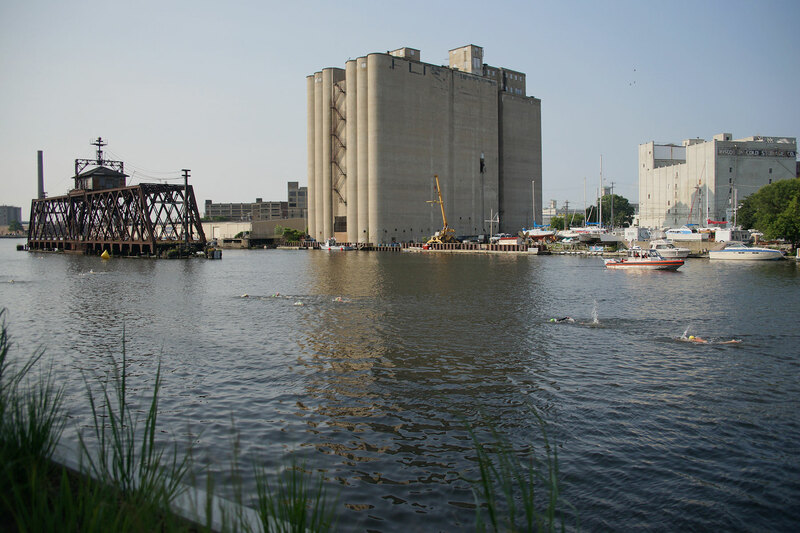 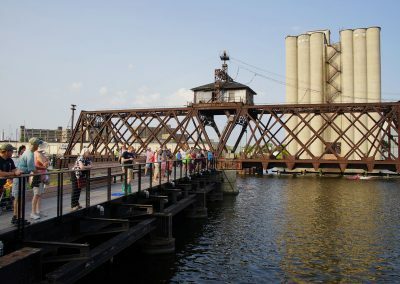 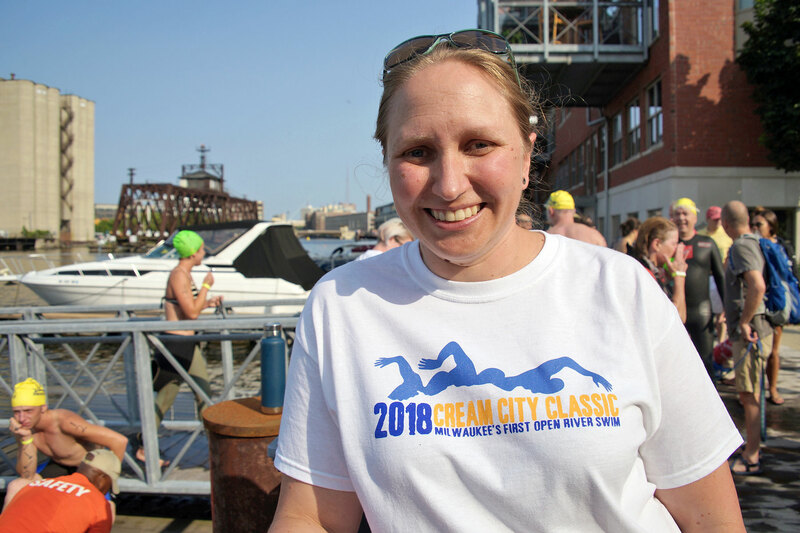 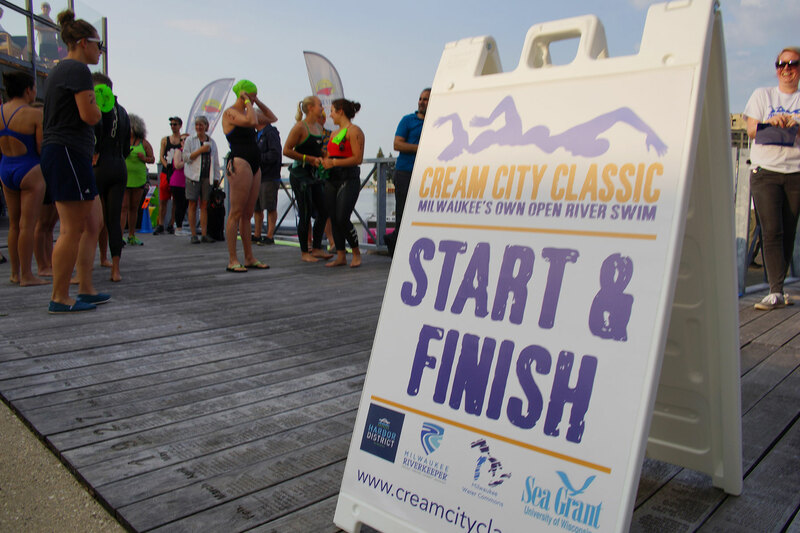 The 2018 Cream City Classic’s 1.5 mile course started where the Milwaukee River meets Lake Michigan, the Public Pier at Jackson and Erie Streets in the Third Ward, went 3/4 mile upstream to a turnaround buoy at St. Paul Avenue, and returned to the Erie Street Pier to finish. 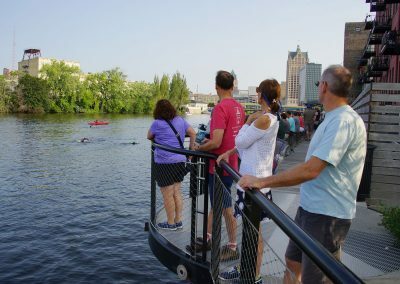 The event was a long overdue opportunity for Milwaukee to celebrate how far the city has come with its river revitalization efforts. 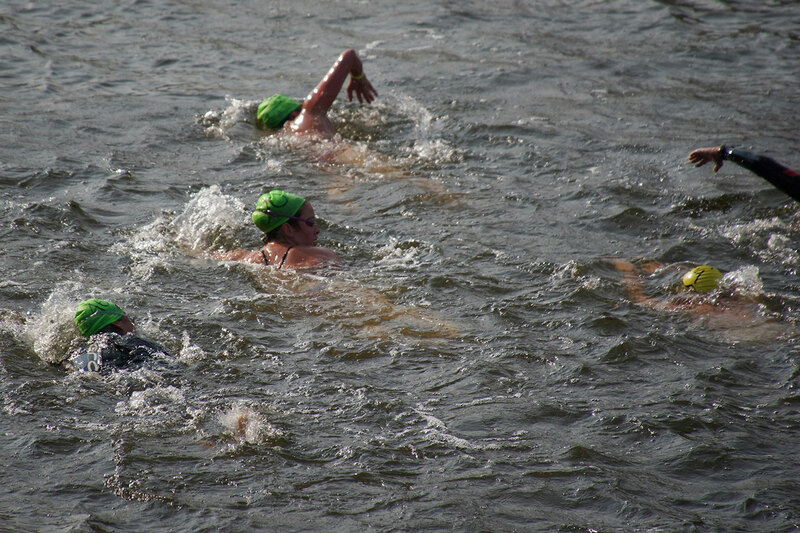 The race helped promote ongoing stewardship so that residents can enjoy the area’s water resources. 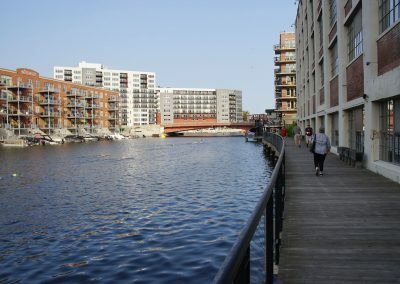 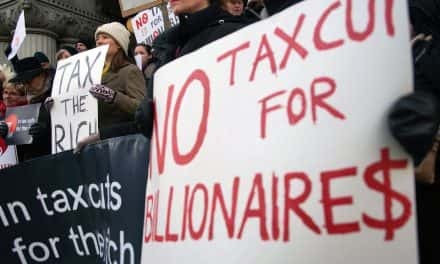 The location and date were chosen specifically with water quality concerns in mind, occurring in the downstream portion of the river where active mixing of water from Lake Michigan creates improved water quality conditions. 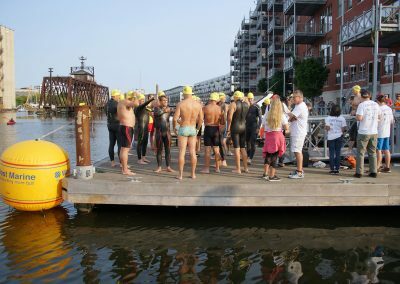 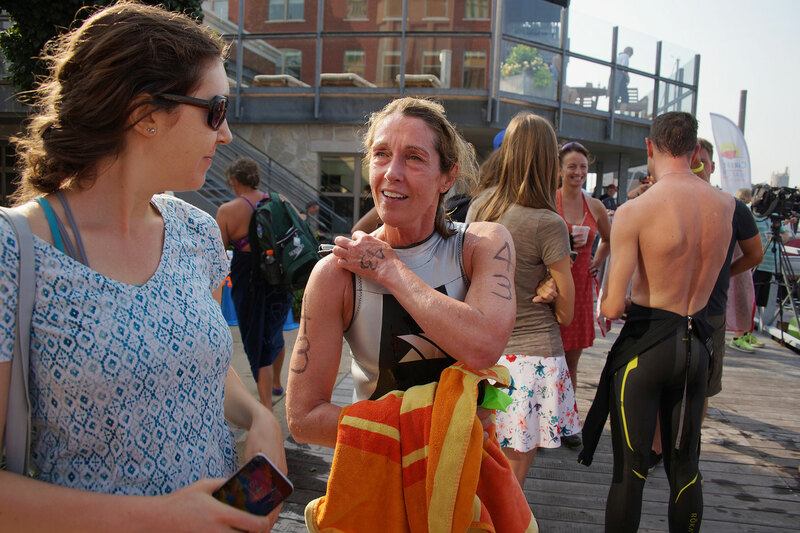 Post-race showers were also available for all swimmers immediately following their finish. 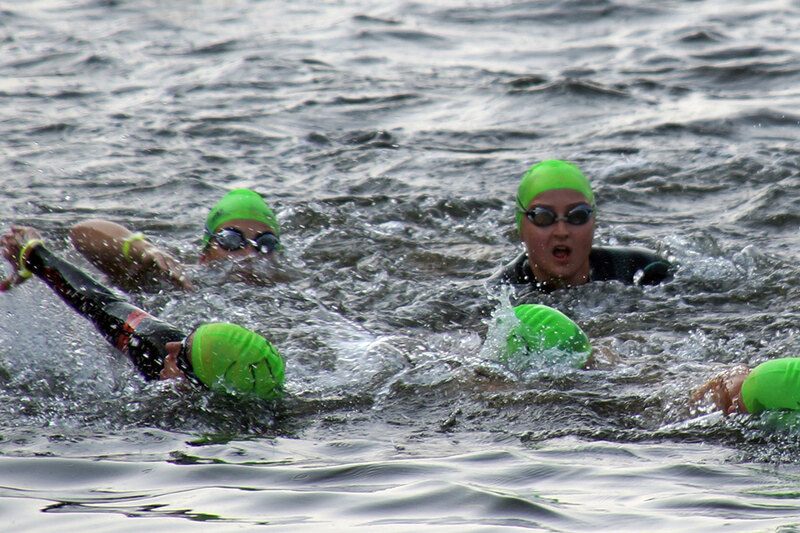 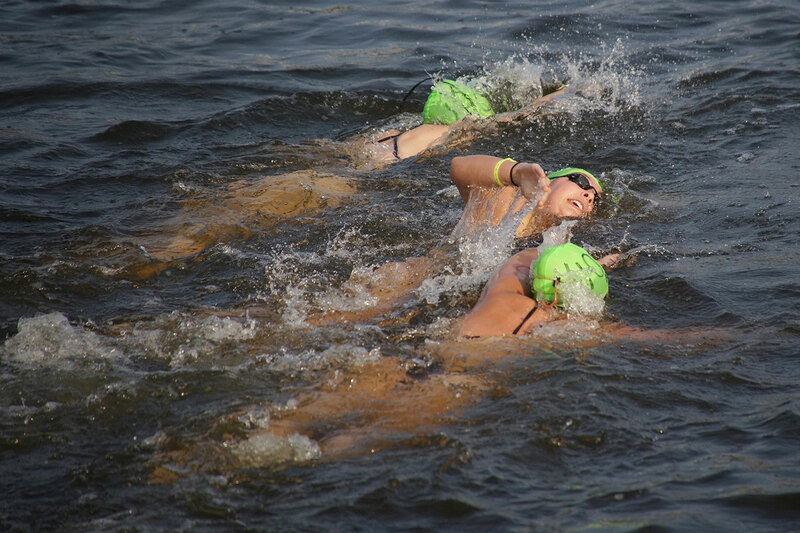 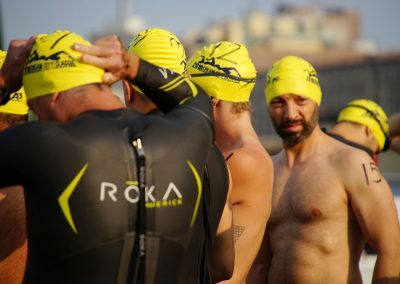 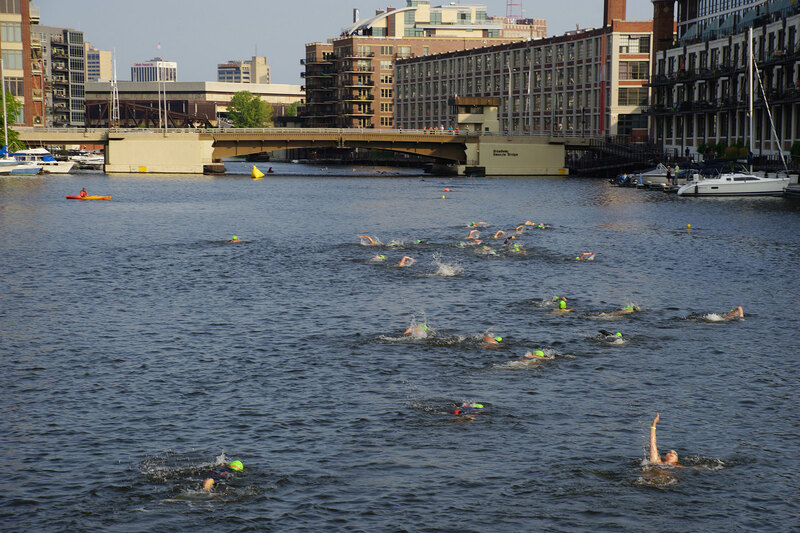 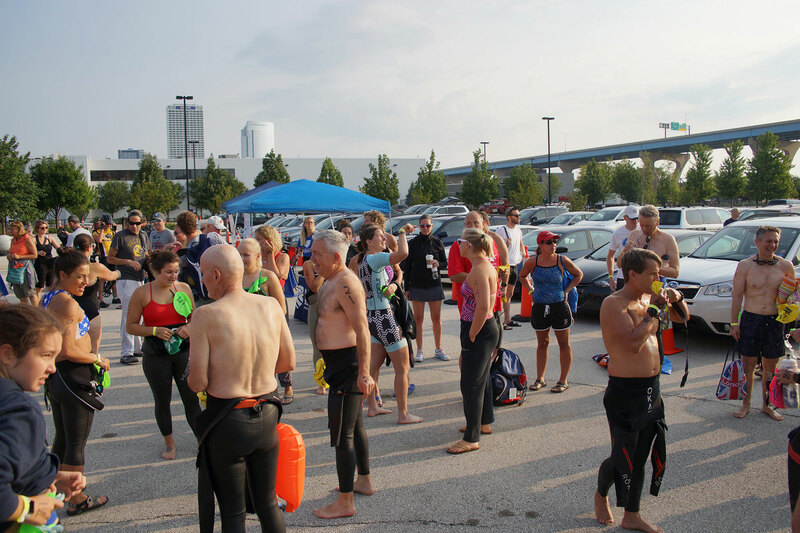 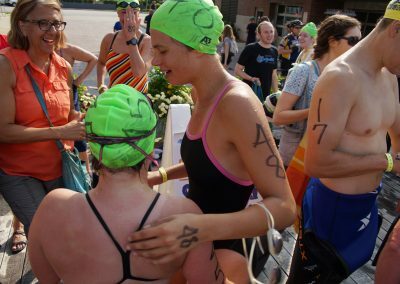 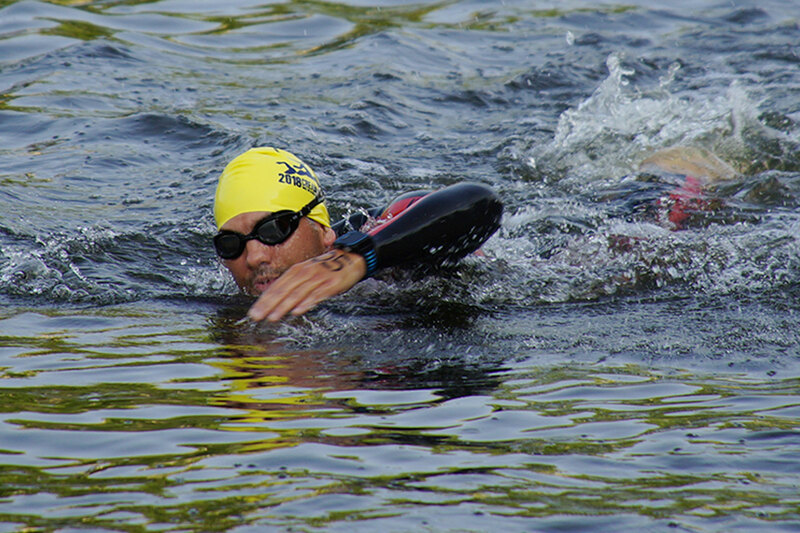 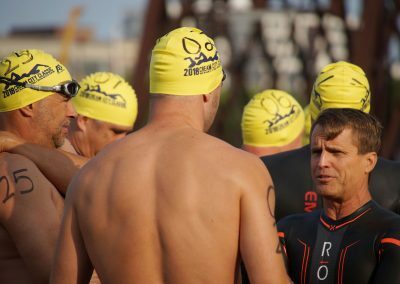 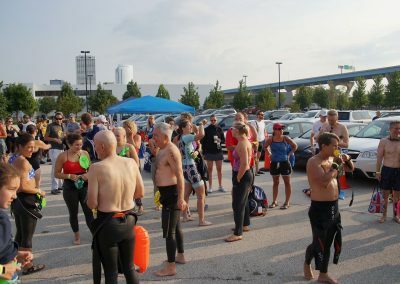 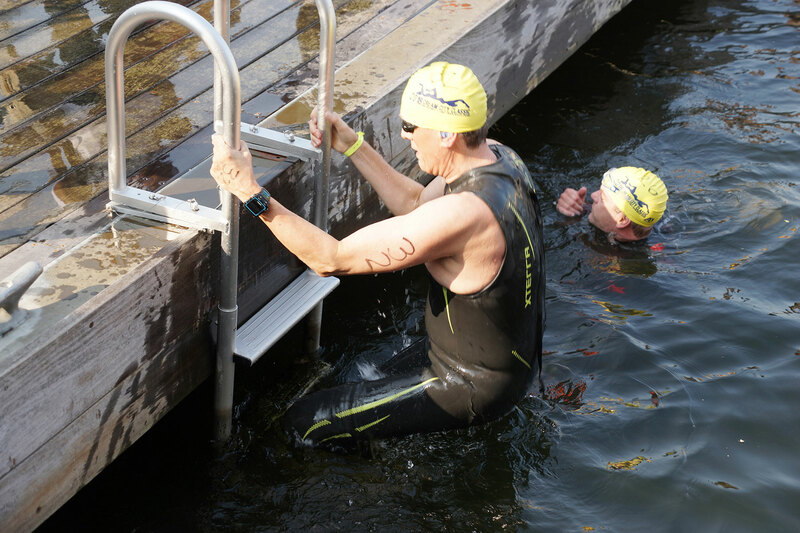 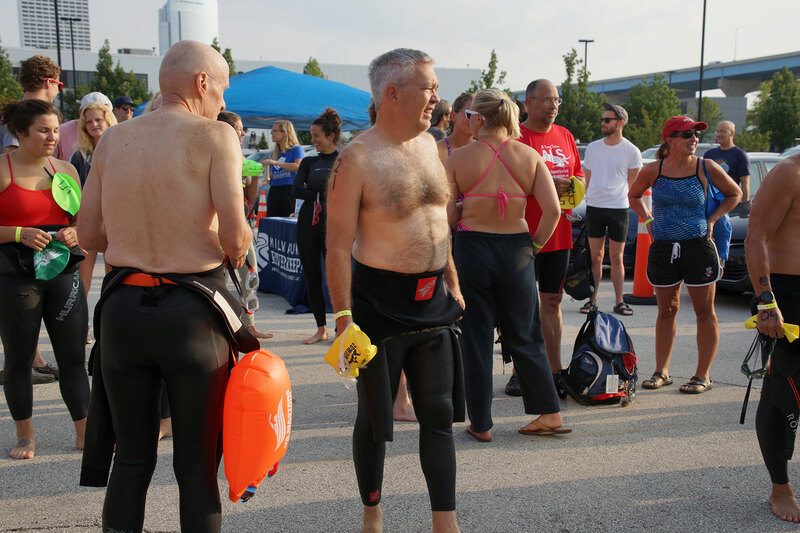 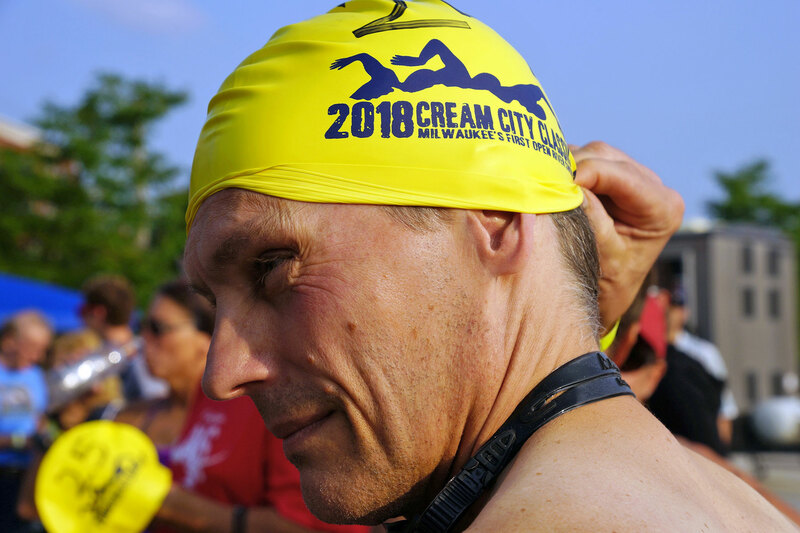 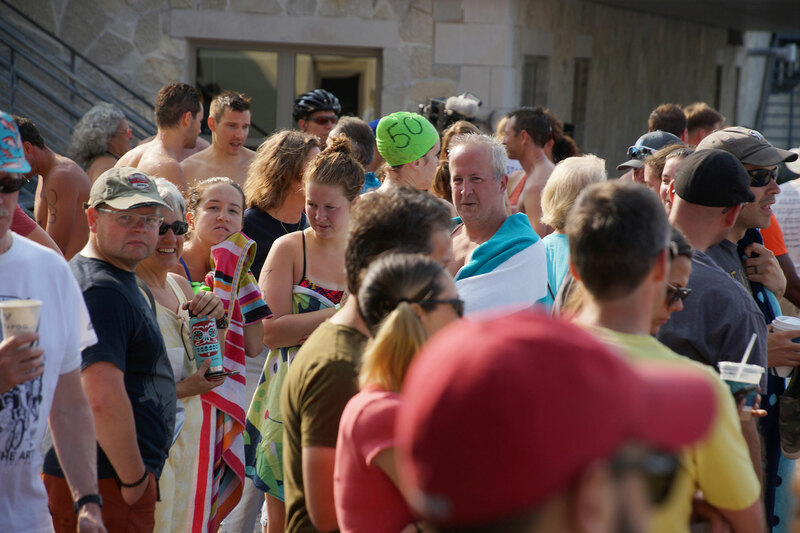 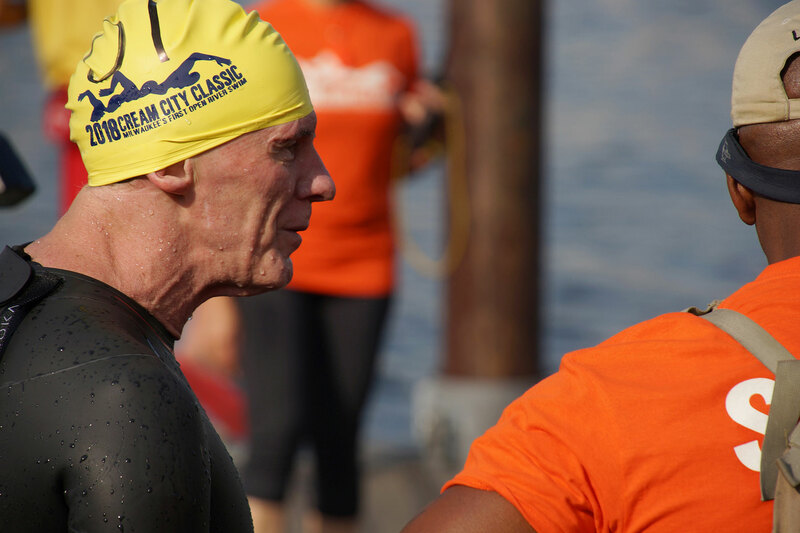 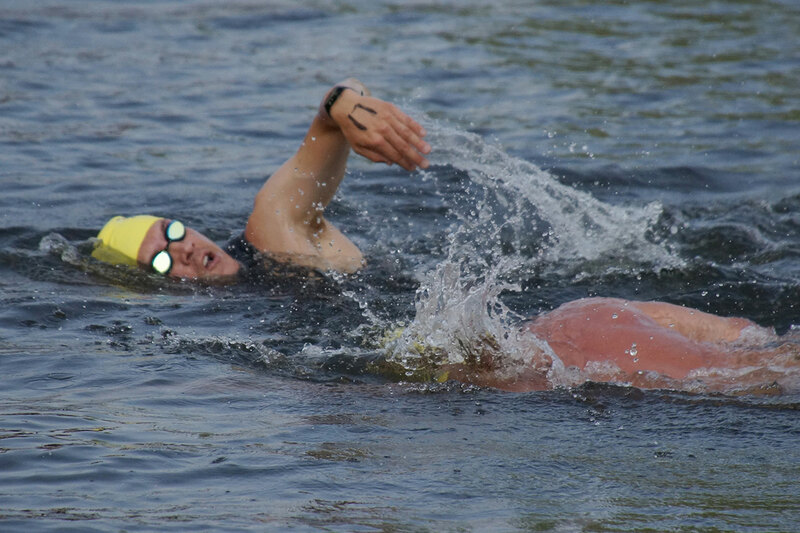 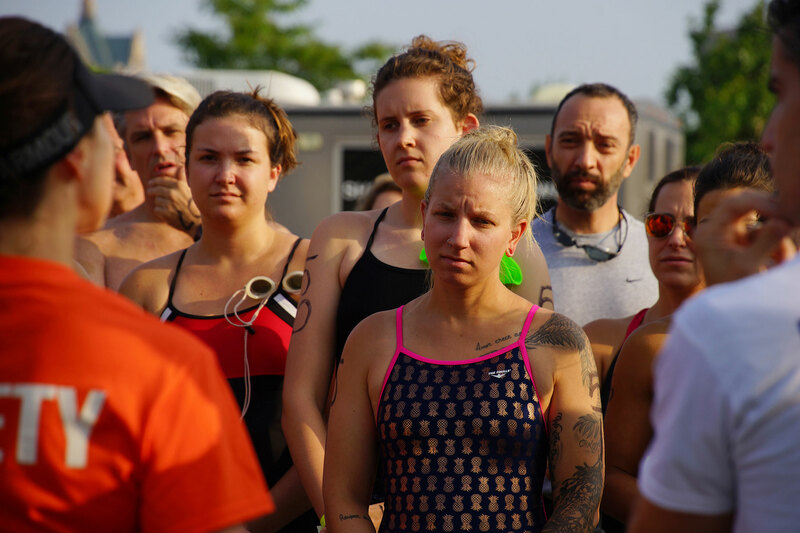 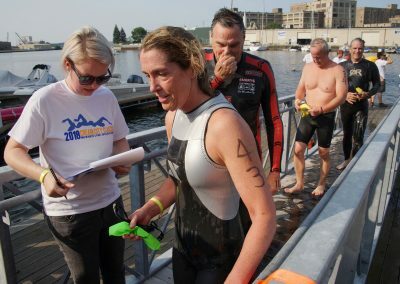 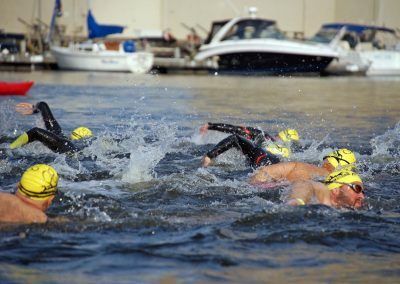 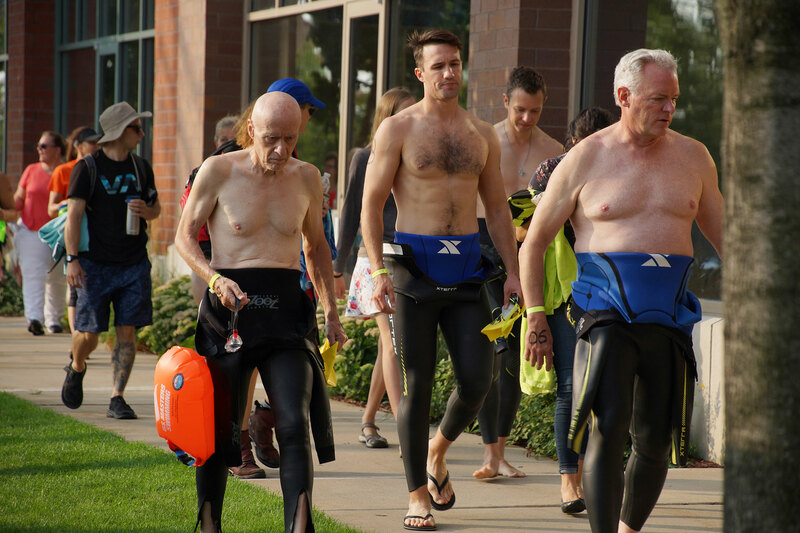 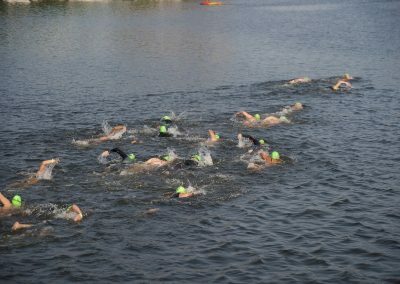 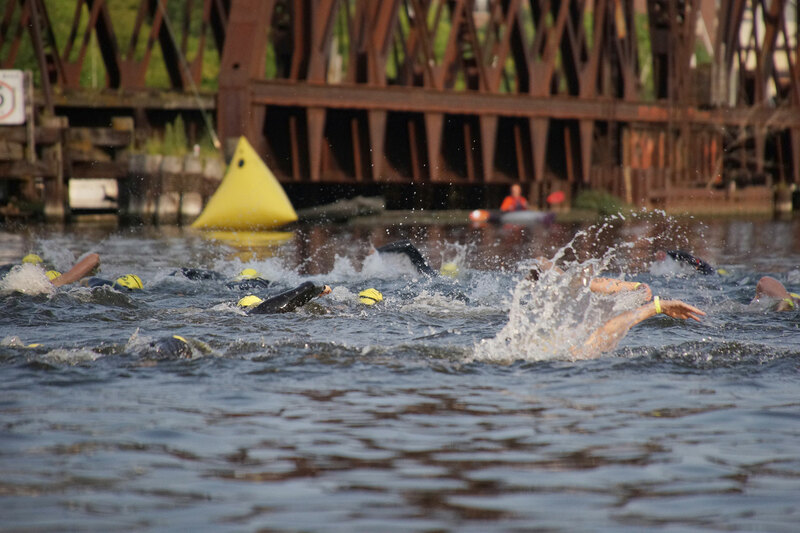 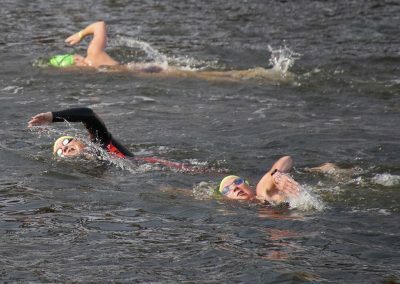 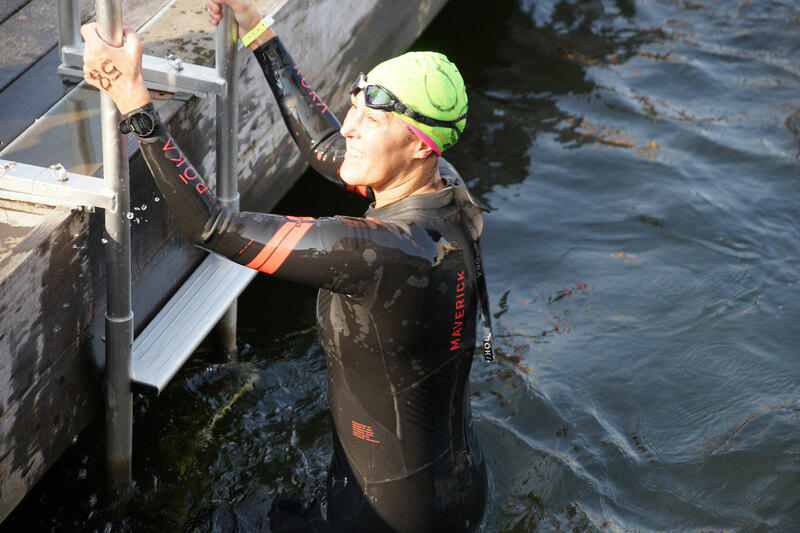 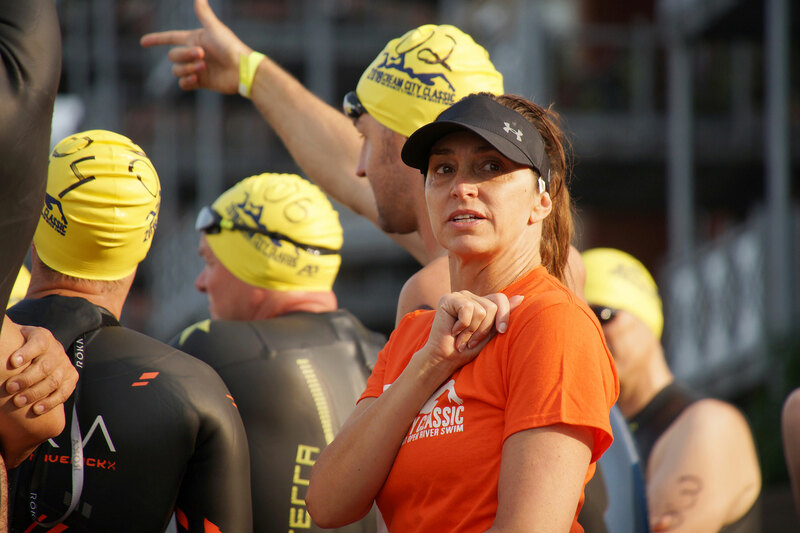 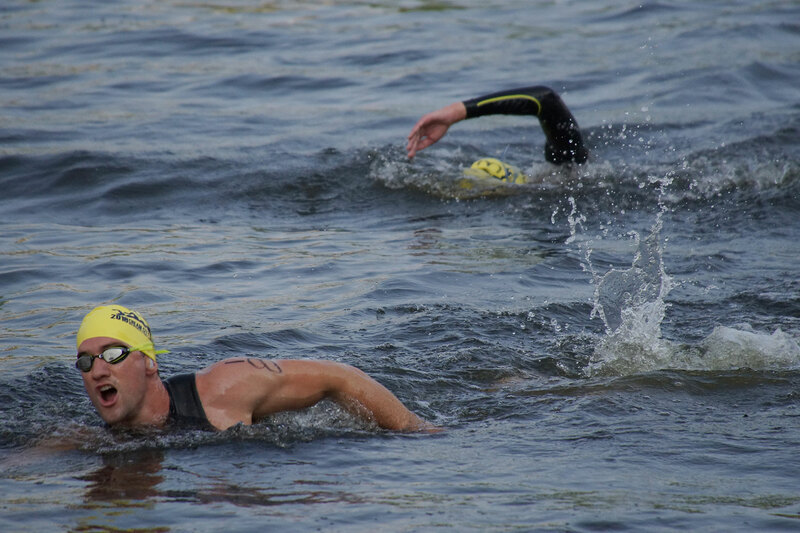 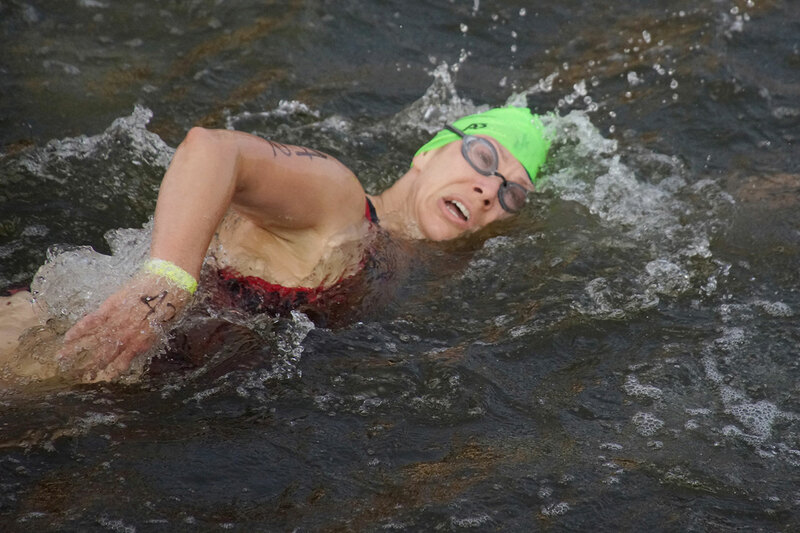 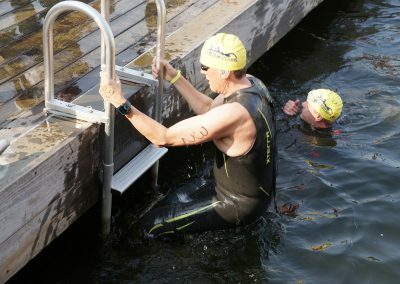 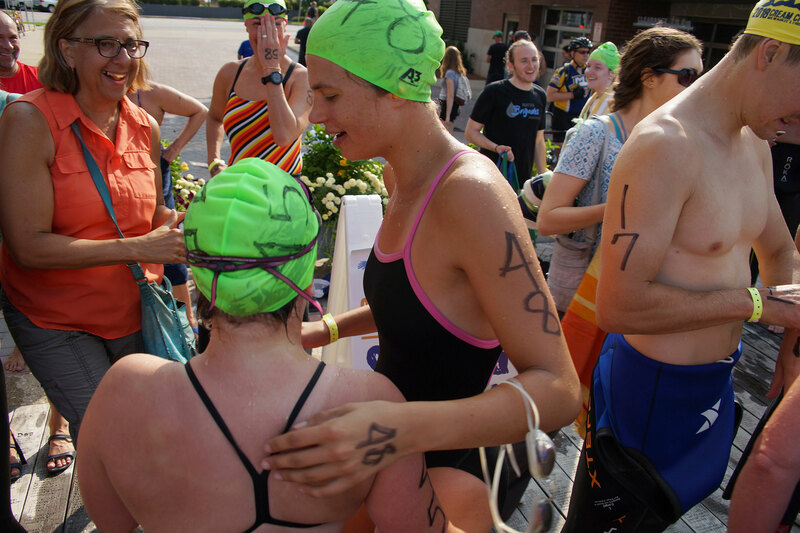 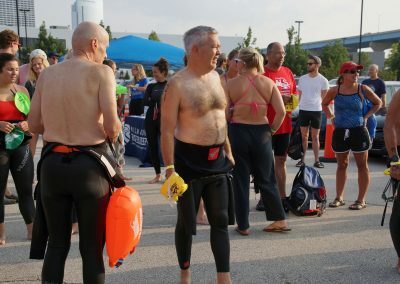 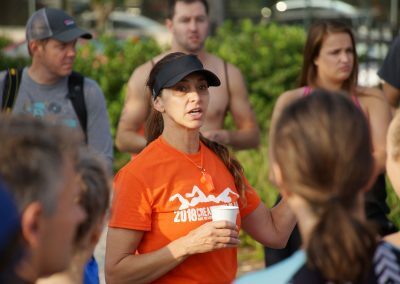 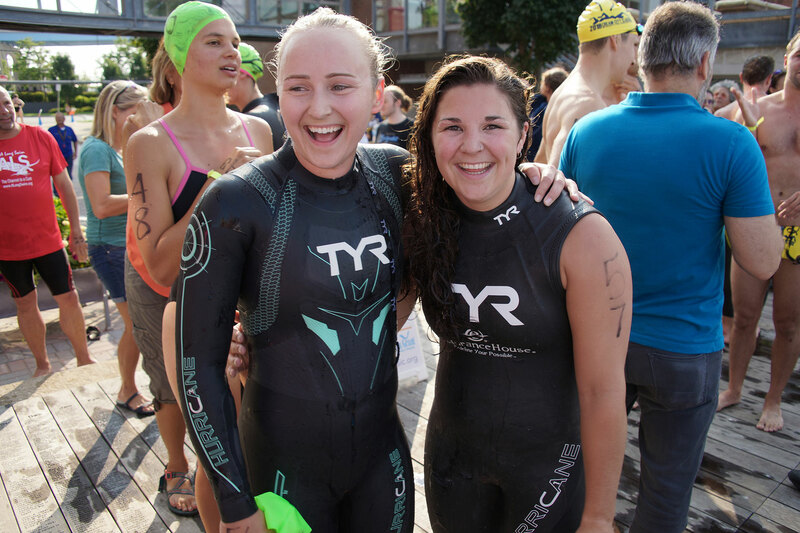 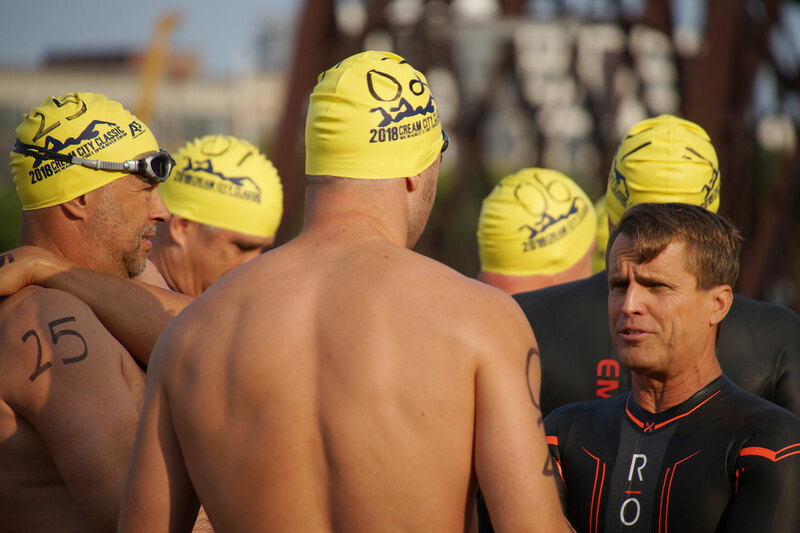 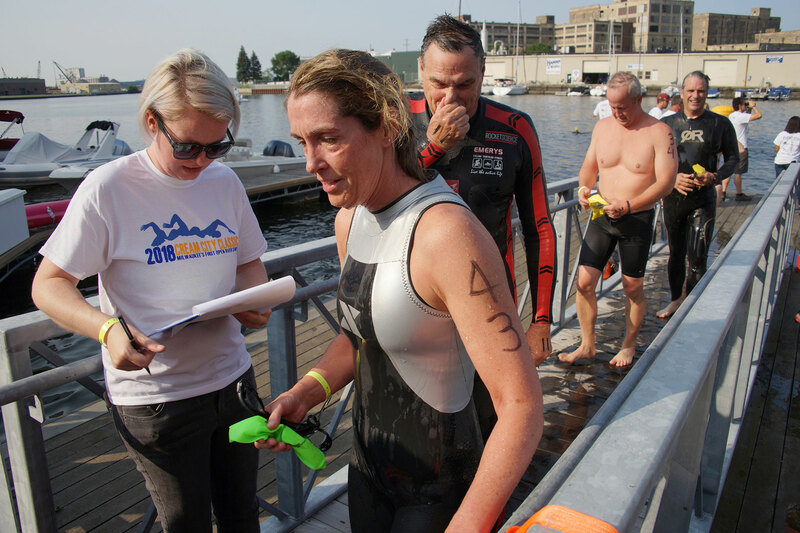 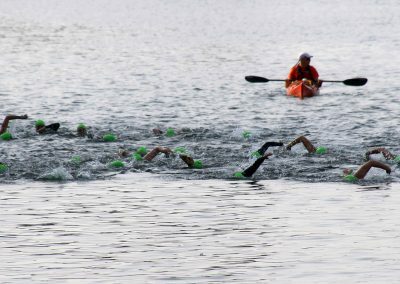 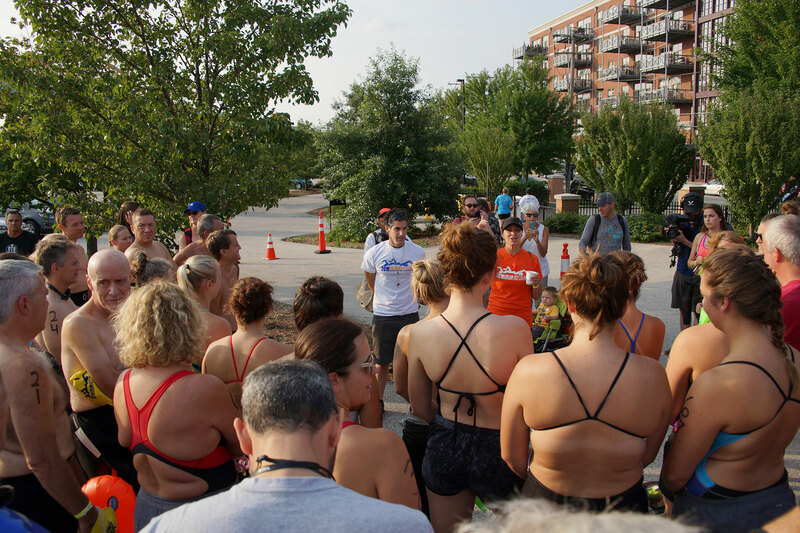 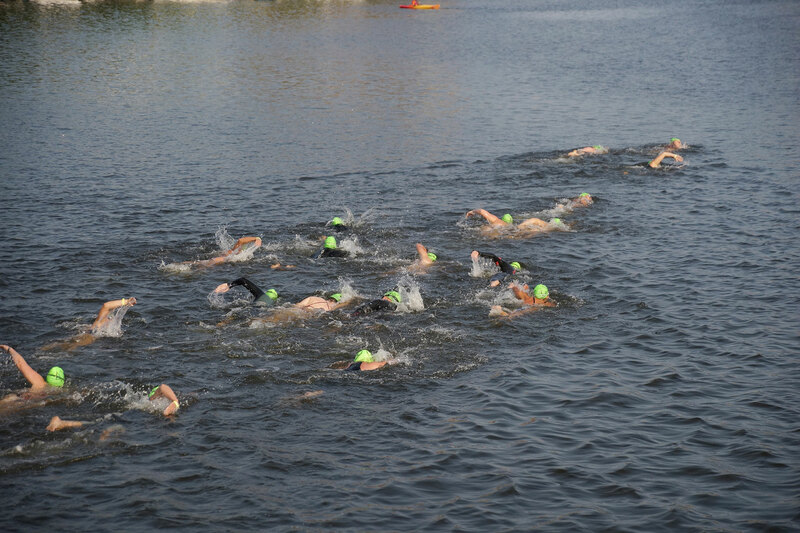 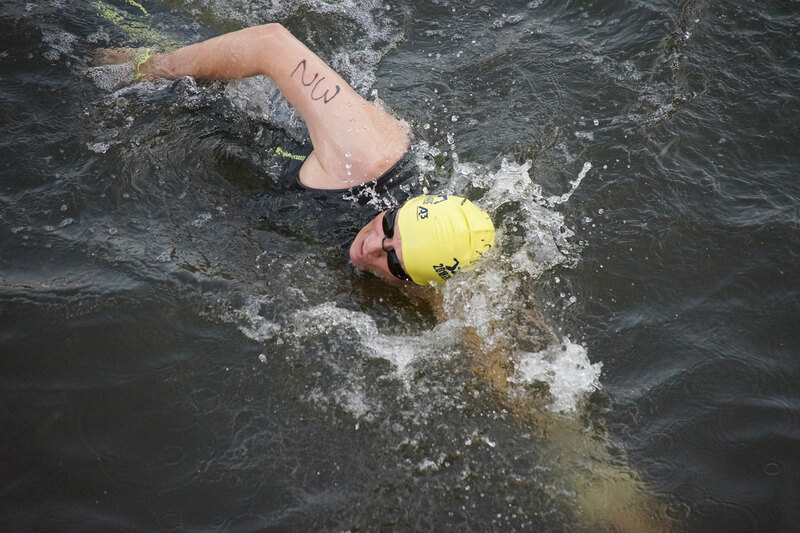 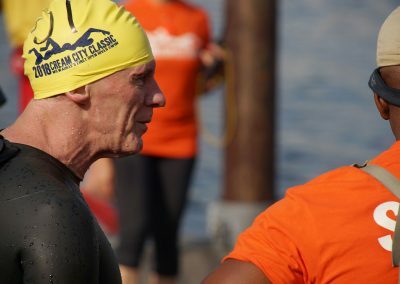 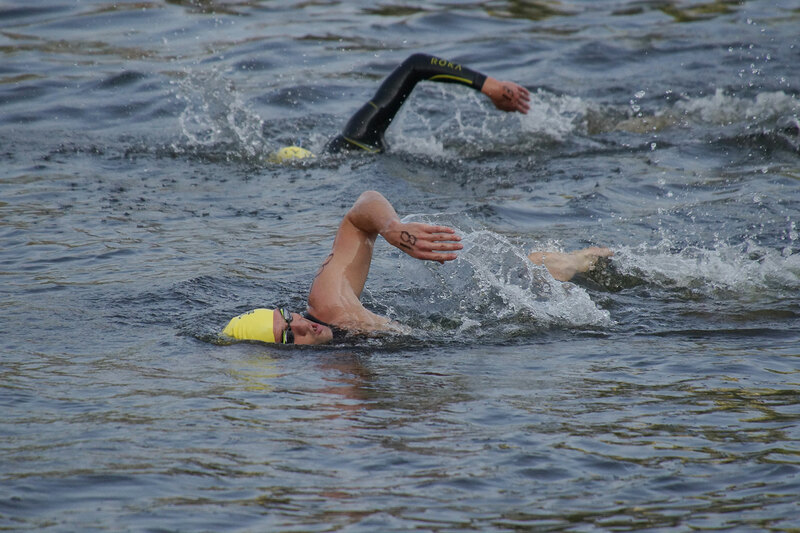 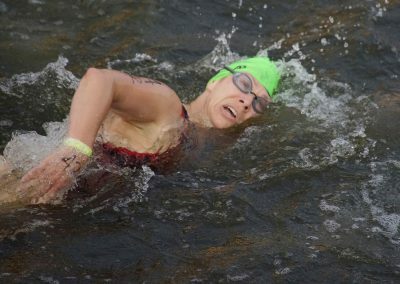 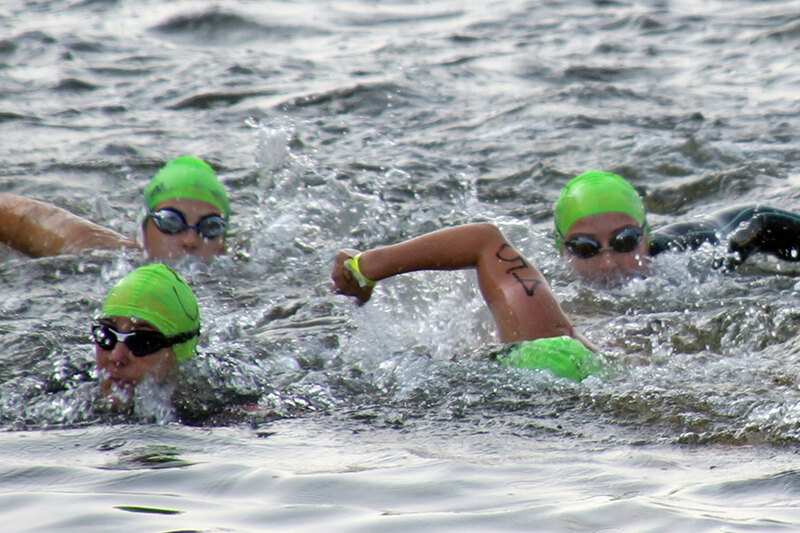 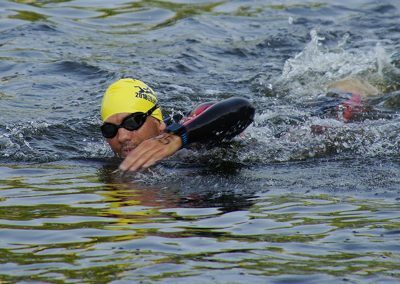 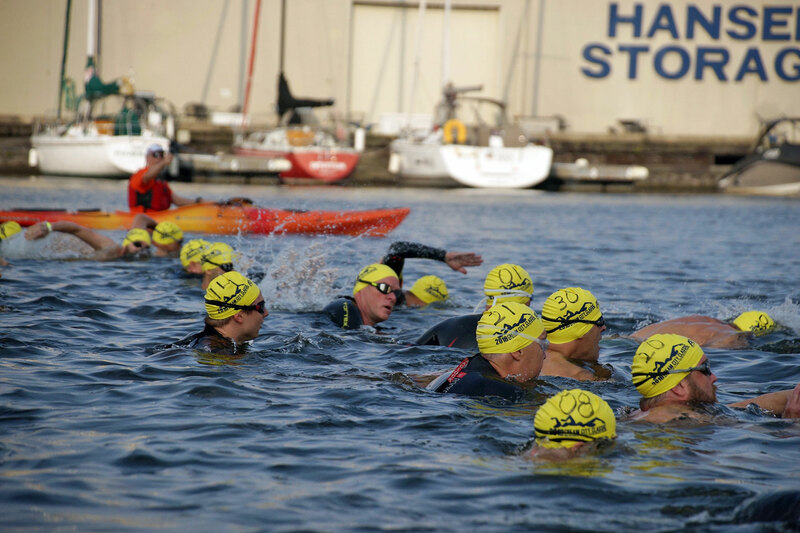 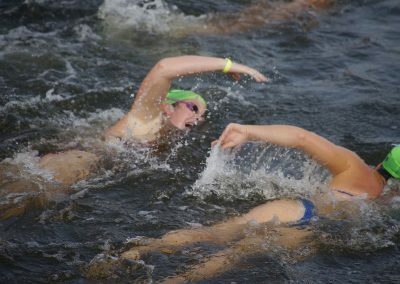 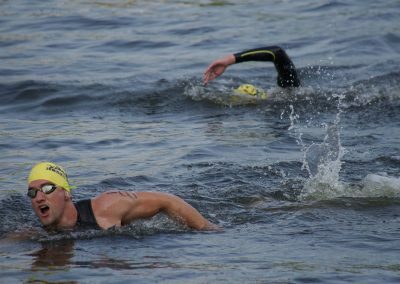 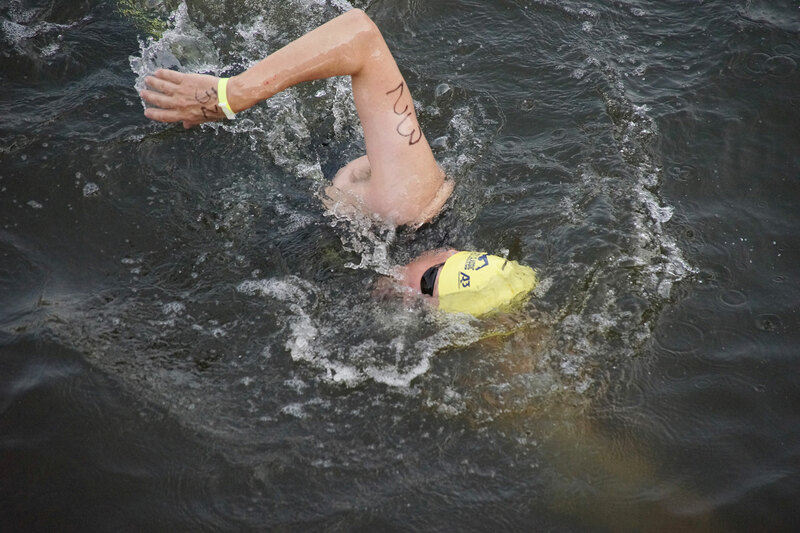 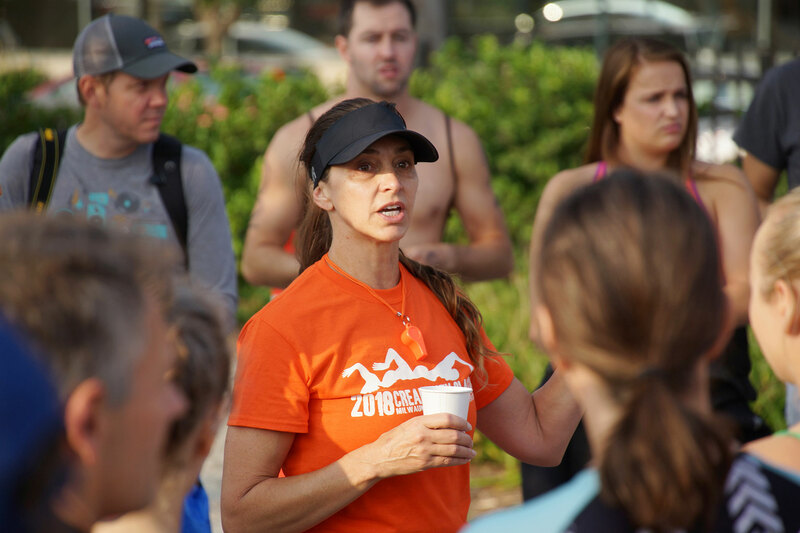 The race was not for novices, to be eligible for participation participants had to be experienced open-water swimmers and a US Masters Swimming (USMS) member, single-day memberships were offered at registration time. 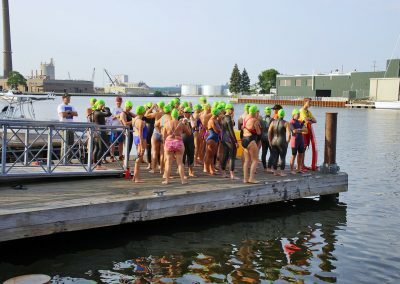 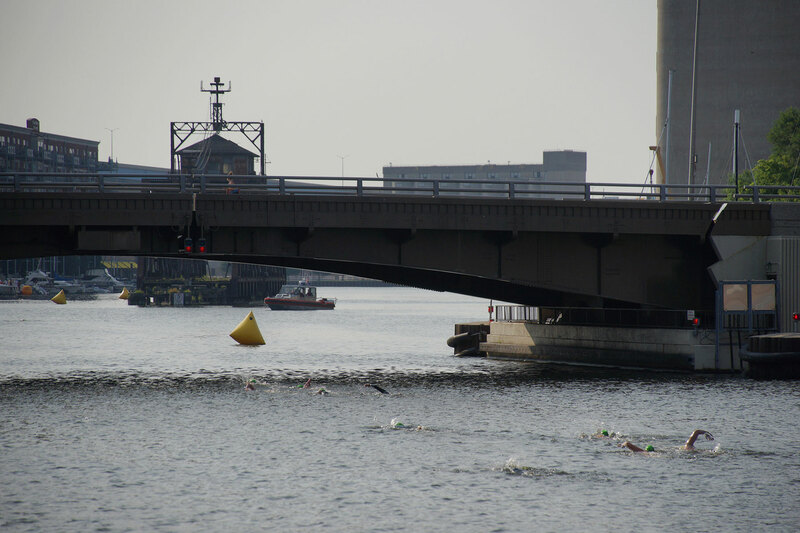 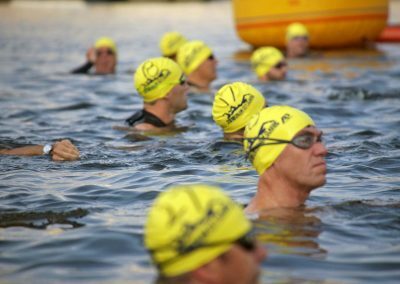 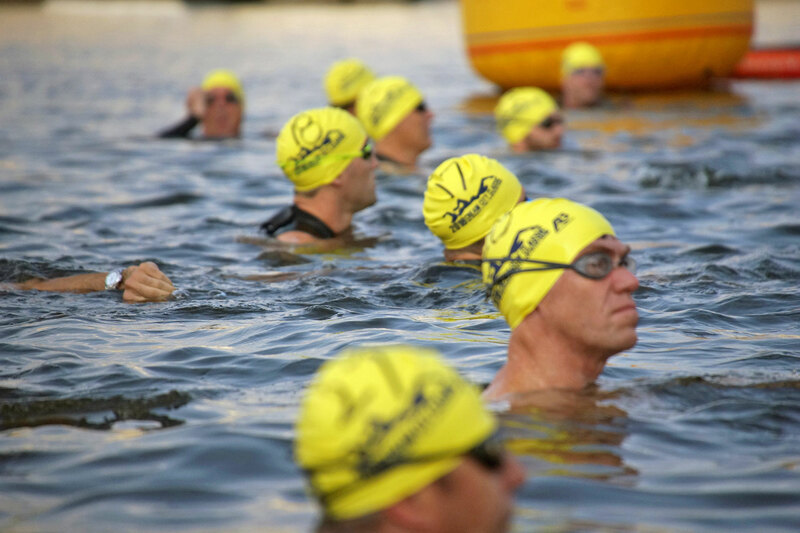 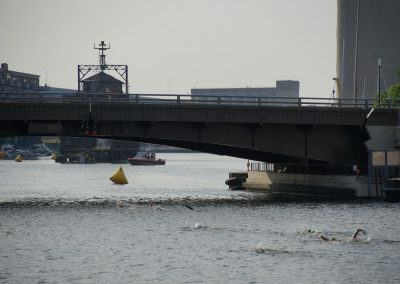 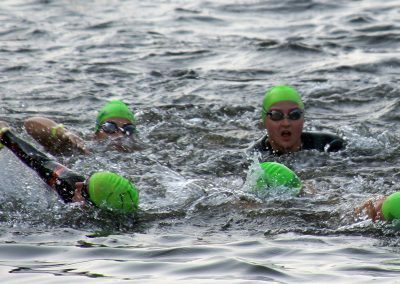 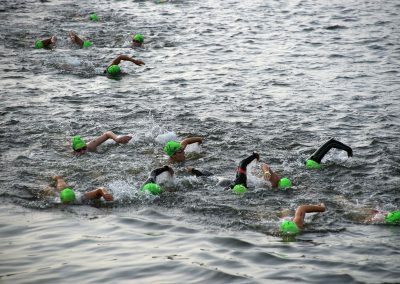 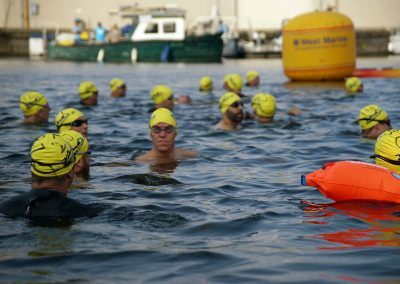 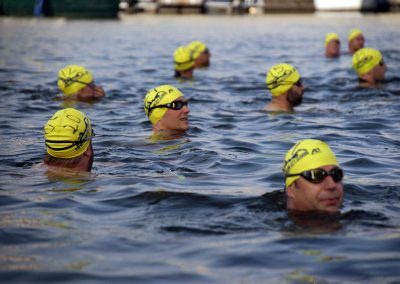 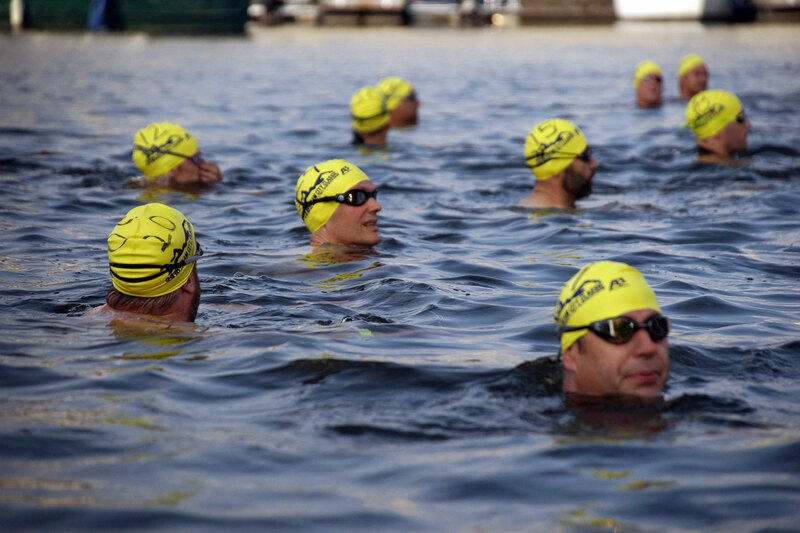 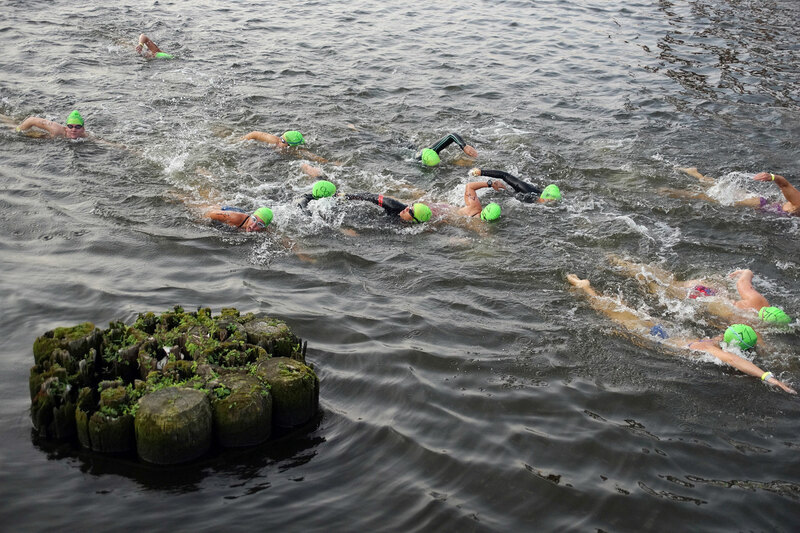 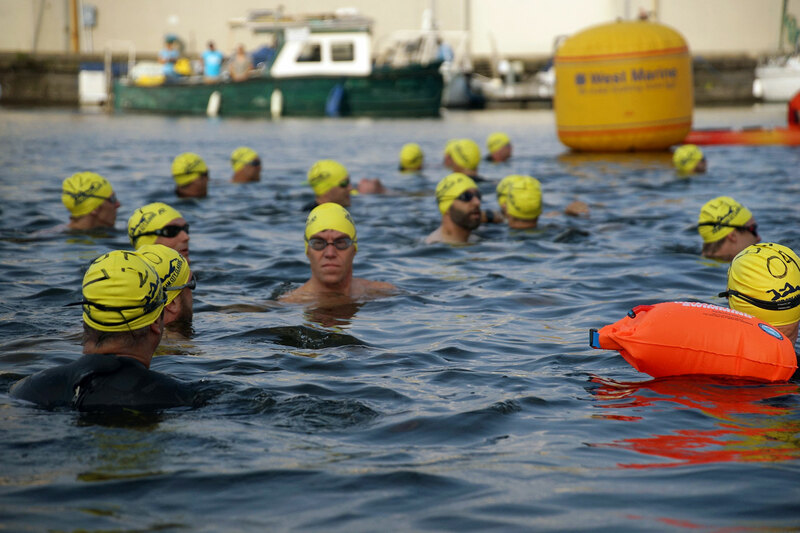 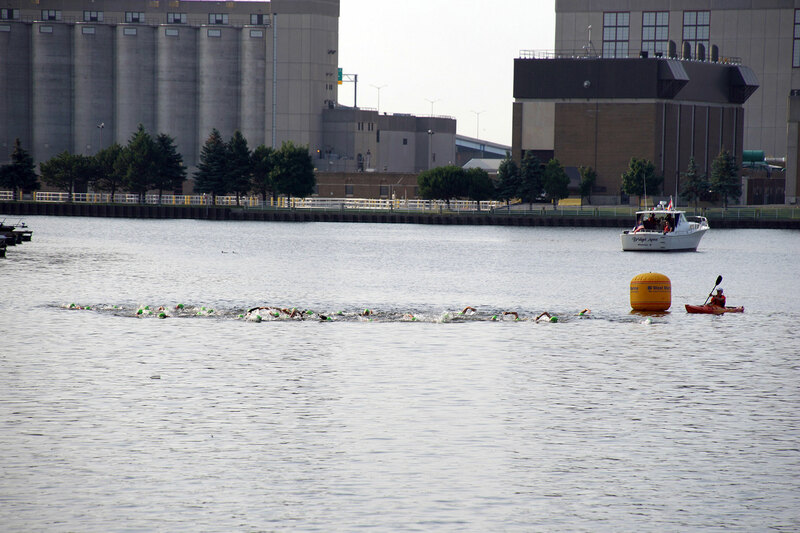 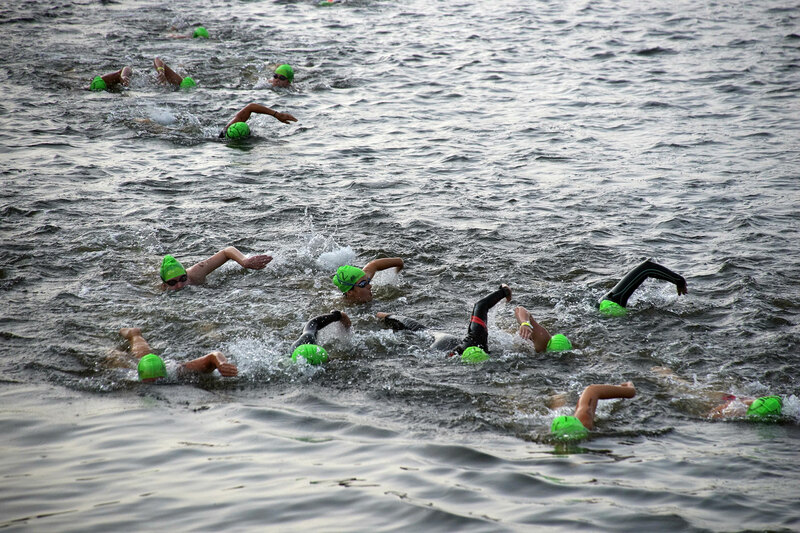 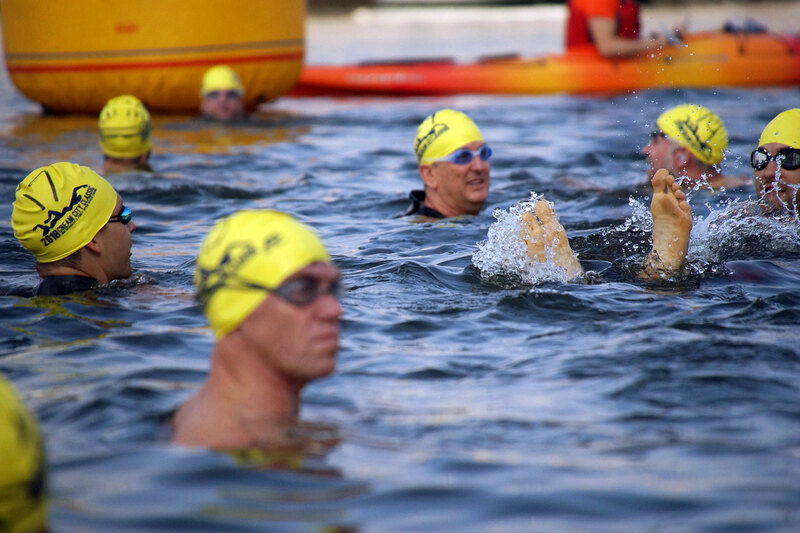 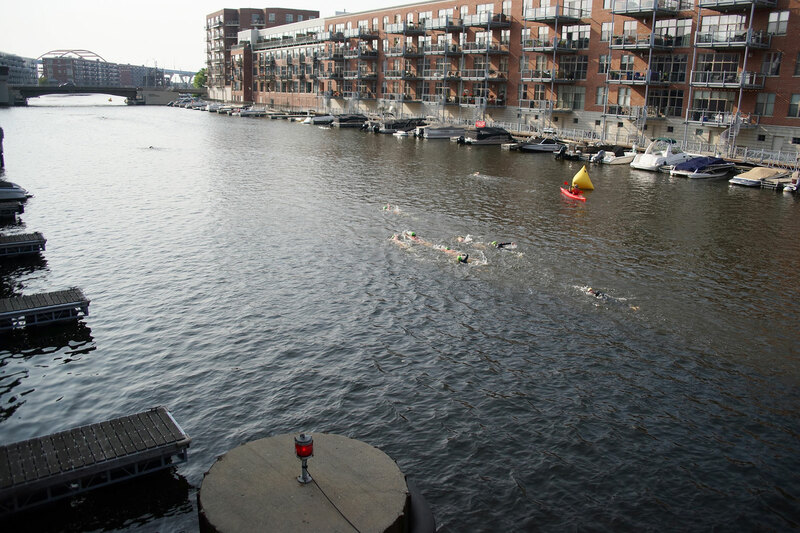 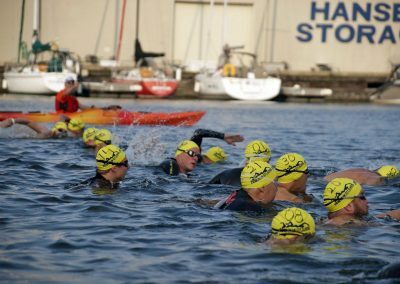 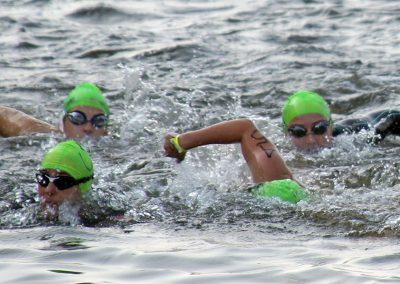 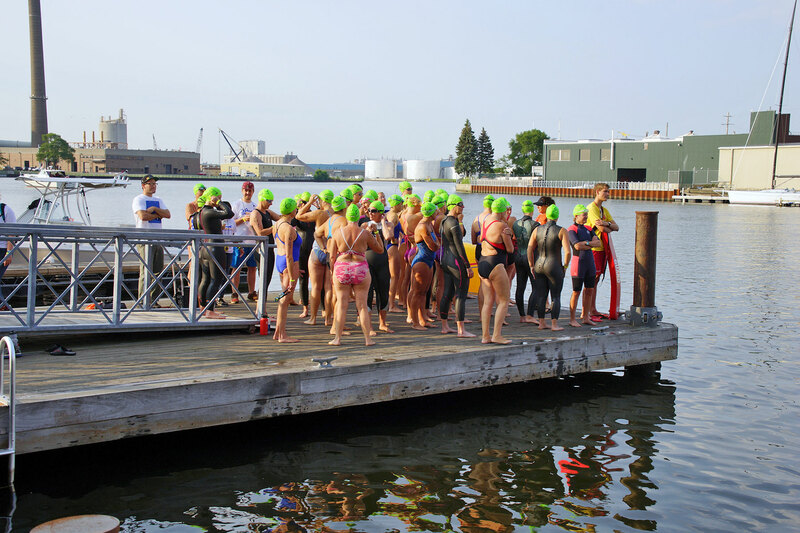 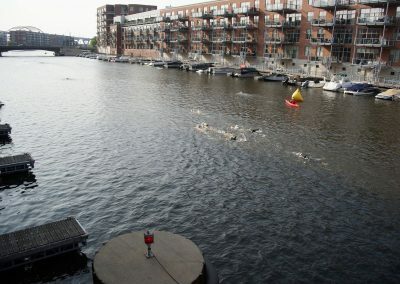 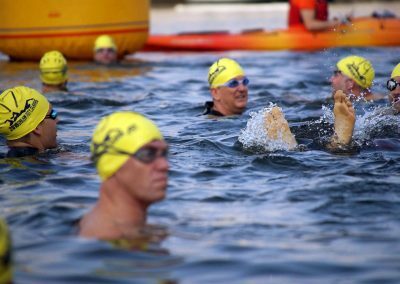 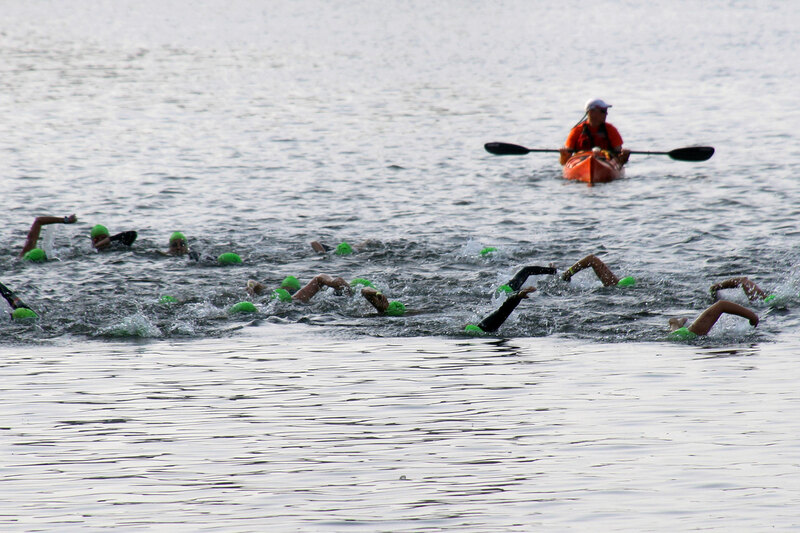 Swimmers who did not round the halfway buoy in 45 minutes could be pulled from the water per the discretion of the race director. 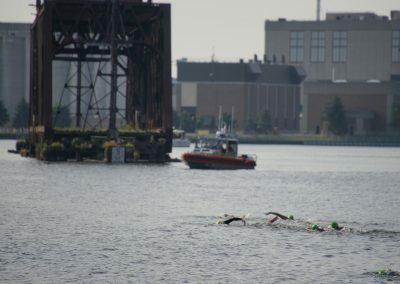 Boating access was restricted during the USMS sanctioned race by the US Coast Guard and Milwaukee Police. 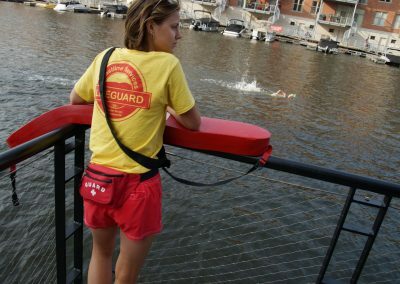 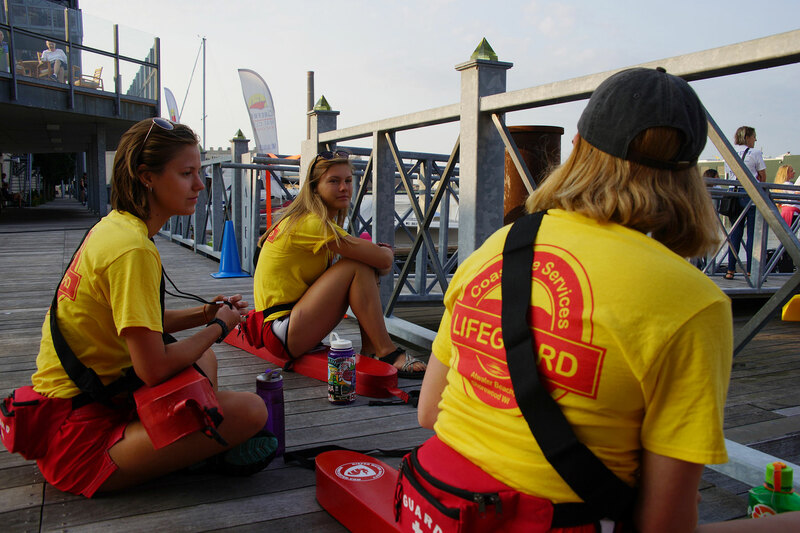 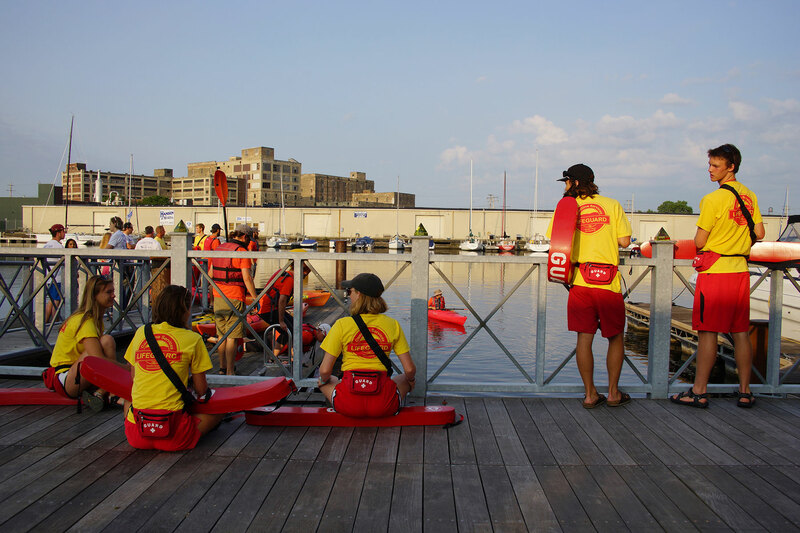 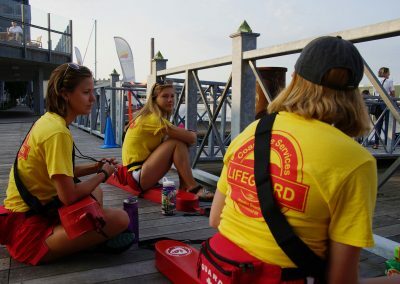 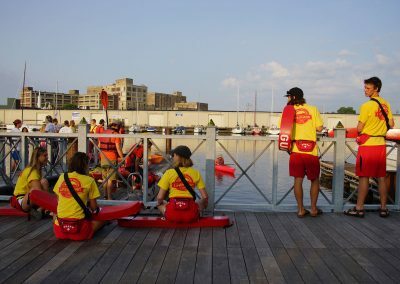 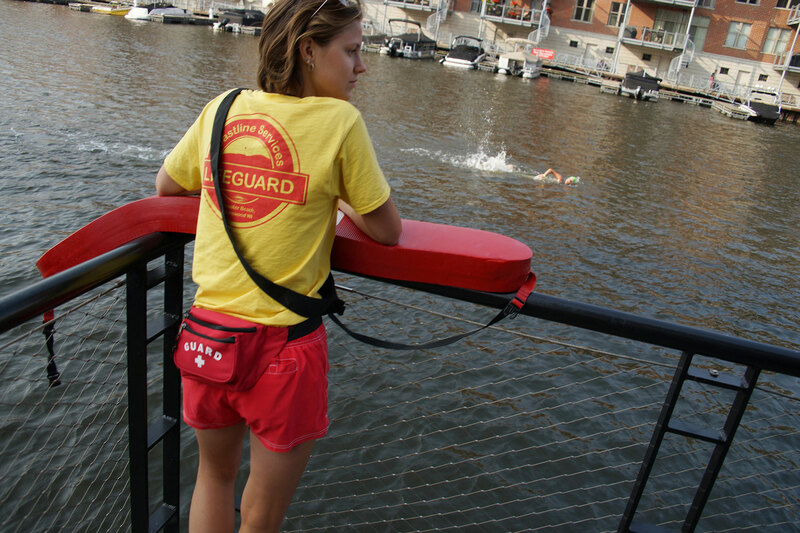 A Certified Safety Director oversaw lifeguards, safety kayakers, and EMT personnel. 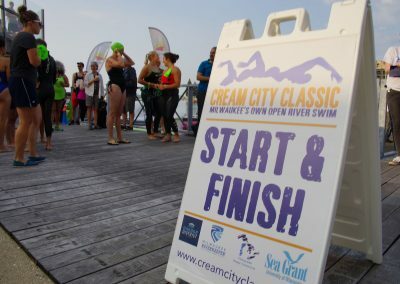 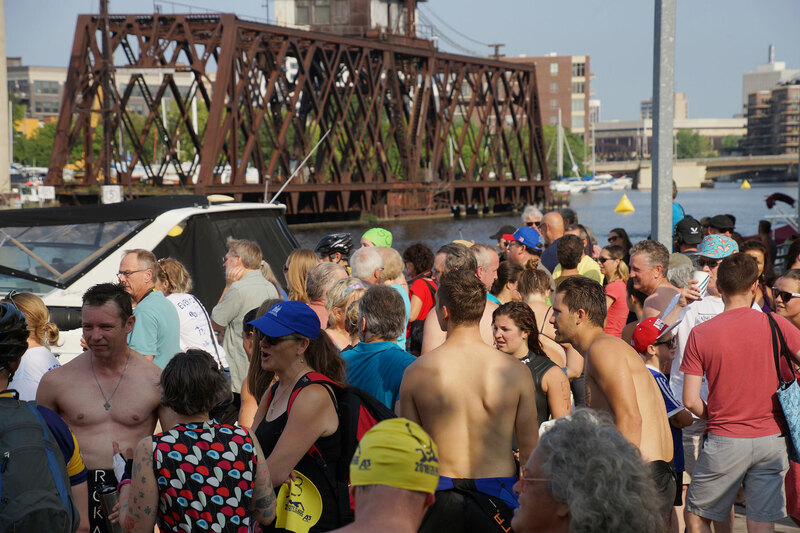 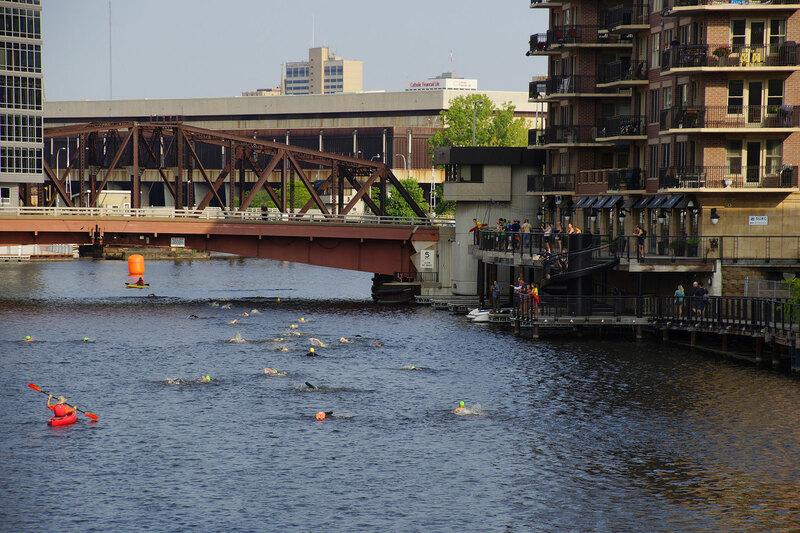 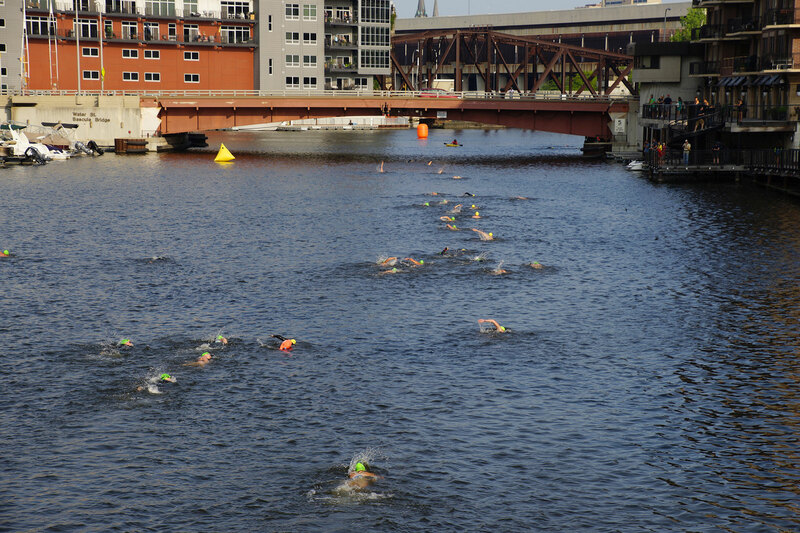 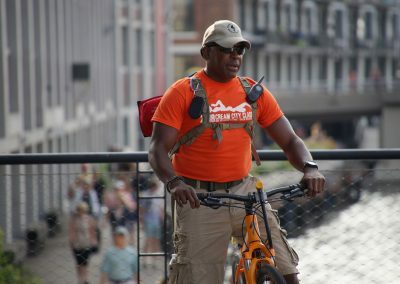 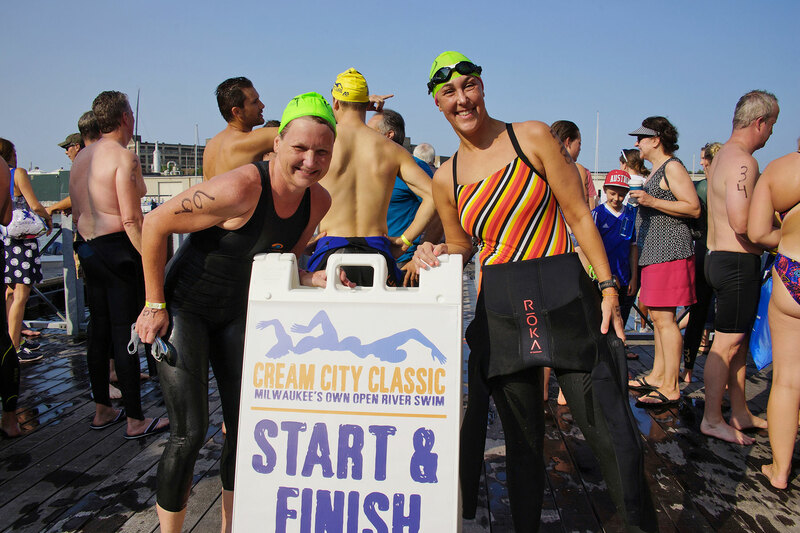 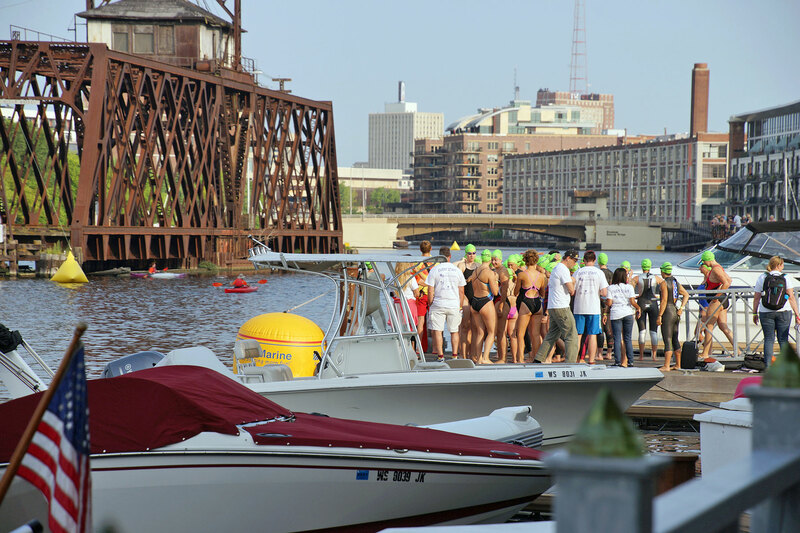 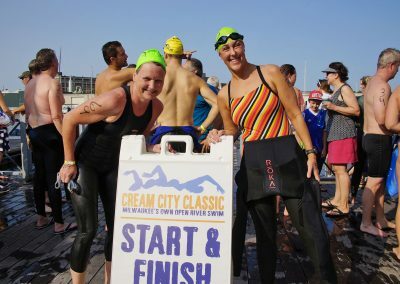 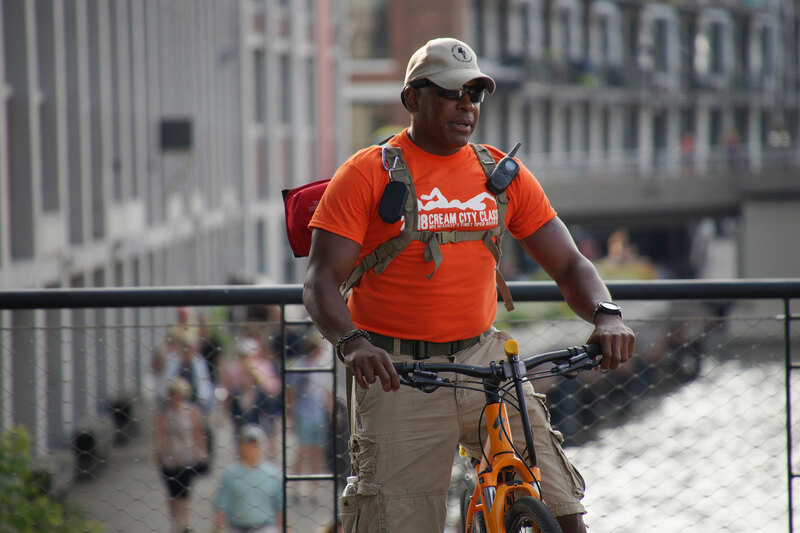 The Cream City Classic aimed to highlight current disparities regarding who can reasonably access and enjoy our city’s waterways. 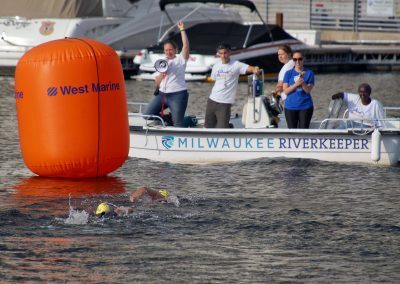 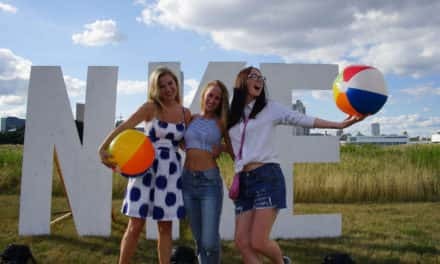 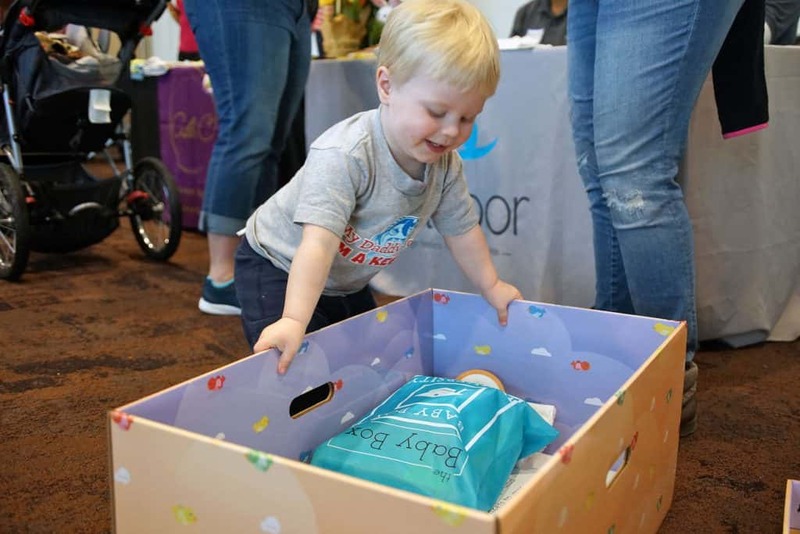 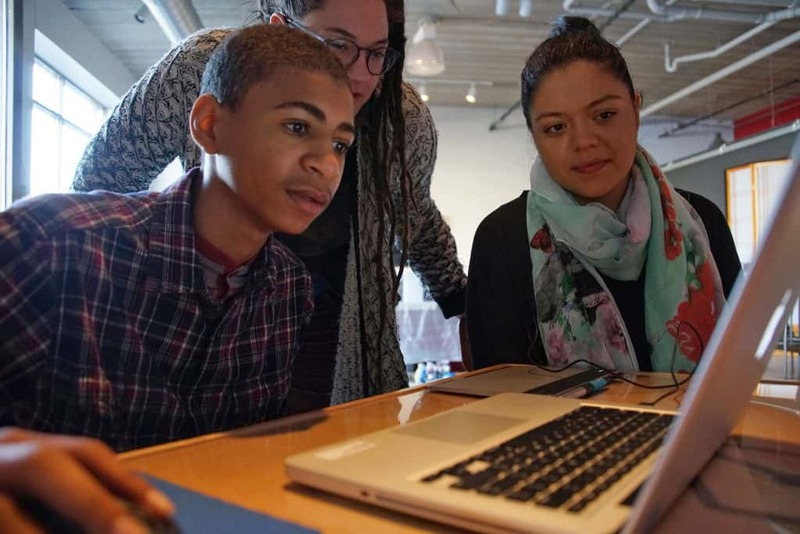 Organizers hope that future events will raise funds to provide equal access to pools and swim lessons for all Milwaukeeans.